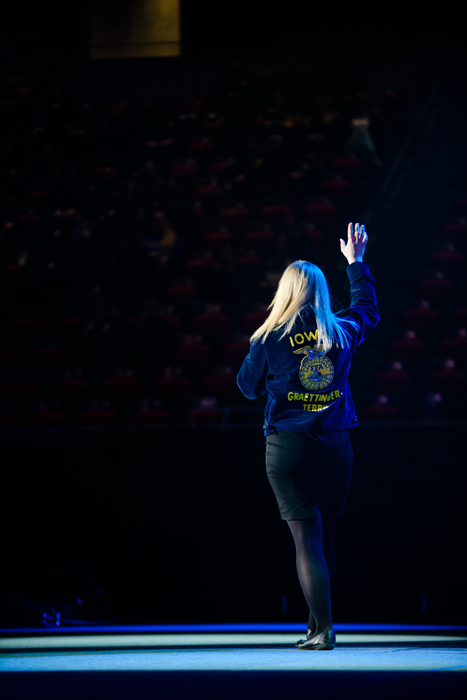 Check out this photo of Tori Hampson performing at the 91st Iowa State FFA Leadership Conference on Monday. Tori brought home the second place prize! 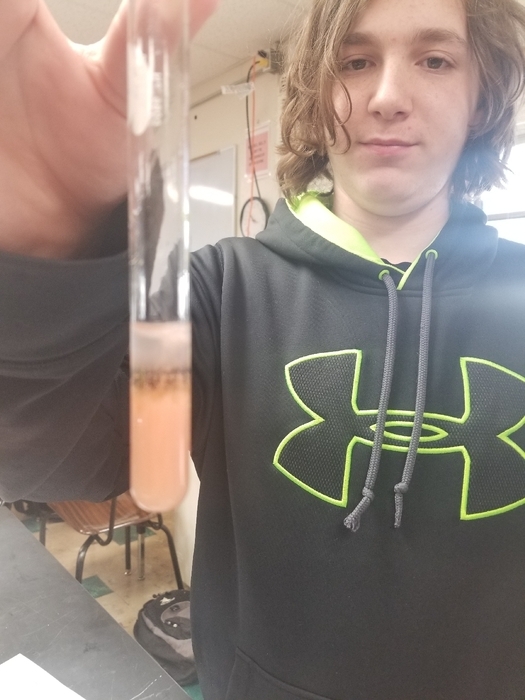 The results of the water filter engineering project are in and they were all fantastic! 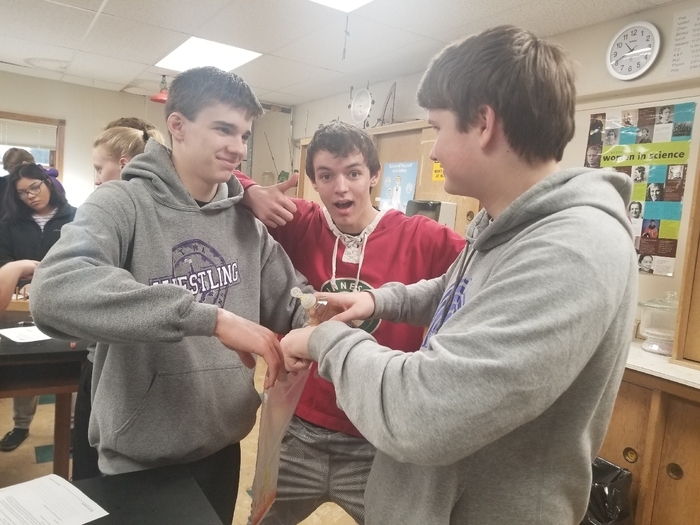 In fact, there was a tie for first place! 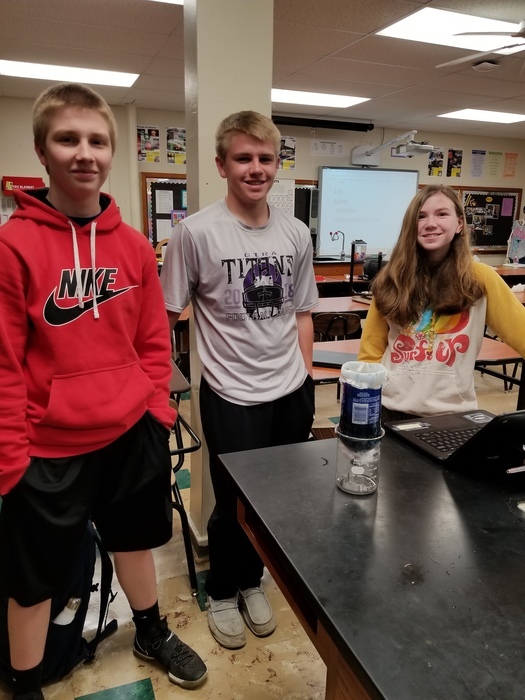 Congratulations to the team consisting of Drew, Jessie, Cormick, Karima - as well as Tanner - for designing and building the most effective filters! 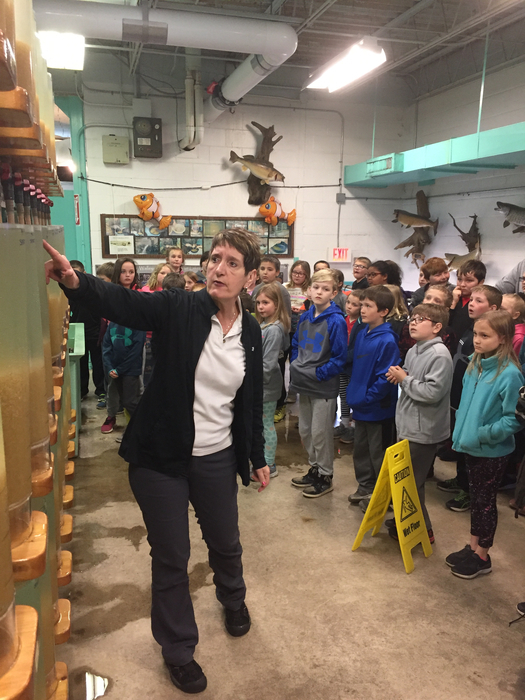 The GT 2nd and 3rd graders learned about the process of stocking our local lakes by visiting the Spirit Lake Fish Hatchery on Thursday morning. 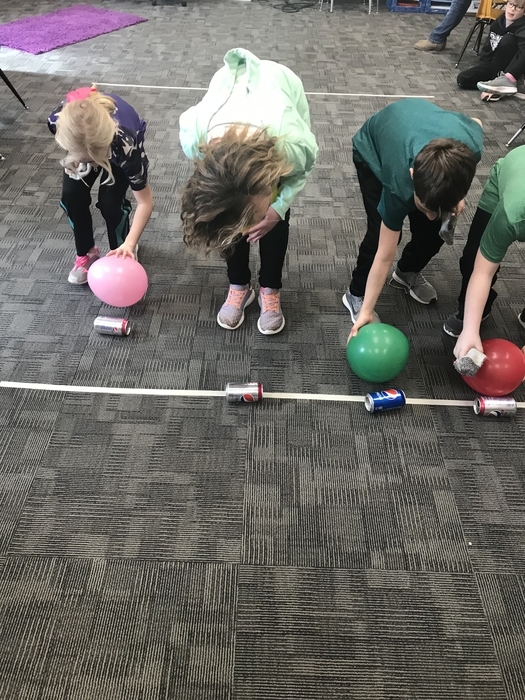 Second Graders are working on demonstrating their understanding of area and perimeter by creating obstacle courses as a team. 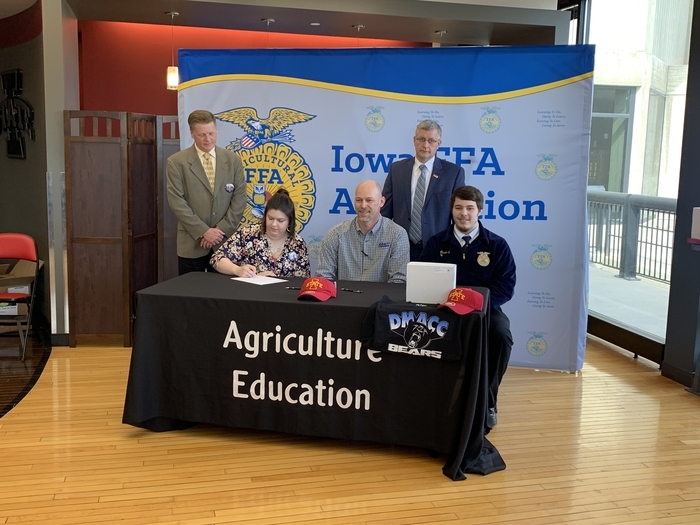 Congratulations to Nole Bochmann and Masen Fay on committing to teach Ag! 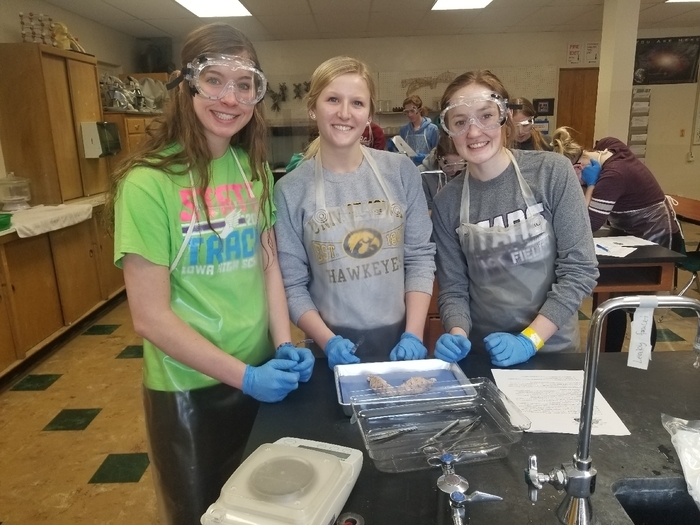 Ag teachers are needed across the state as many jobs remain open each year. 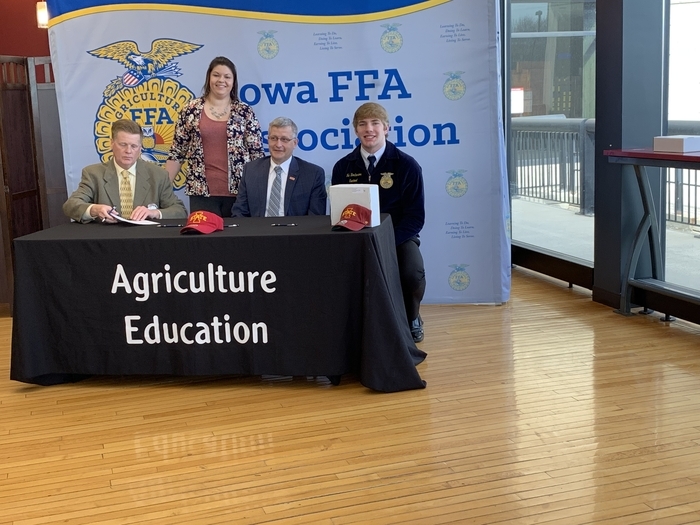 Nole and Masen participated in the Intent to Teach Ag signing at the 91st Annual FFA Convention in Ames on Tuesday. 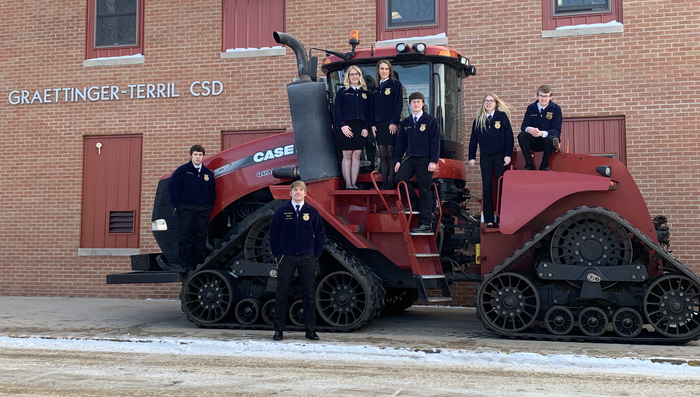 Congratulations to Kyah Brant, Jake Schumacher, Lucien Benedix, Carter Koenck, and Jessica Miller on earning their Iowa FFA Degree. Recipients walked across the stage in front of over 6,000 FFA members and guests to accept their award! 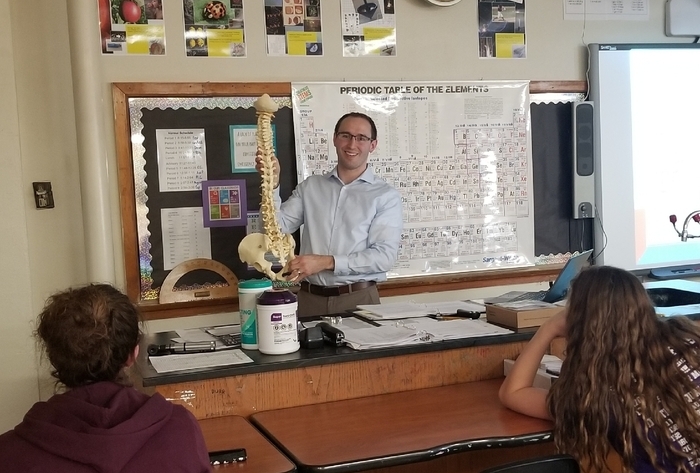 Thank you to Dr. Alex Helmich of Graettinger Chiropractic for speaking to the Anatomy class about muscles! 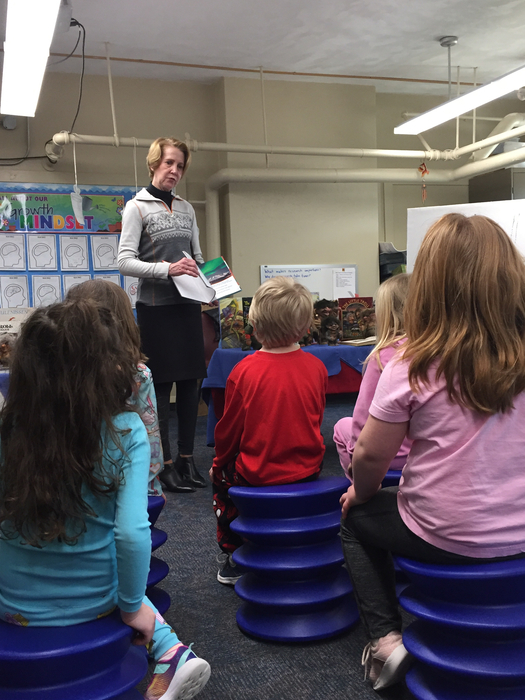 Our school is fortunate to have such enthusiastic and generous support from the community! 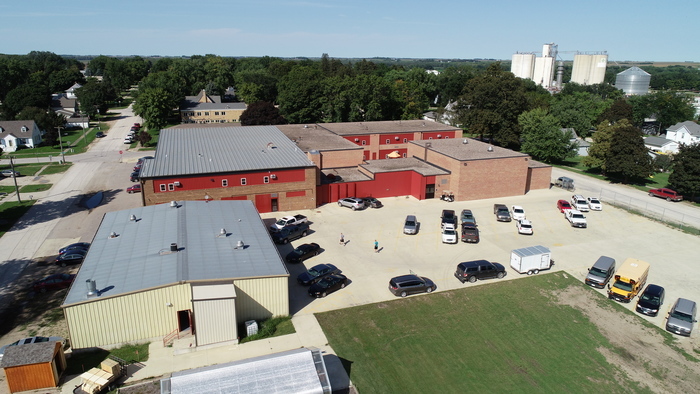 Here are a few updated pictures from our building project here in Graettinger! You can really start to see the outline of the building taking shape!! 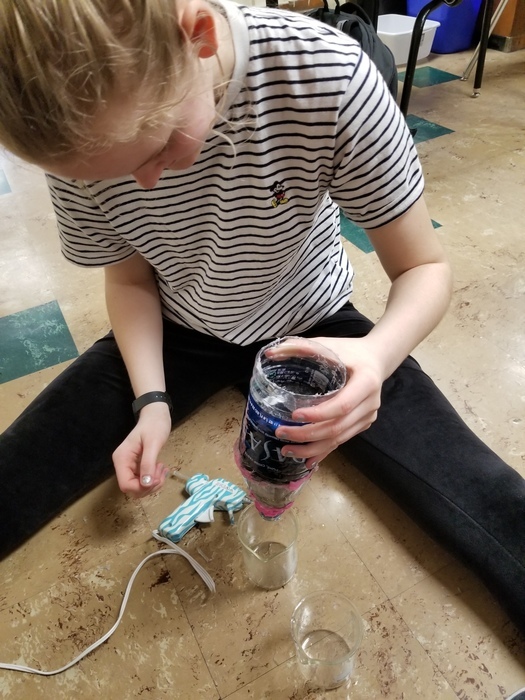 Unified Science is wrapping up their Hydrosphere Unit by engineering their own water filters. 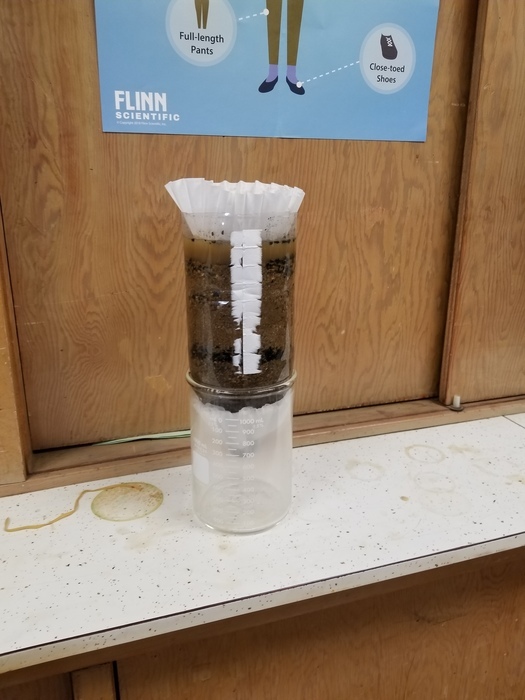 Polluted water was made and supplied for the class to run through their filters using common items. The filtered samples will be tested and the winners will be announced soon!! 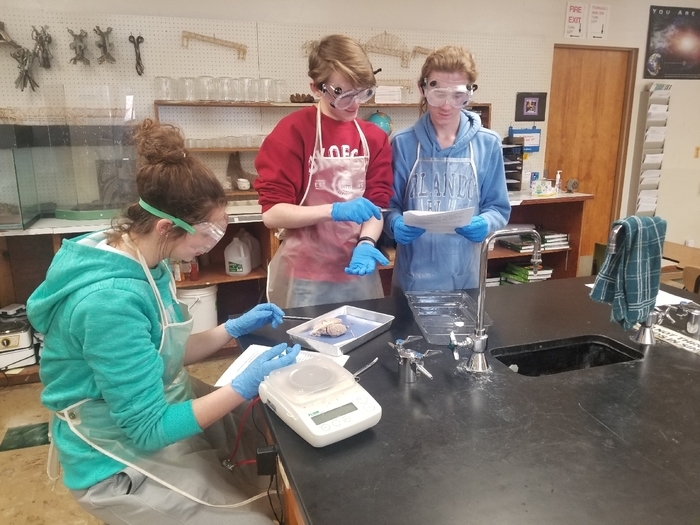 Chemistry students are performing gravimetric analysis involving the combustion of magnesium metal in air to synthesize magnesium oxide. 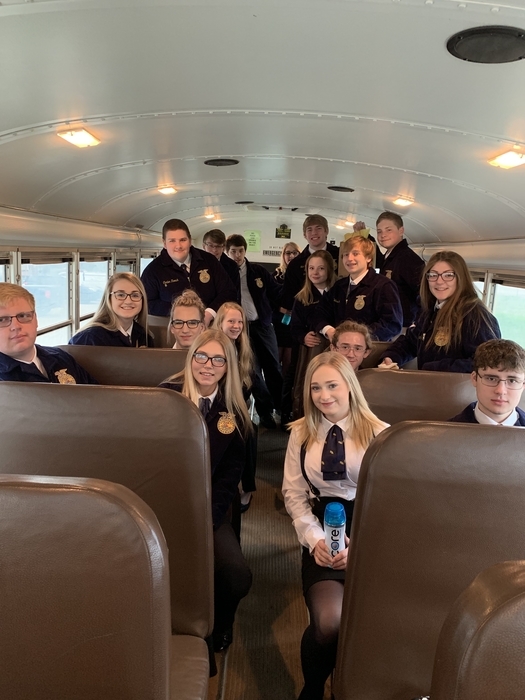 GTRA FFA members are ready for their first day at State FFA convention. Good luck to Nole as he is looking to ballot for NW State Vice President and good luck to Tori as she competes in the talent show! 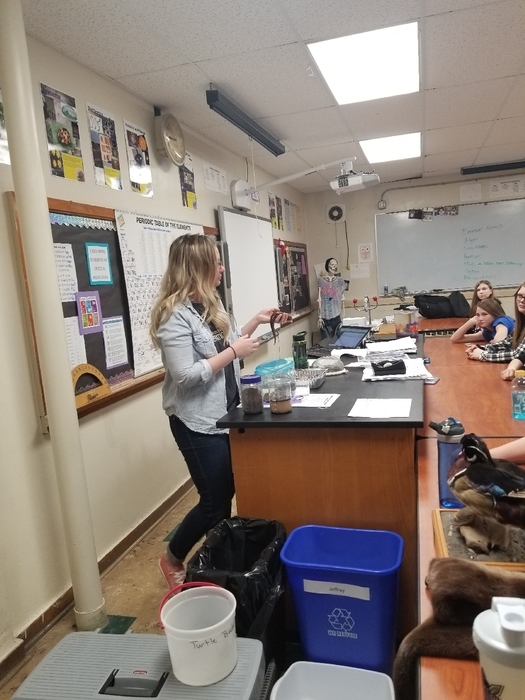 Thank you to Kaitlin from PAC for coming to speak to our students today! 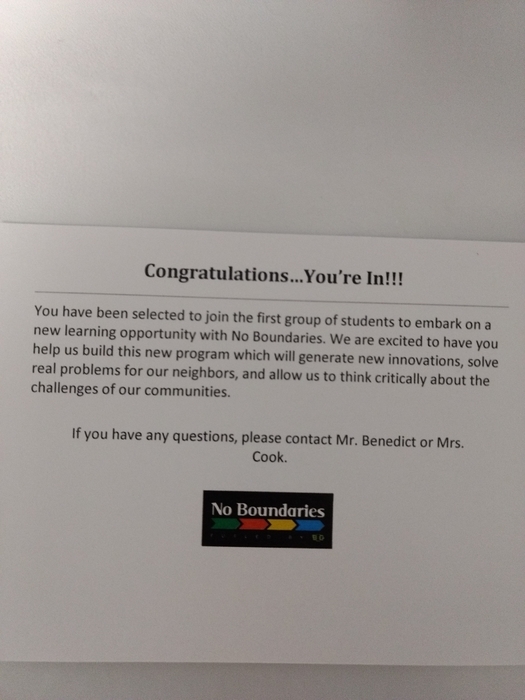 Students were notified of the selection to participate in the No Boundaries program for next fall! 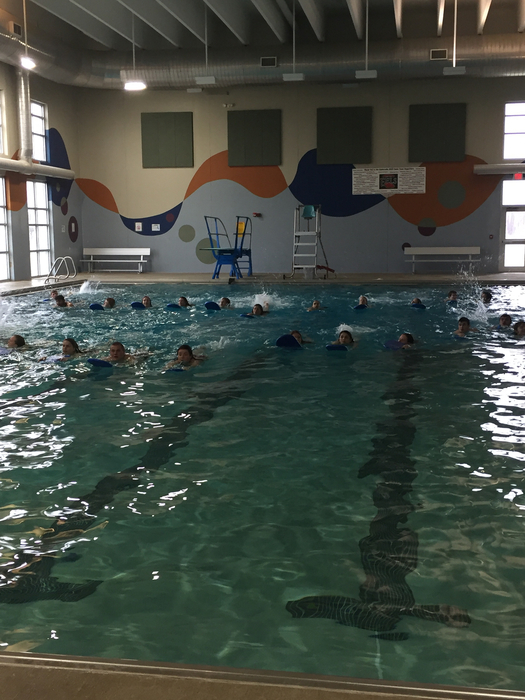 The water aerobics instructor is working the GTRA Track teams hard in the “kick” event. 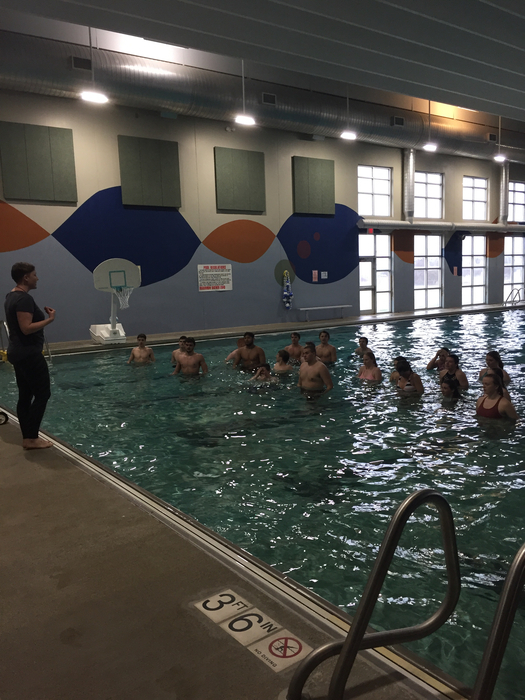 The lady and guy GTRA Track team gets a pool workout at the Regional Wellness Center in Estherville. The Center made arrangements so we could have the pool just to ourselves. Great replacement for a meet! 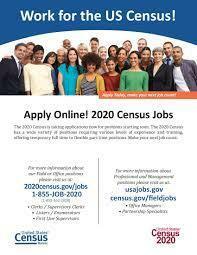 JOB OPPORTUNITY: The 2020 Census is taking applications now for late summer and fall jobs! There are a wide variety of opportunities with flexibility and paid training. 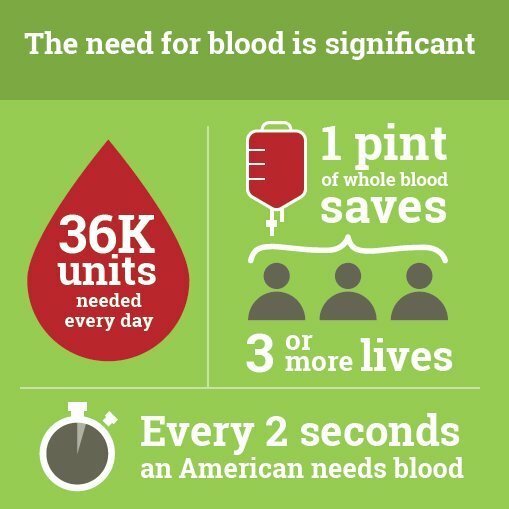 For more information, visit census.gov/jobs or census.gov/fieldjobs today! Due to inclement weather conditions, GT schools will be 2 hours late today April 11. 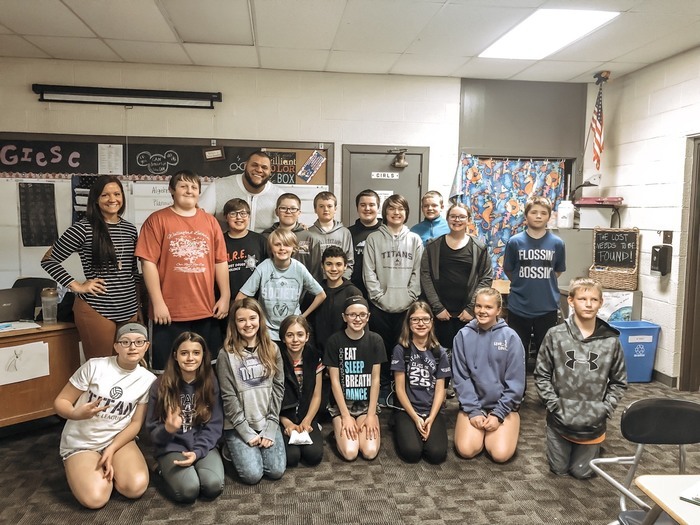 Bobby Jones stopped by to encourage the 6th graders to make good choices and put a strong focus on their education as they learned how to plot points on a coordinate plane in Math. This post is for the KIDS! 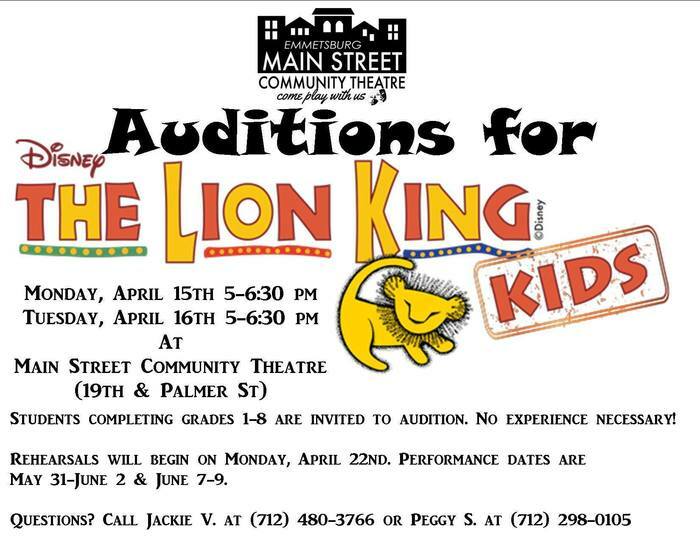 Main Street Community Theater in Emmetsburg will be holding auditions for The Lion King Kids on Monday and Tuesday, April 15th & 16th from 5:00-6:30pm. 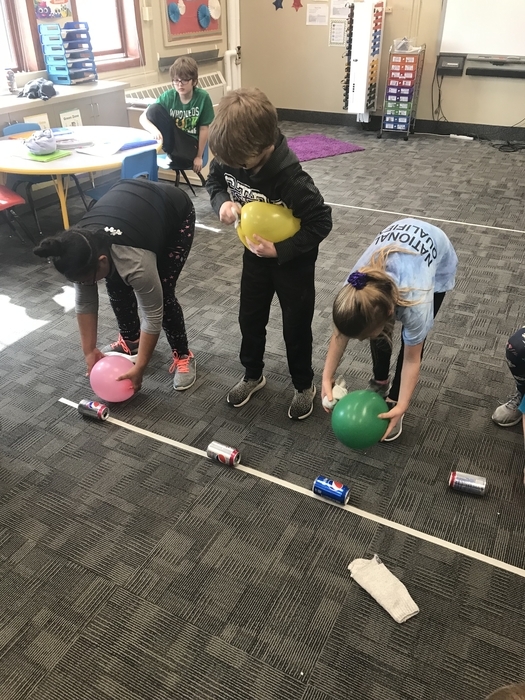 Math students are applying their knowledge of the relationship between volume, area, and height for prisms to make predictions for more complex shapes. 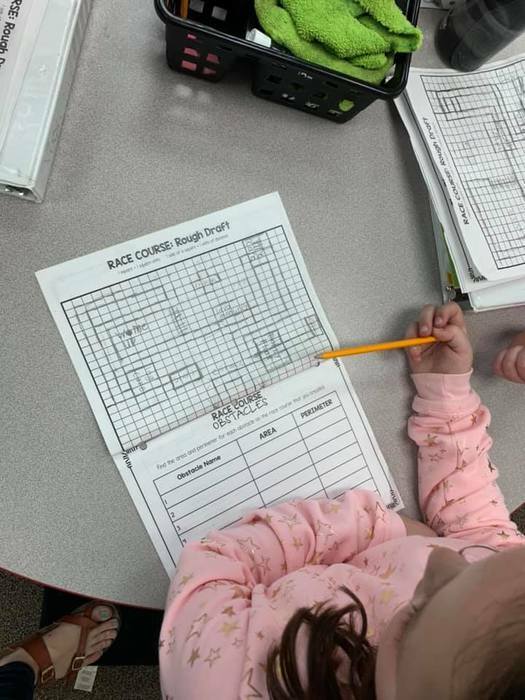 They are verifying their predictions by graphing the data they are collecting. 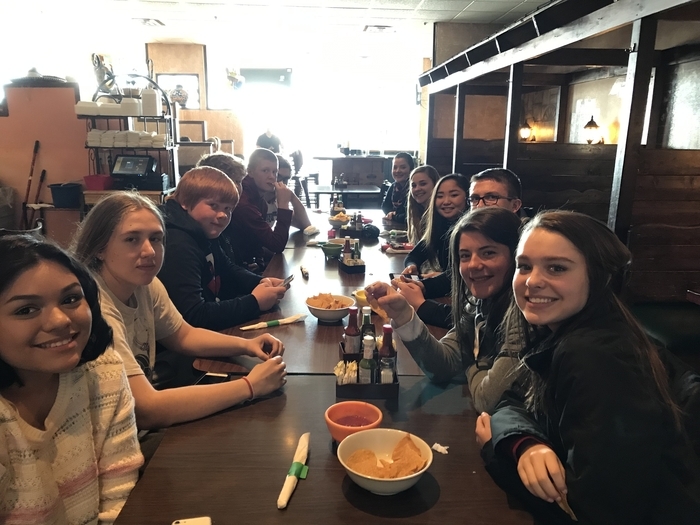 The GTRA music department was represented very well at the State Small Group Festival. 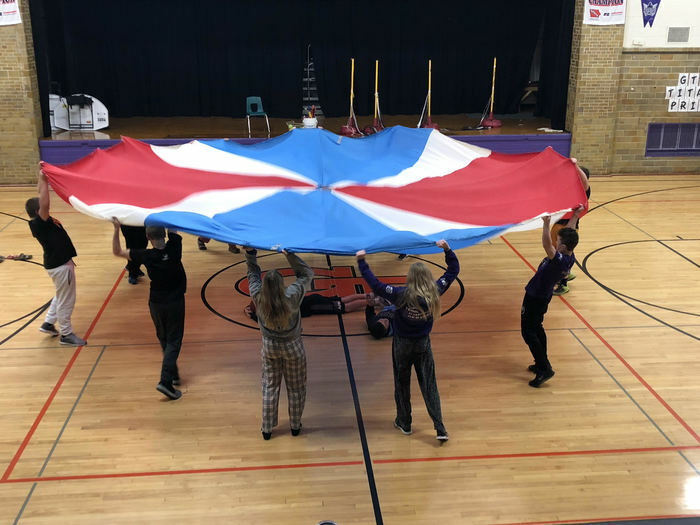 The band brought 7 events, and of those 7 events, SIX earned a Division I, "Superior" rating; and one earned a Division II, "Excellent" rating! Such a terrific display of musicianship, hard work, and artistry provided by our Titan Band!! Why was the angle freezing? It was less than 32 degreees. 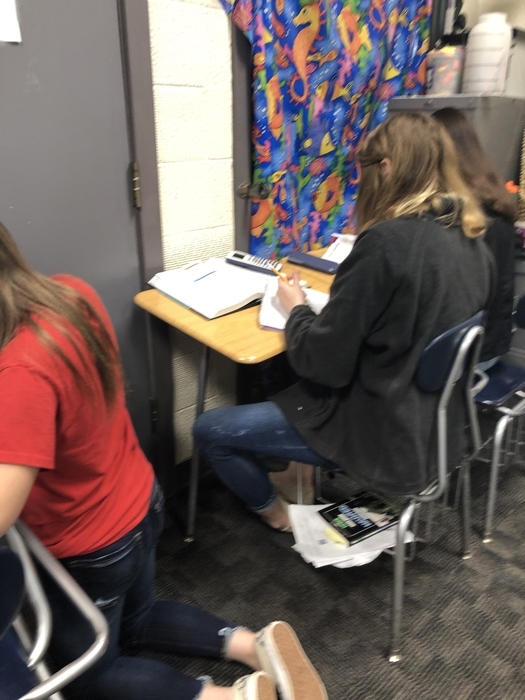 MS students utilizing #mathcorner to progress their skills and knowledge with angles while enjoying some dry humor from spectators. 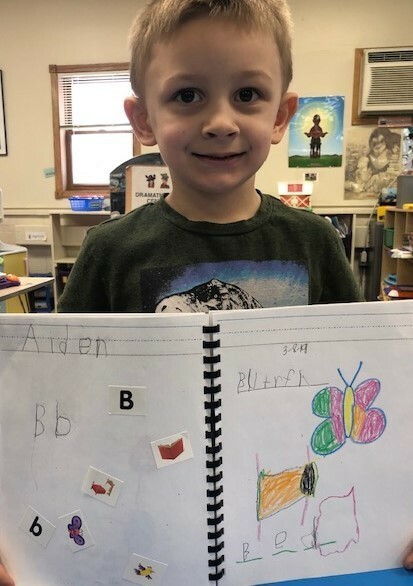 Preschoolers use interactive display to review their letters. 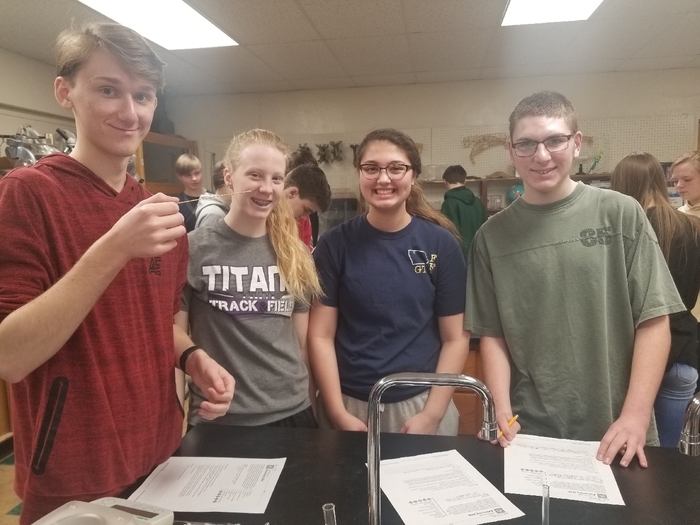 High school Biology students extracted the DNA from a strawberry today! 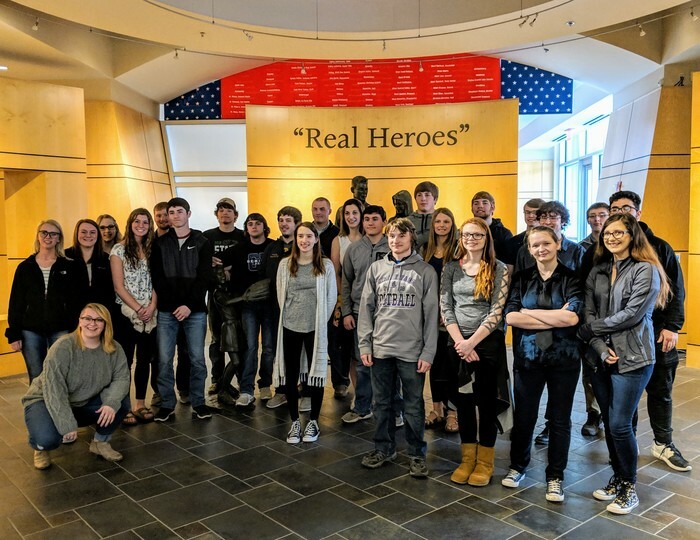 The GT/RA senior classes visited the Iowa Hall of Pride and the State Capitol on Wednesday. 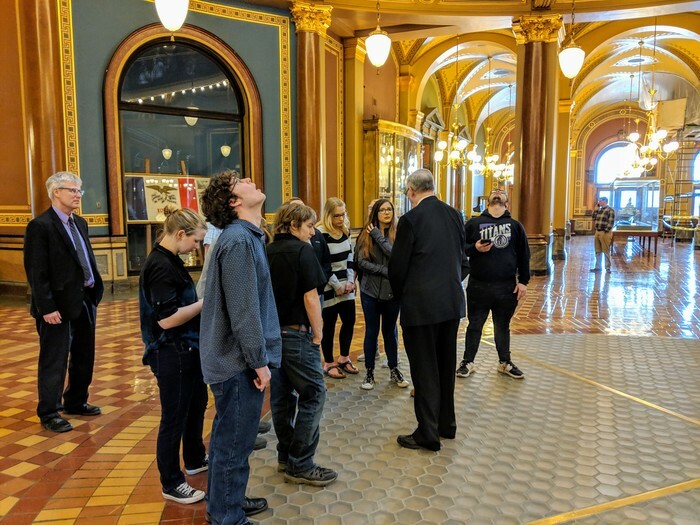 After celebrating many of the great achievements of Iowans, past and present, they were able to see where the political action in our state takes place! 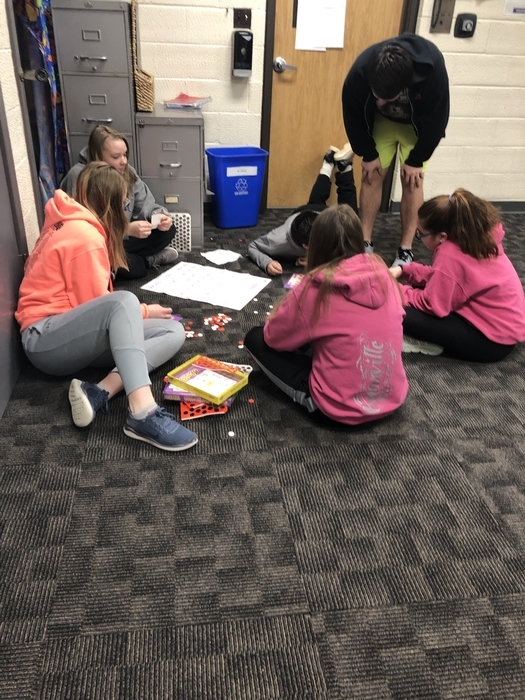 Advisory time used to practice and apply math skills in a heated game of MATH BINGO! 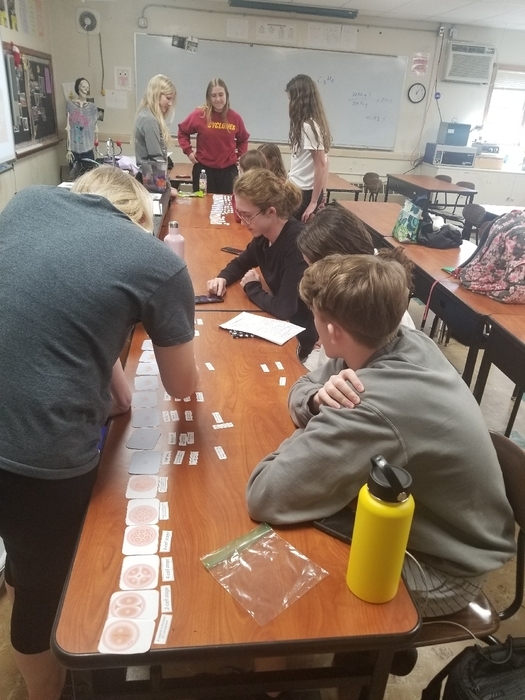 From guest speakers to lab activities to organizing the stages of fetal development, the students in Anatomy & Physiology are working hard during their Reproductive System unit! 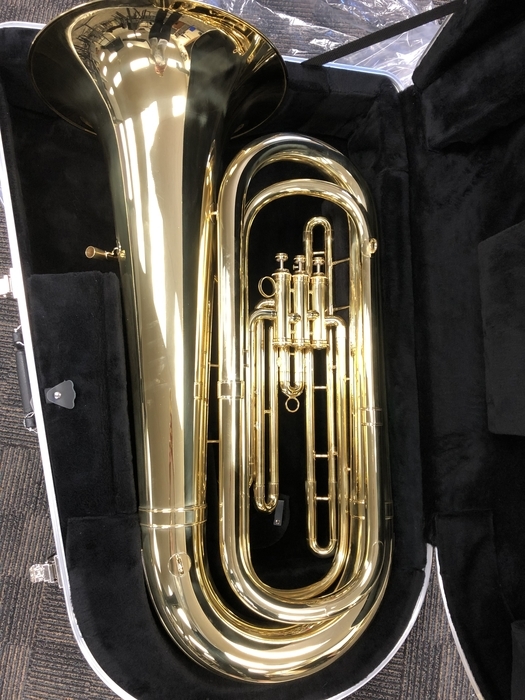 A BIG thank you to the GT school board for the purchase of our brand new tuba!! We are thrilled to have such a beautiful and sonorous instrument for our band. 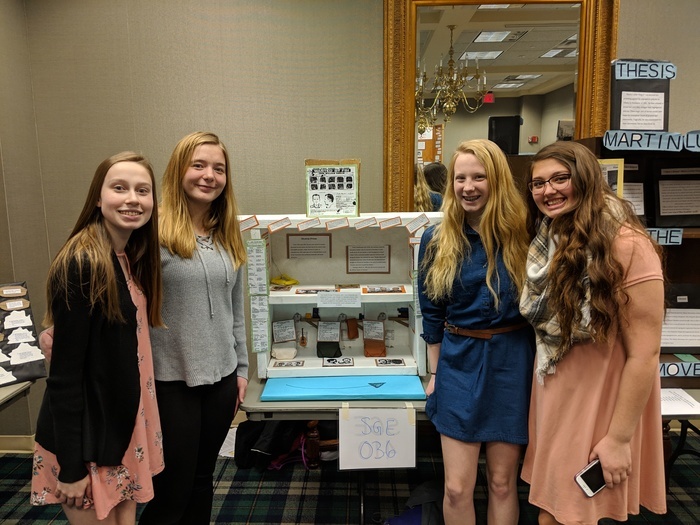 Congratulations to Informal Geometry as they wrap up their scale model projects! The results have been great! 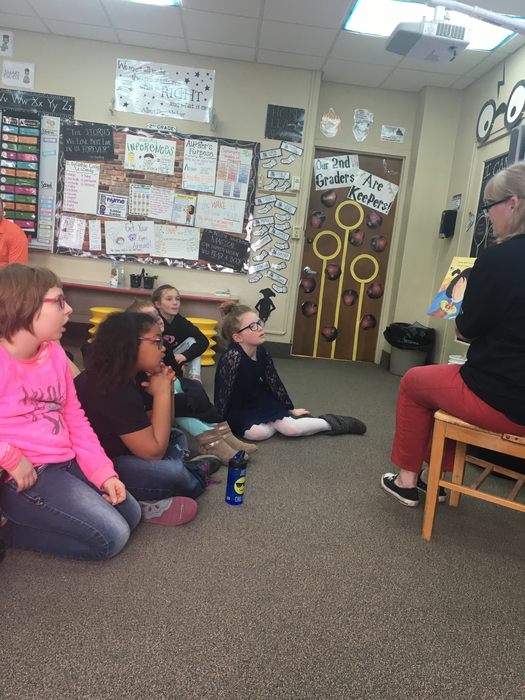 Read aloud is still, and always will be magical. 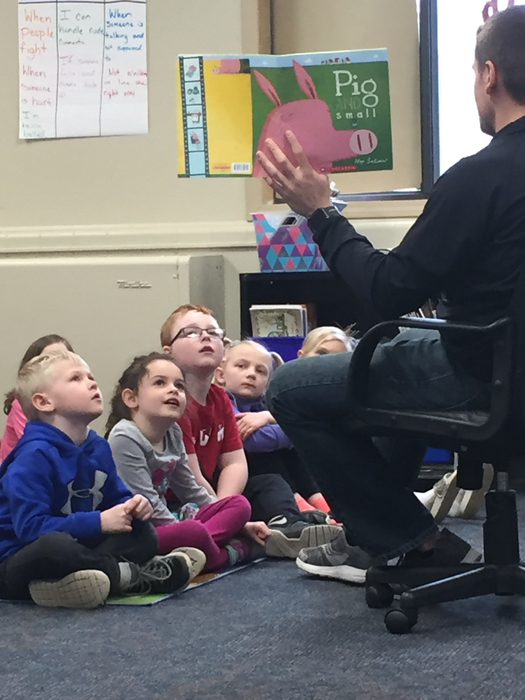 Mr. Girres is reading “Pig and Small”. 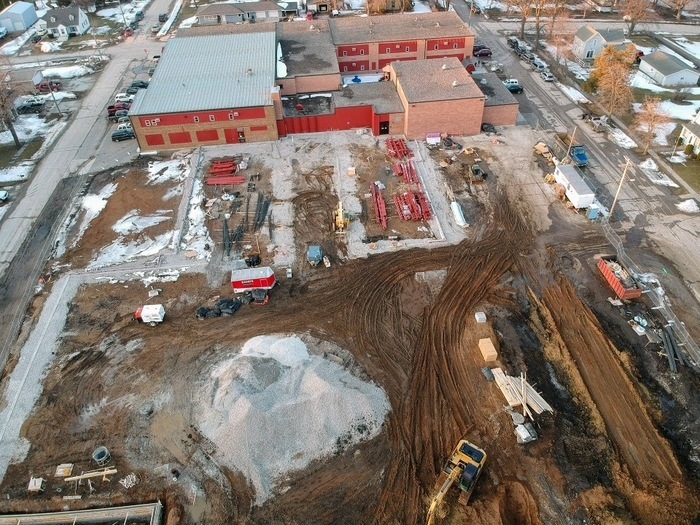 As the snow melts, progress is shown on the school addition. It's really starting to take shape with most of the footings in place! 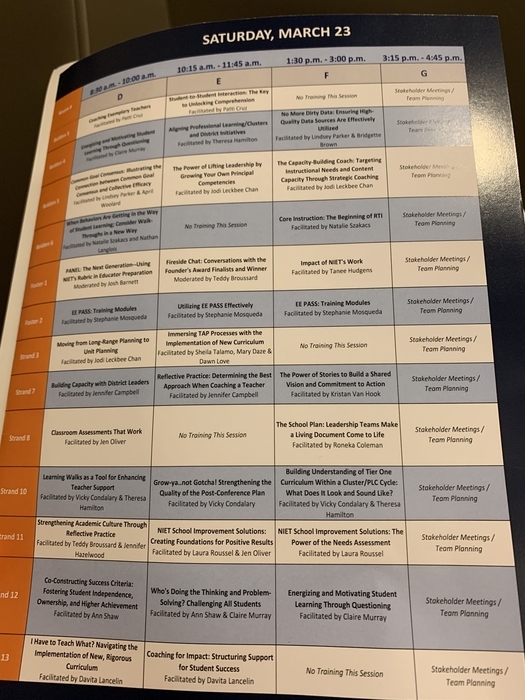 Day #2 of learning for the G-T/R-A Teacher leadership team in New Orleans! 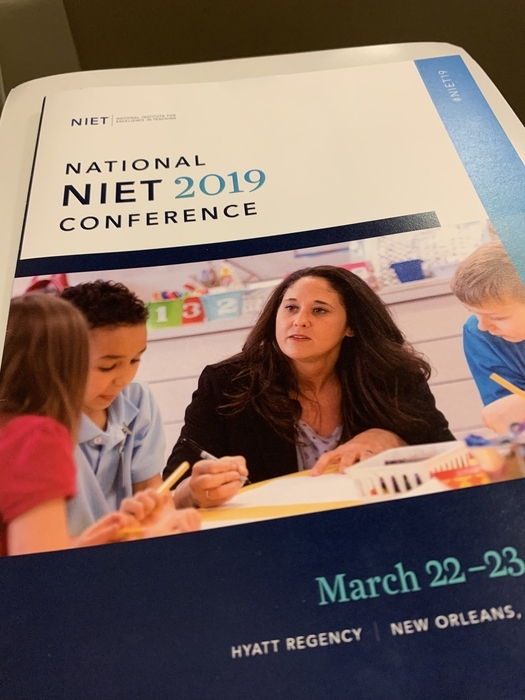 Our teacher leaders are continuing their learning related to the NIET TAP model. Teachers are ready to get back to school and put our new learning into practice!! 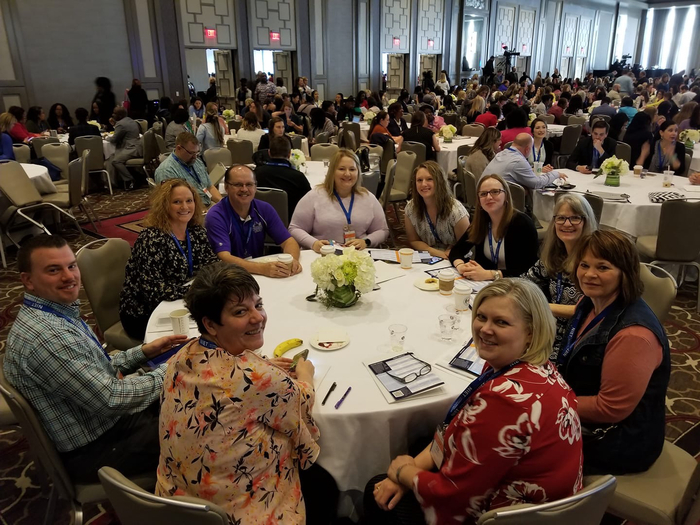 G-T/R-A Staff ready for 2 days of learning in New Orleans at the NIET National Conference!! 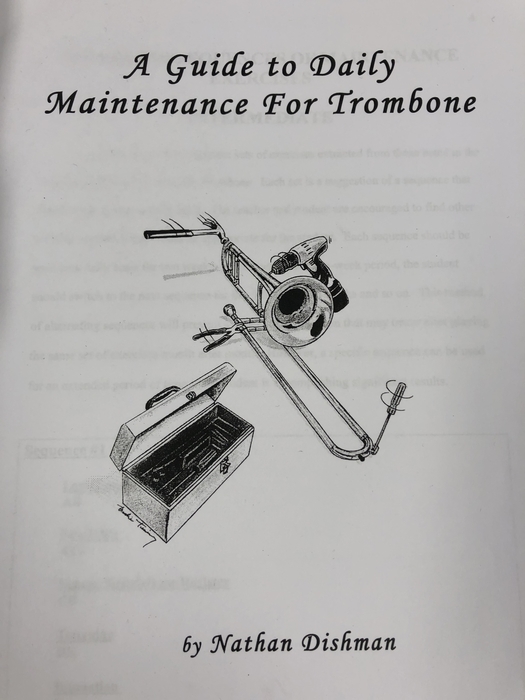 Dr. Nathan Dishman, Assistant Professor of Trombone from Iowa State University came to the GT band room this week to give a clinic to our 5-12 trombone players. 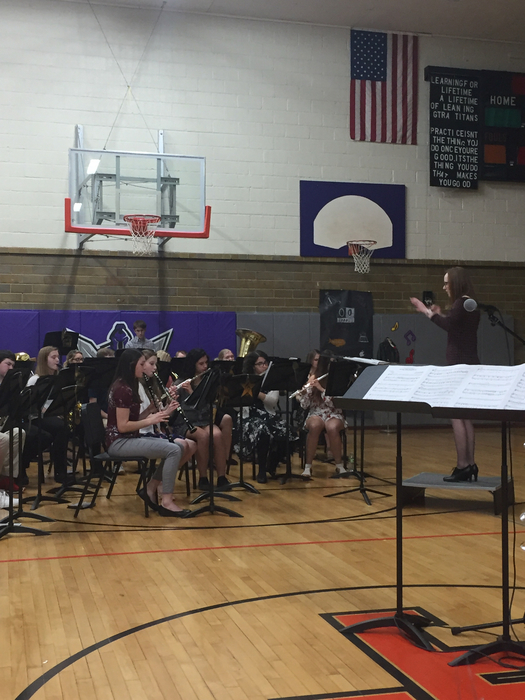 What an awesome experience for our young musicians! 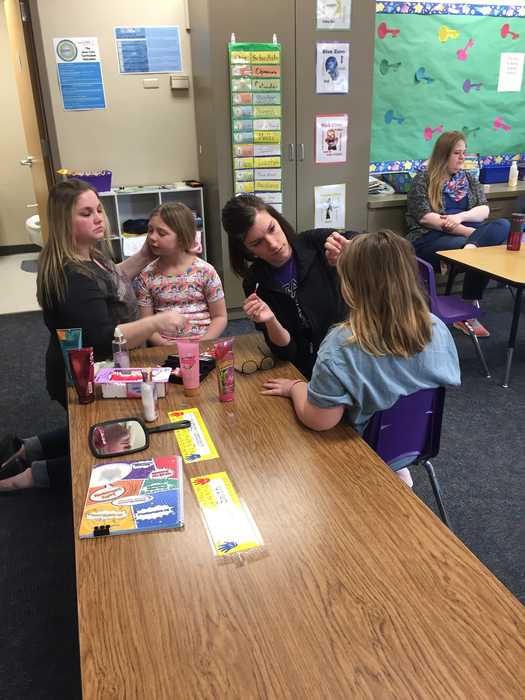 More PBIS Celebration fun at Terril Elementary. 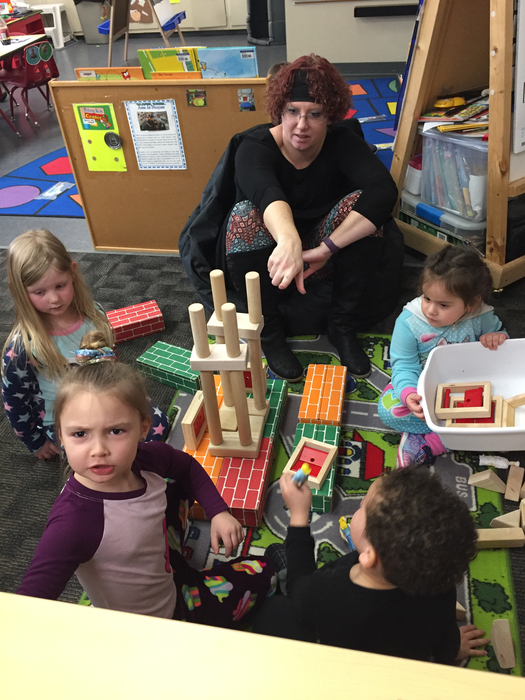 STEM activities of building a complicated maze with geometric shapes and tallest tower with Wki Stix. Thank you Sara and the folks at Country Maid in West Bend for the great tour today! 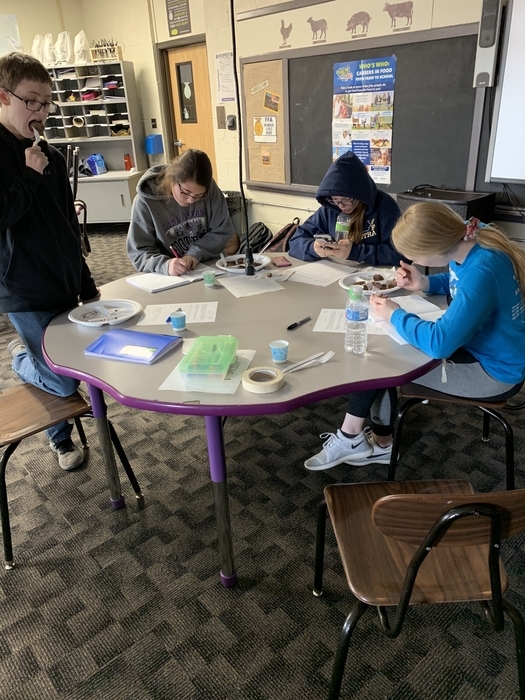 As an extension to our breads unit, the Foods 2 students learned about the local company, how they make the products we all love and even got a sneak preview at new items they hope to market! 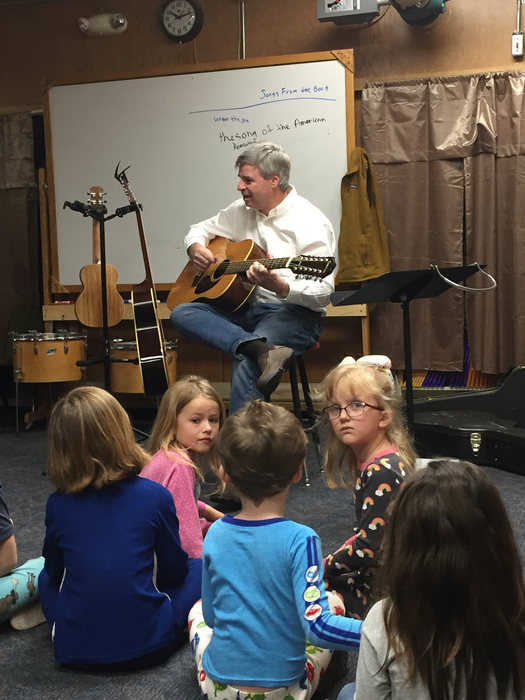 A musician and an author have time with kids at Terril Elementary during our PBIS celebration. 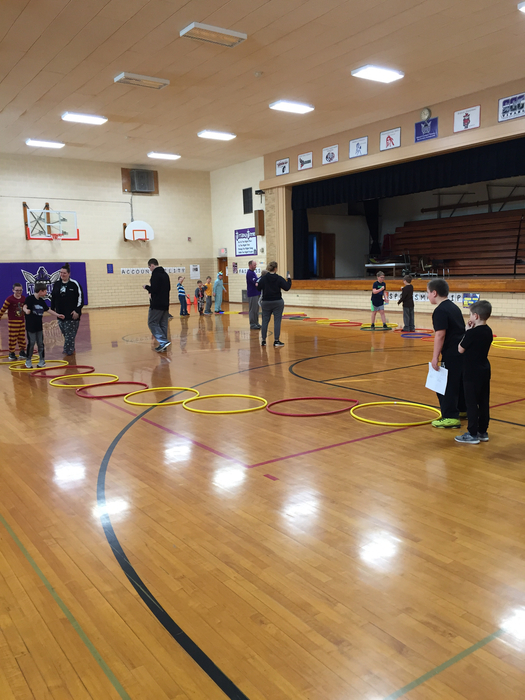 PBIS Activities continued. Here the kids receive some “spa time” with volunteers, and the “Littles” (PK) have some free play. 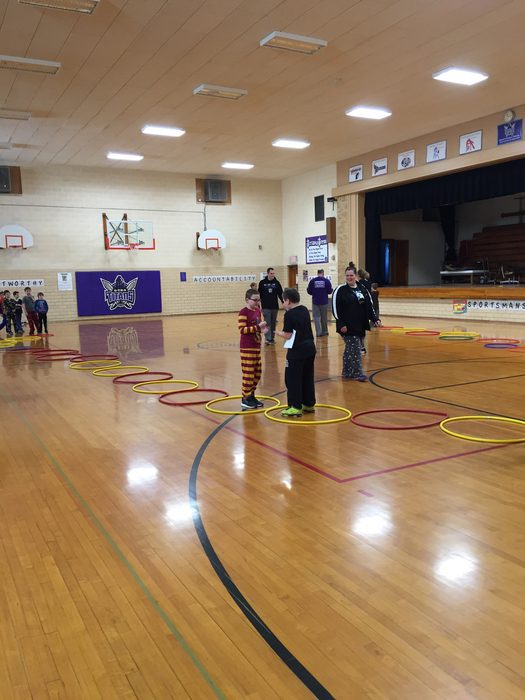 More PBIS Celebration day activities. 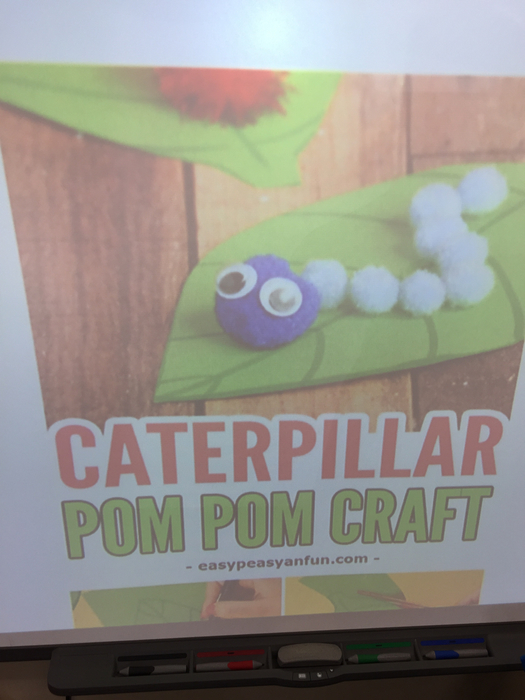 Here the children are doing a craft. 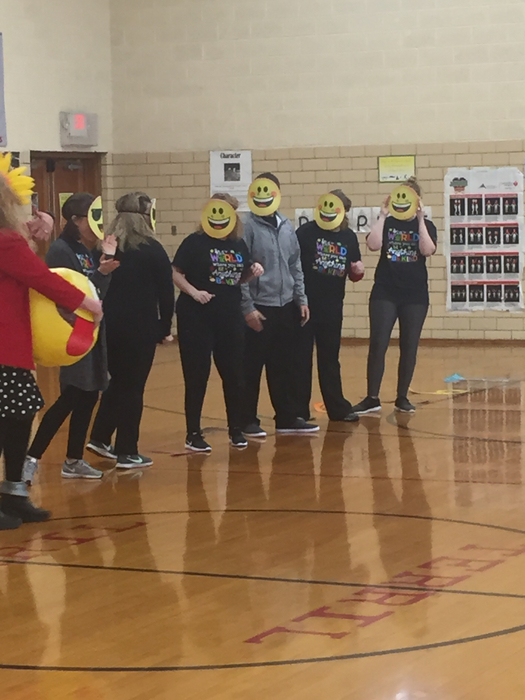 PBIS celebration day at Terril Elementary. 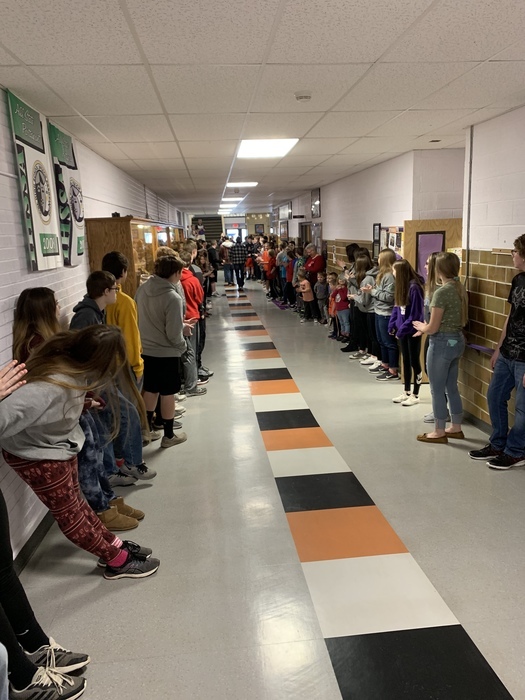 Here the kids hop toward one another and when they meet, they do Rock, Paper, Scissors to decide who gets the right of way. The winning team is the one that gets a person all the way across. Buses will return to regular routes in the morning 3/20. Thank you for your patience. Please let us know if there any lingering issues with your gravel road. 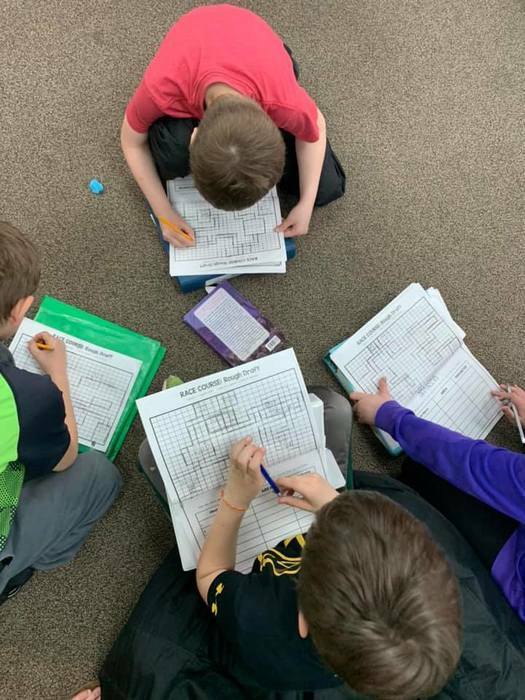 In 3rd grade, (as well as our other grades) thinking and working out math problems is done in small “Guided Math” groups. NOTICE - Graettinger-Terril CSD School buses will continue to travel on hard surface roads only until further notice. 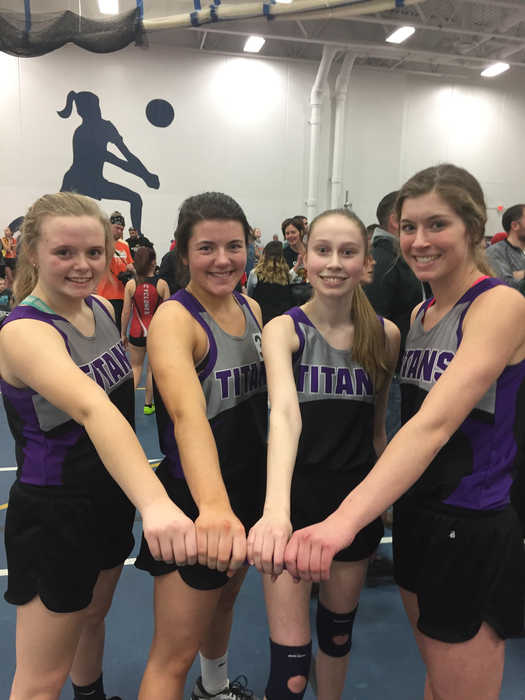 The Lady Titans track team was represented tonight at the BVU Elite indoor by 4 of our most seasoned runners. 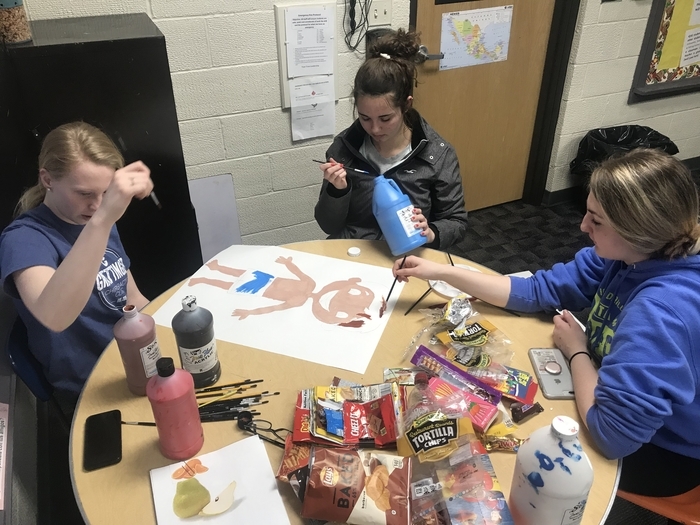 Toni Alesch, Claudia Hall, Sierra Kluever and Maddison Hough. They ran the 4X200 together. Sierra, Toni and Maddison 60 M dash and Maddison shot put. Great work! 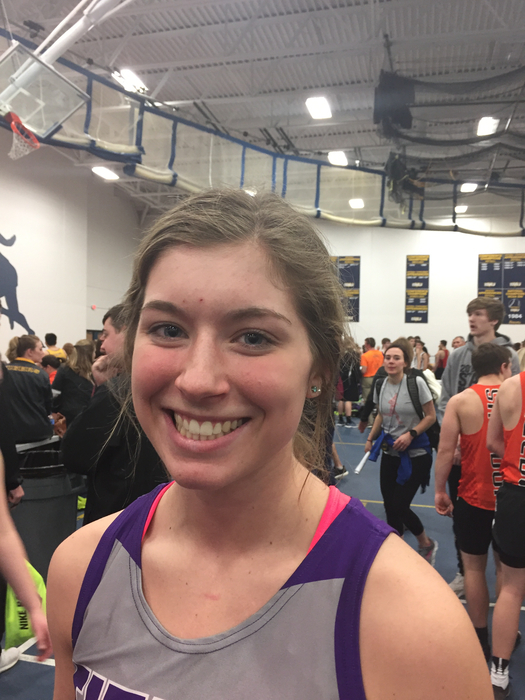 First hardware of the ladies track season goes to Tony Alesch in the 60 M dash with a 8.28 for 1st place. 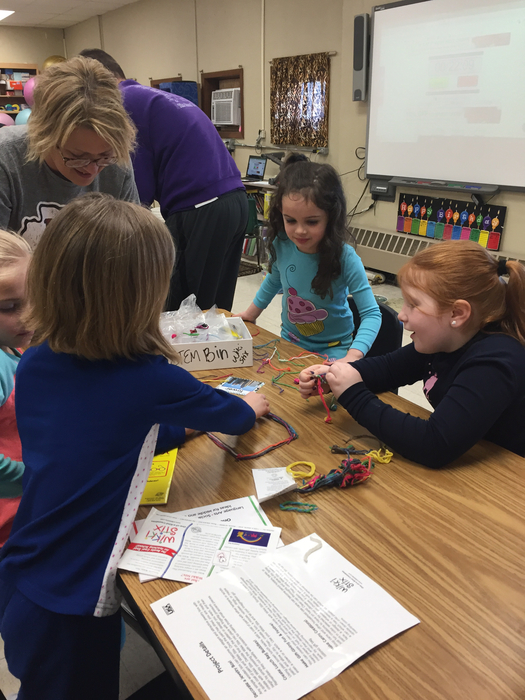 3rd graders learning about static electricity. 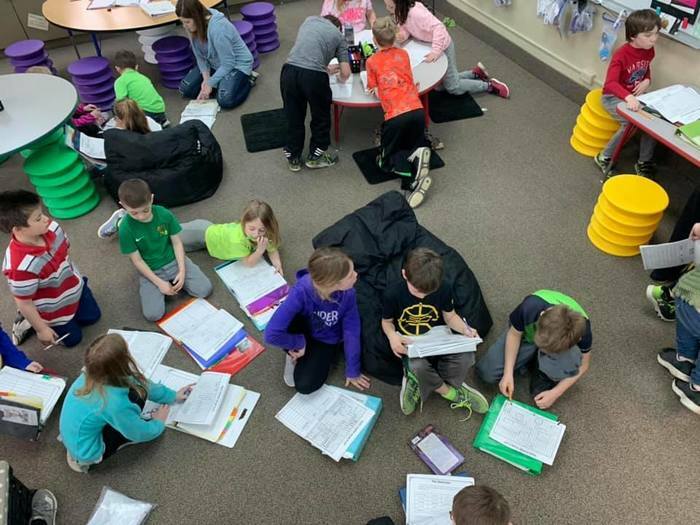 Third graders working on an activity to show that they know the difference between consumers and producers. Congratulations to the GTRA high school music department on a terrific concert! I am overwhelmed by all of the support and talent we have in this community. 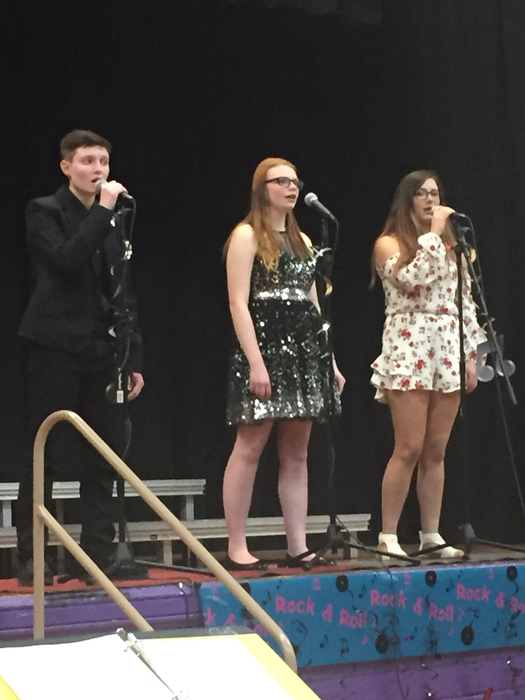 And a big thank you to the GTRA Music Boosters for all of their work in making Thursdays Pops Concert such a roaring success! 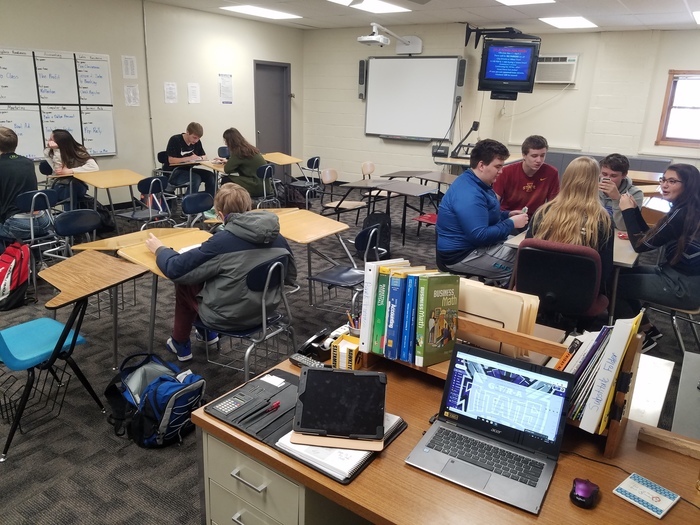 Introductory Business students finishing up their Personal Finance Unit. 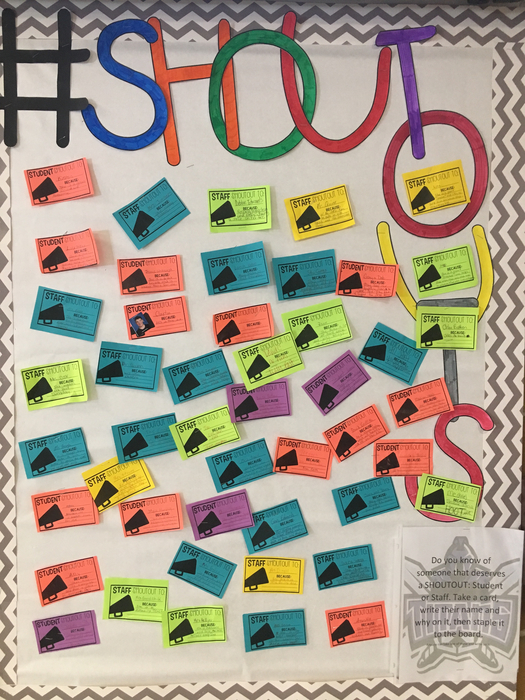 As an extension of learning about the pros and cons of credit cards, students researched and chose their own. They then had to evaluate their choice based on interest, fees, cash back, rewards, etc. 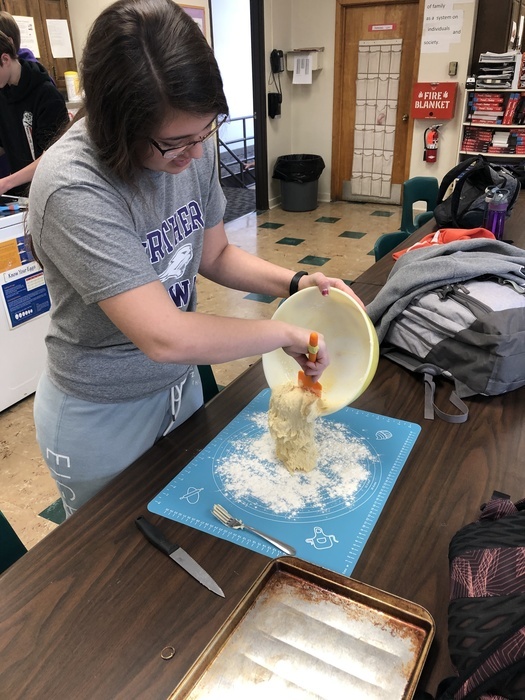 The Cultural Foods students wrapped up their study of French cooking by preparing meals from Julia Child's "Mastering The Art of French Cooking". 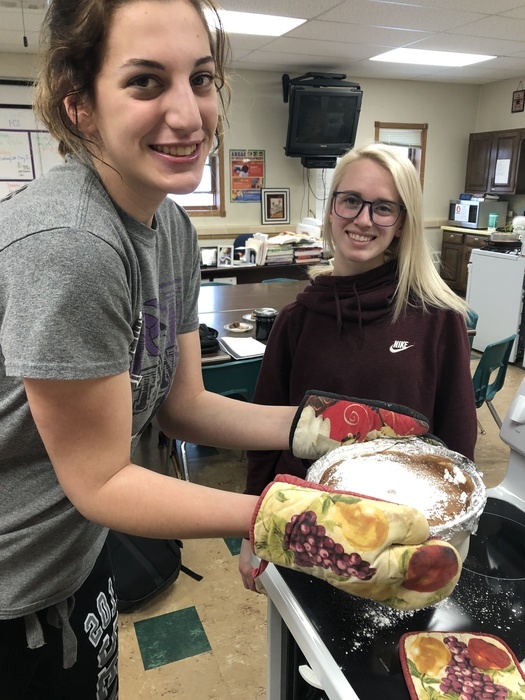 Kady and Hailey prepared a Chocolate Souffle. 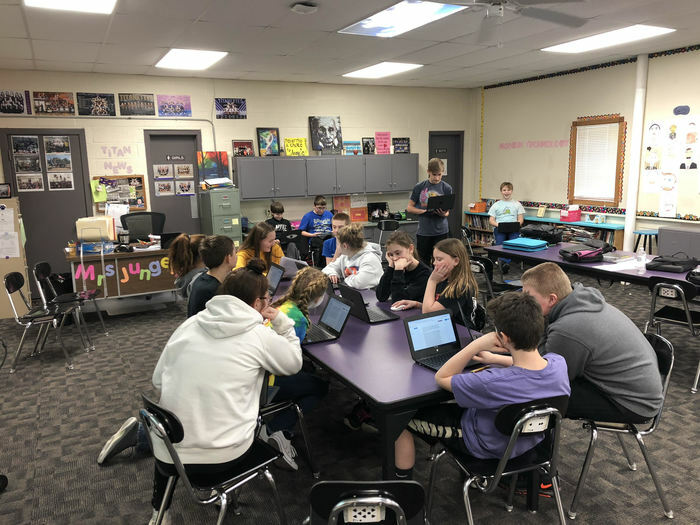 6th graders are learning how to properly debate in Mrs. Jungers' ELA class. 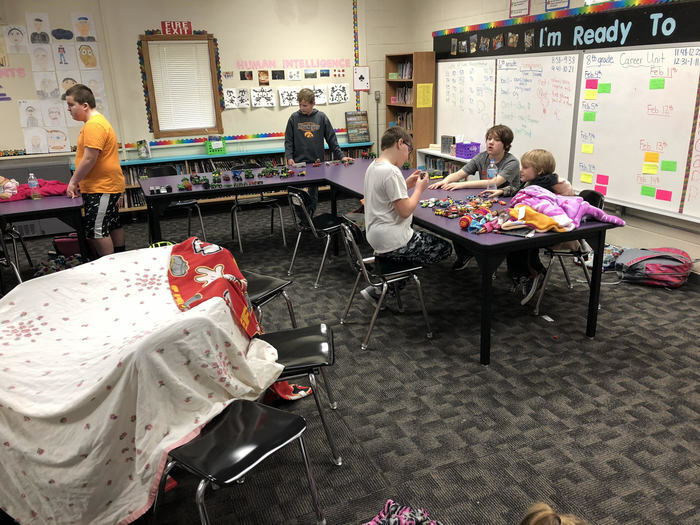 They learned how to collect evidence, prepare their statements, and rebuttal. They practiced with the topic "Should Kids Be On Reality TV." Graettinger-Terril School buses will operate on hard surface roads for the remainder of the week. We are in the process of contacting parents. 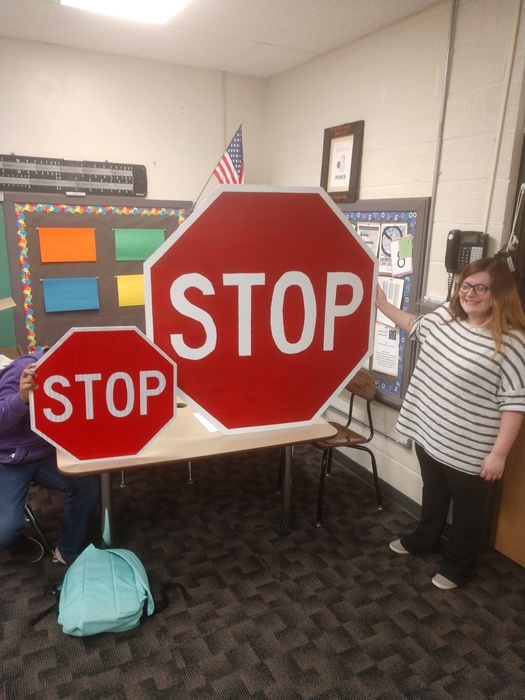 If you have not been contacted, please contact the school. Reminder - We will not be getting out of school early on Wednesdays for the remainder of the year. We WILL still have early outs next week (3/19 & 3/21) for conferences. 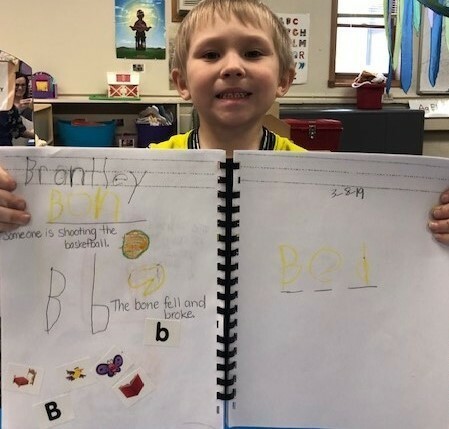 Preschoolers sound out words in their journals. It has been a long winter, but as you can see, there is still progress being made on the Graettinger addition. 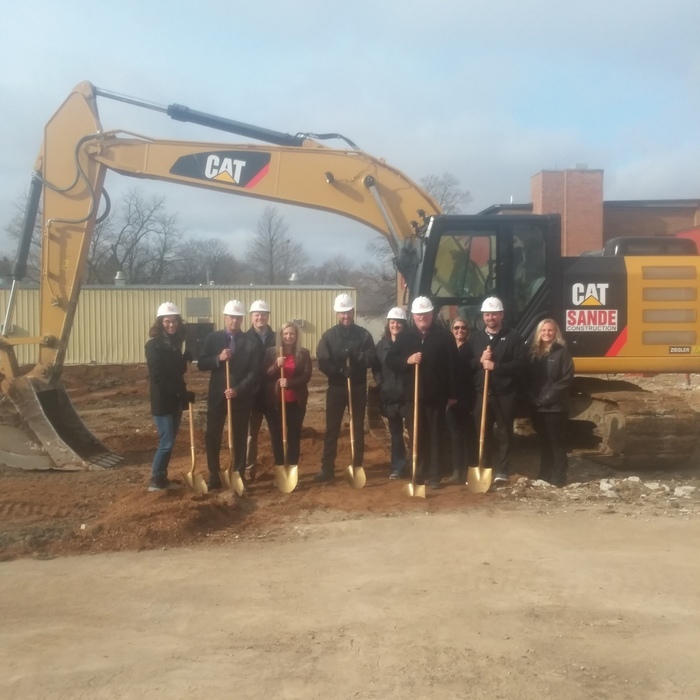 We are looking forward continued progress as well as the to the start of the Terril Elementary School addition! Stay tuned for more progress as the weather warms up! 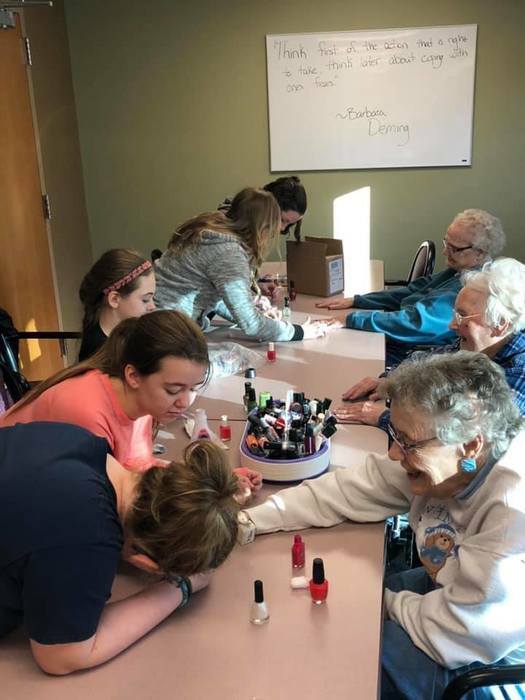 We are excited to be offering a new program to juniors and seniors called No Boundaries for the 2019-2020 school year. 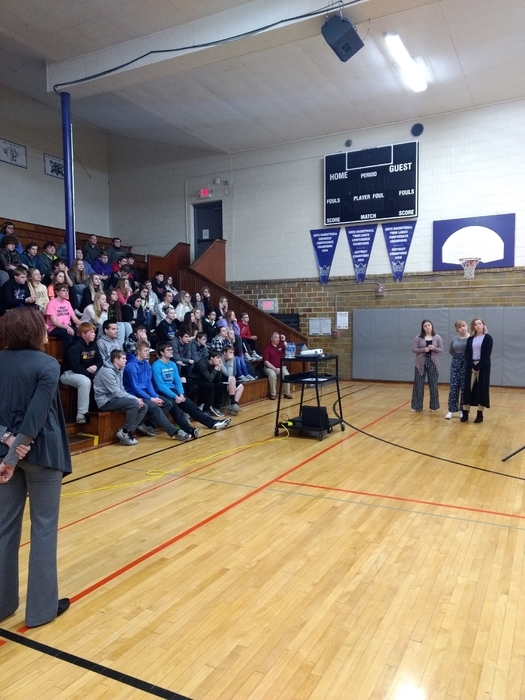 We presented the program to students in February and surveyed them to determine who might be interested. 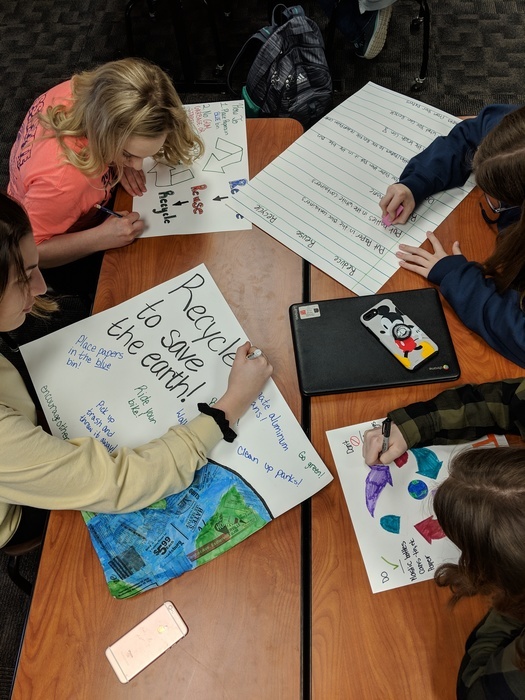 We would like to invite you and your student to an informational meeting on Tuesday, March 19th, 2019 at 6:00 pm in the high school library. 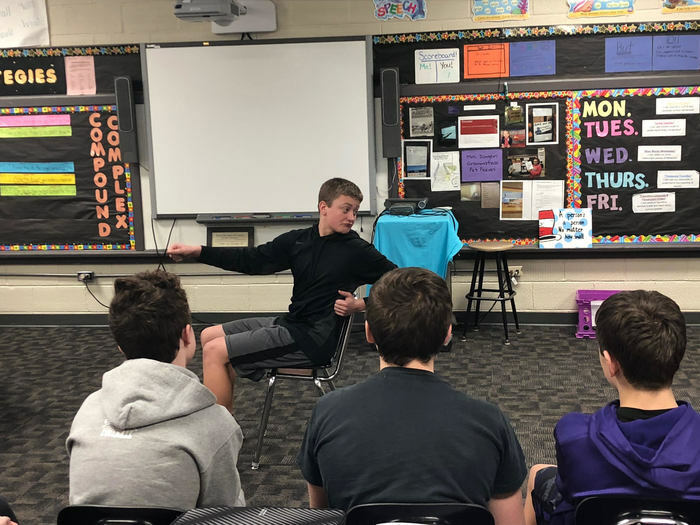 8th grade English Language Arts students are learning about non-verbal communication. 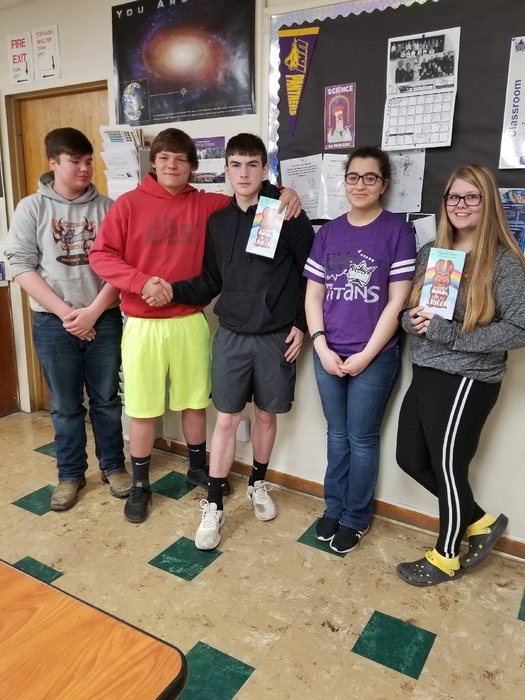 They put their skills to the test by creating an original pantomime and presenting it in front of their peers. 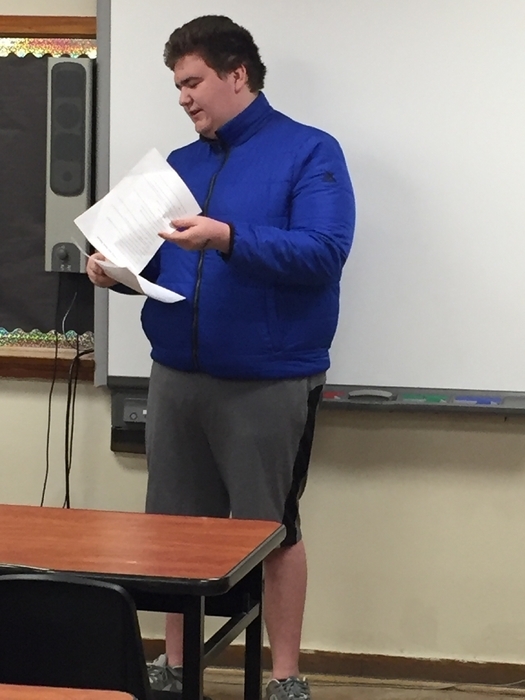 Marketing class presenting their Crisis Management Project. 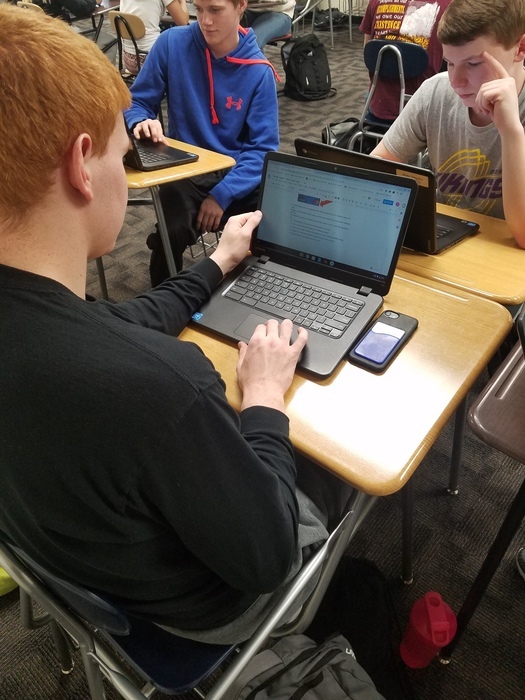 Students had to pick a crisis that a company or organization endured and research how they responded to the crisis. 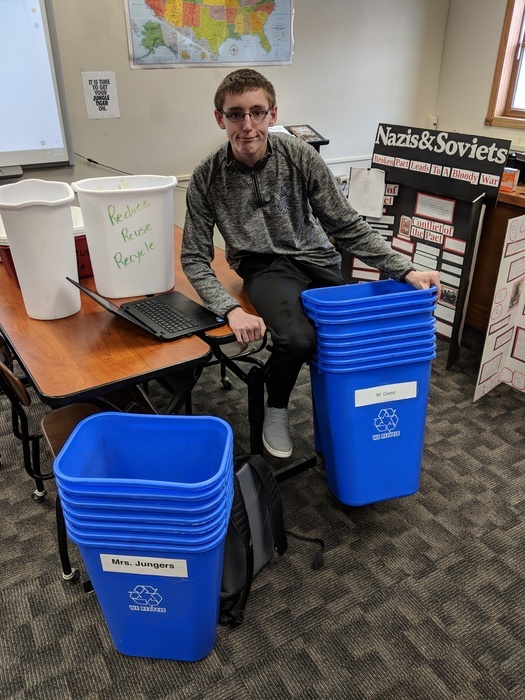 The students then crafted their own response in the form of Tweets and other social media platforms. 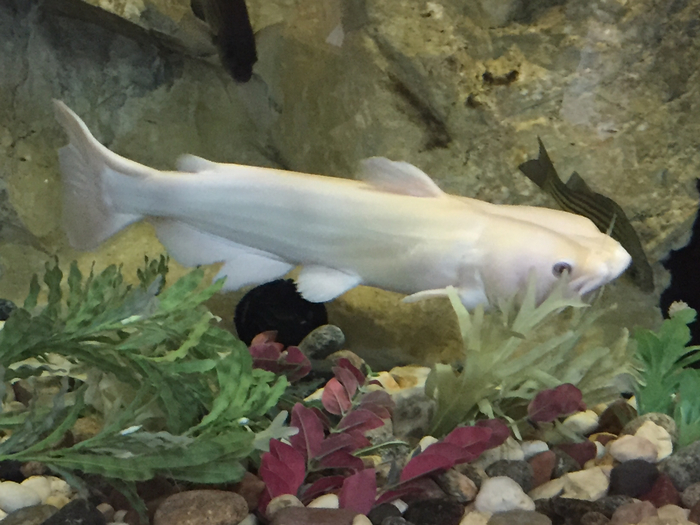 The GT district recently invested funds to purchase animal models to be used in the agriculture department. 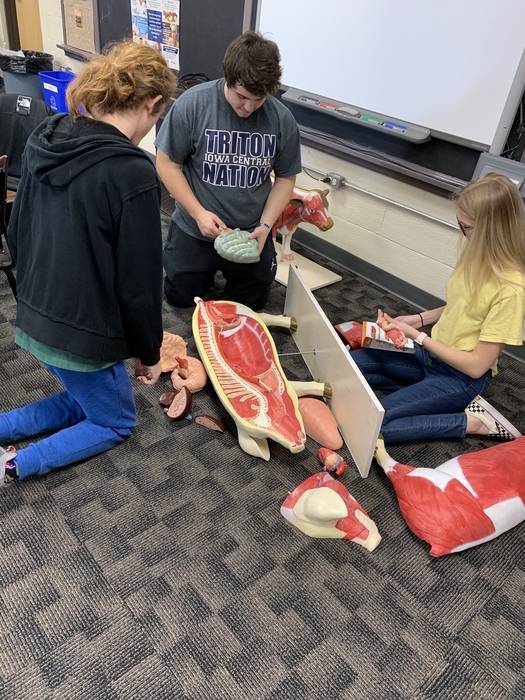 The models include removable muscular, reproductive and digestive systems. 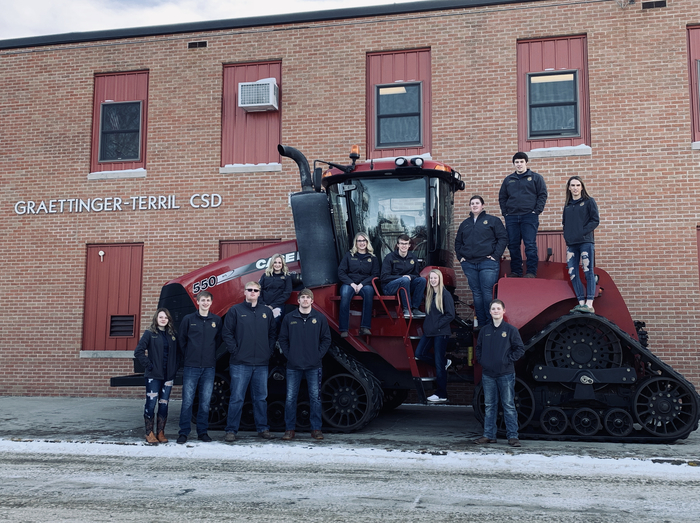 Ag department students are shown assembling the units and posing with them after assembled! 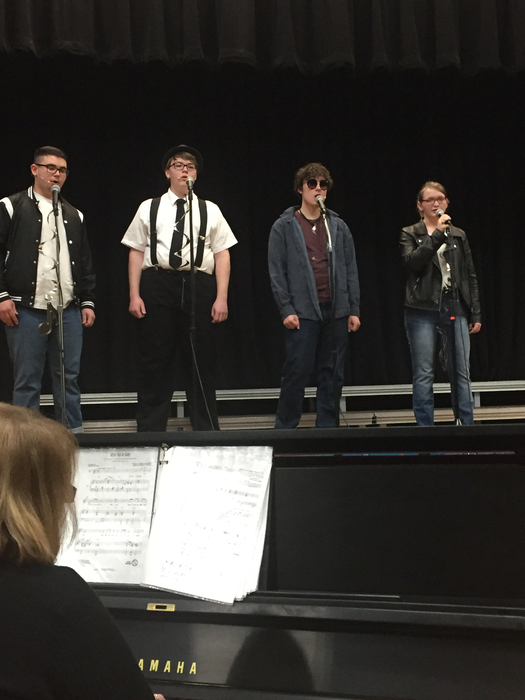 "Antisocial" will be performed Friday, March 15 and Saturday, March 16 @ 7:30 in the Terril Gym. 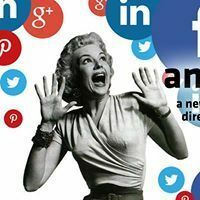 This Don Zolidis comedy features a series of vignettes that poke fun at social media. Admission is $6 (free for preschool). Friday!!!! 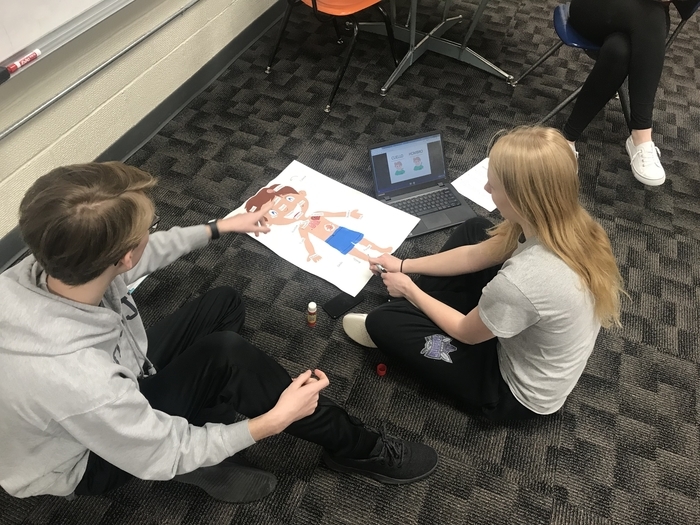 Spanish 2 Learning the body parts in Spanish. 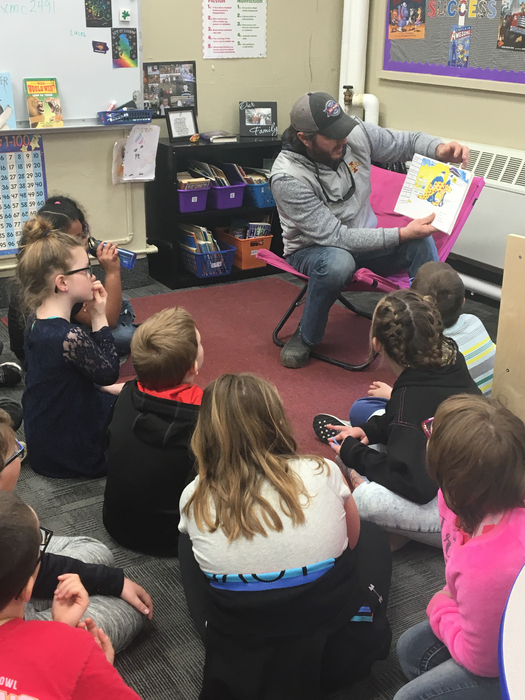 High school student reads his favorite book to the preschooler. 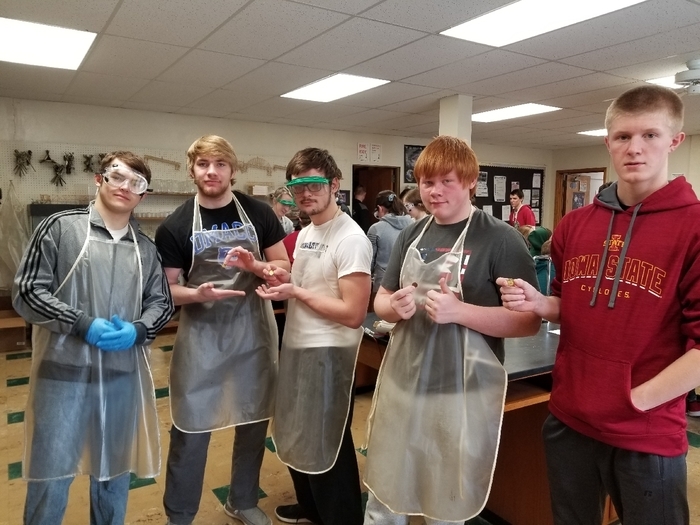 Thank you, Energy Panel Structures for supplying the Industrial Tech department with additional safety glasses. We appreciate your continued support of our program! 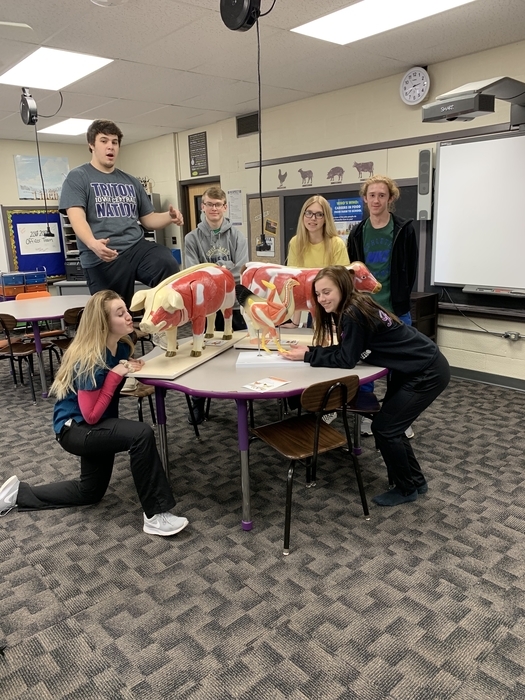 The 7th grade ag students just completed a unit discussing where their food comes from. At the the conclusion of the unit, students selected a farm to write a thank you letter to. 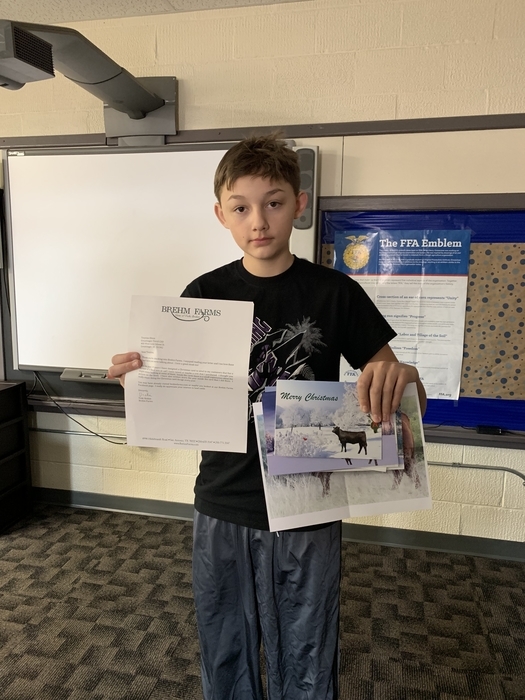 Treyton Kleve poses with the return letter and assortment of Christmas cards sent to him by his chosen farm! Attention Parents & Students: in an effort to recoup two of our missed snow days G-T CSD will make the following changes to our school calendar. 1. There will be no early outs on Wednesday afternoons for the remainder of the year. School will go until 3:30 every day. 2. 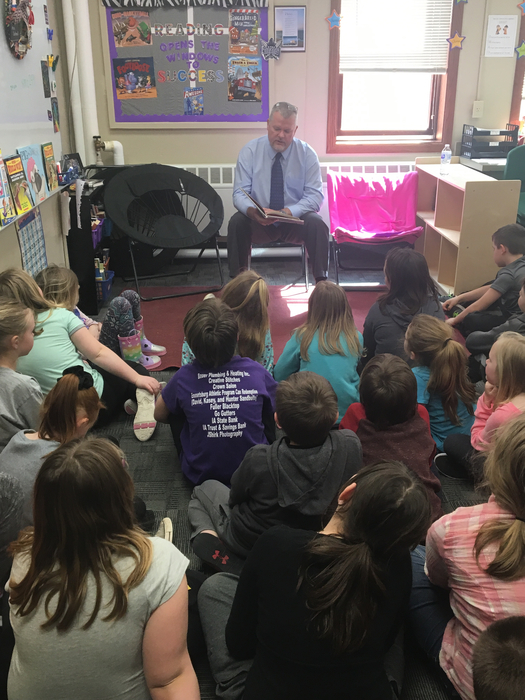 We will have school on Monday, April 22, 2019. This is the Monday after Easter and was previously listed as a vacation day. 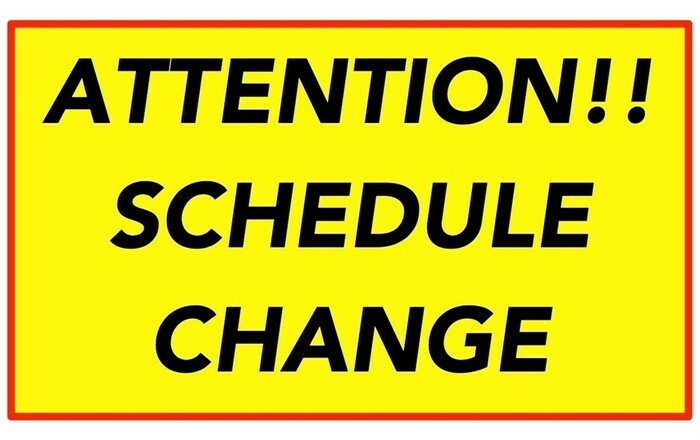 Making these changes will allow us to make up two of the days we have missed and be able to finish with students on Friday, May 31st. 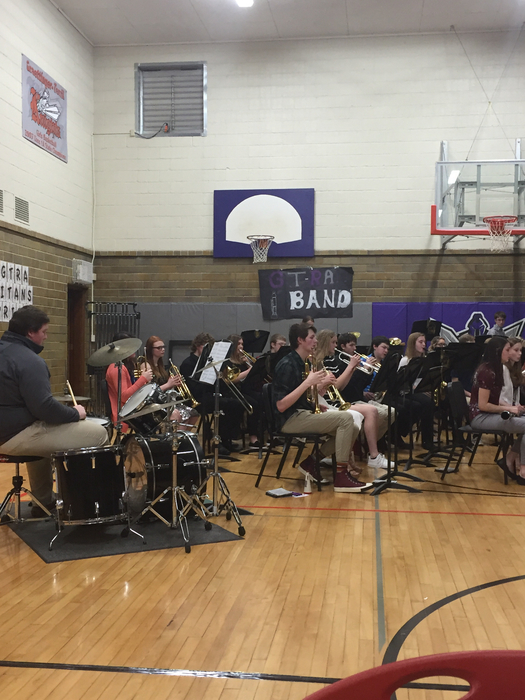 The GTRA HS band at work! Tonight’s GTRA HS concert choir at work! 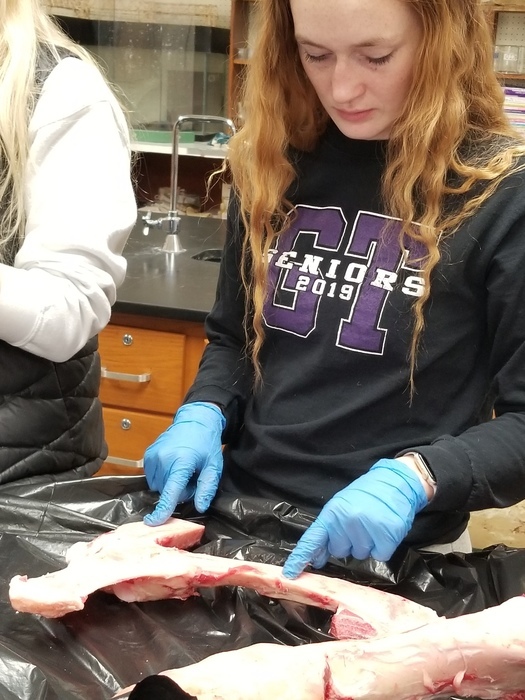 Animal Science students sampled a variety of ground beef in class on Thursday to determine if health programs and types of feed play any factor in the taste of animal products. The Elementary shuttle from Terril will arrive in Graettinger 10-15 minutes late today due to a bus breakdown. The Foods 2 students are in the middle of their Breads unit. This week they are making biscuits. 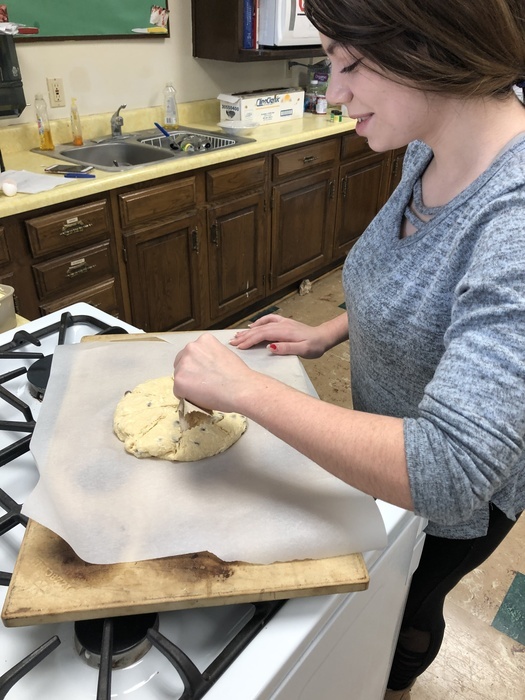 Both Kelsey and Autum chose scone making. 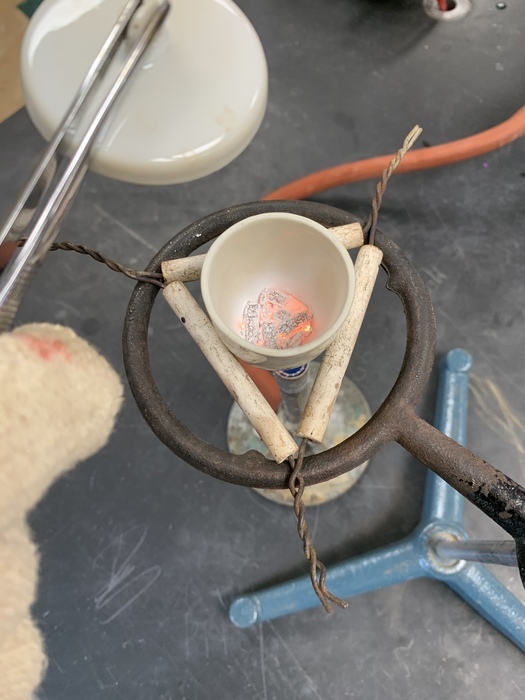 Students in Chemistry explored metallic bonds by creating an alloy of zinc-coated copper. 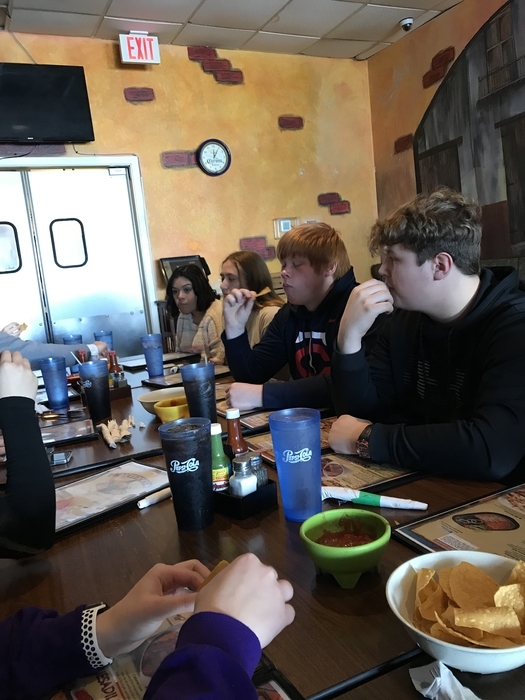 Here are some photos of our G-T/R-A Spanish students putting their skills and learning to the test. 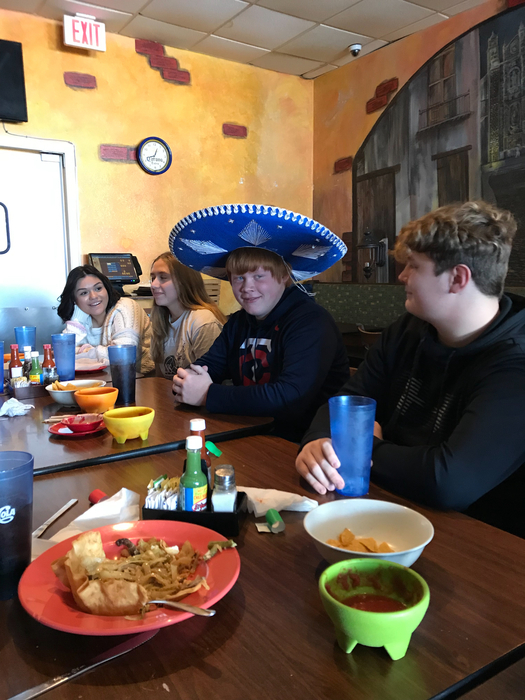 Students went to a local restaurant to order their meals using the Spanish language! 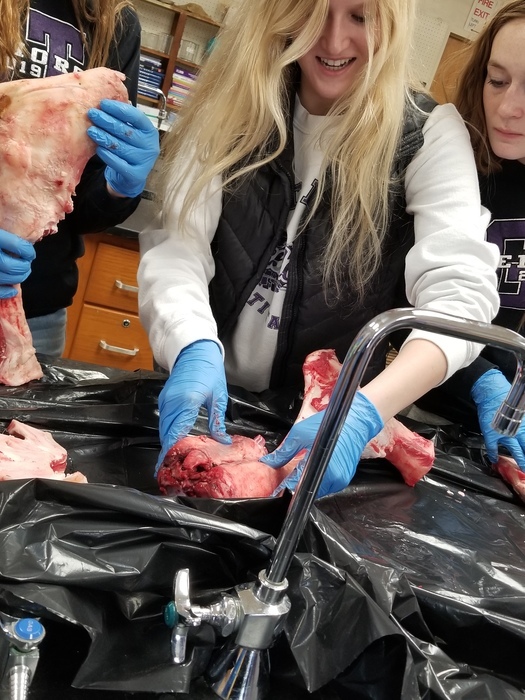 Anatomy & Physiology class was back in action dissecting sheep brains for their Nervous System unit! 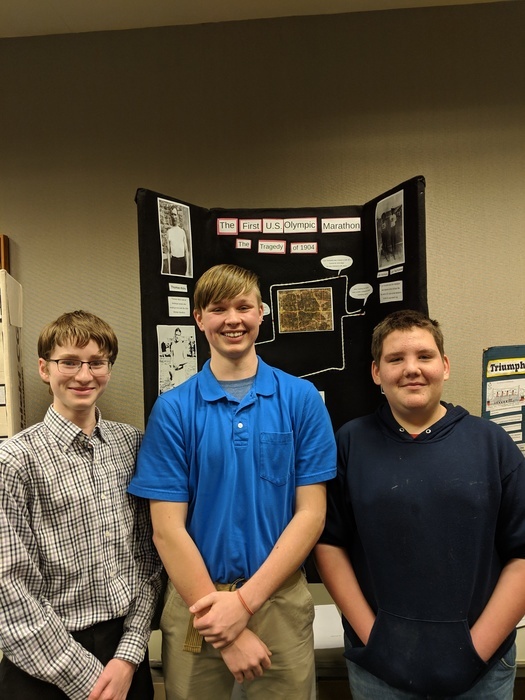 Sophomore World History & Junior US History classes prepared National History Day Projects. 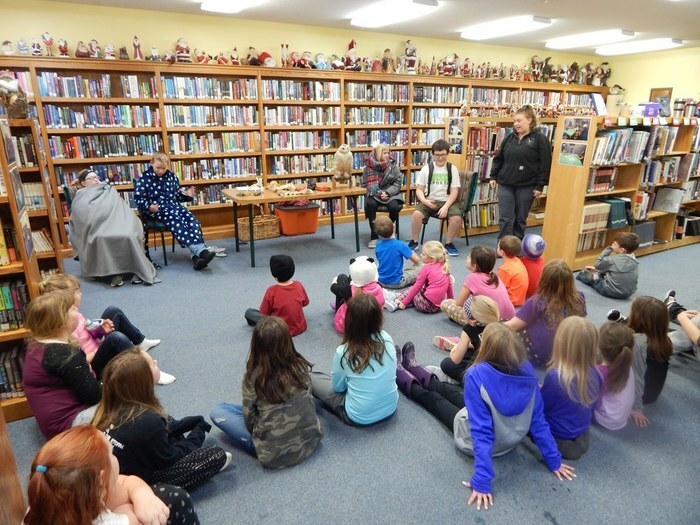 Then community members visited to judge, but more-so help the students extend their thinking. Thank you to all involved! 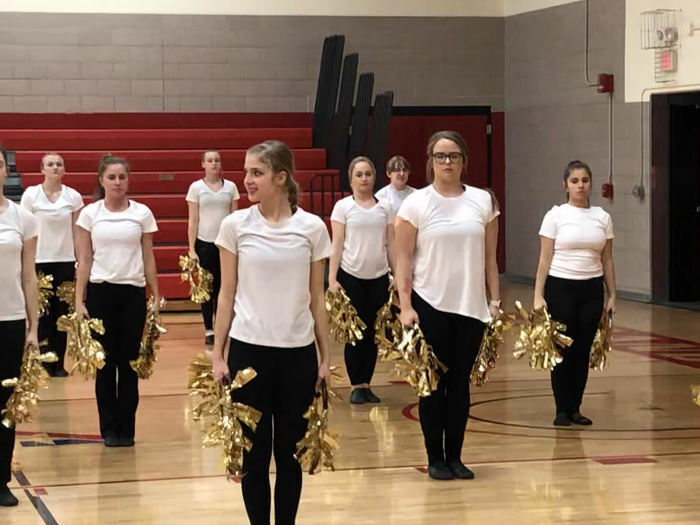 Don't miss the Titanettes Dance Team Showcase today! 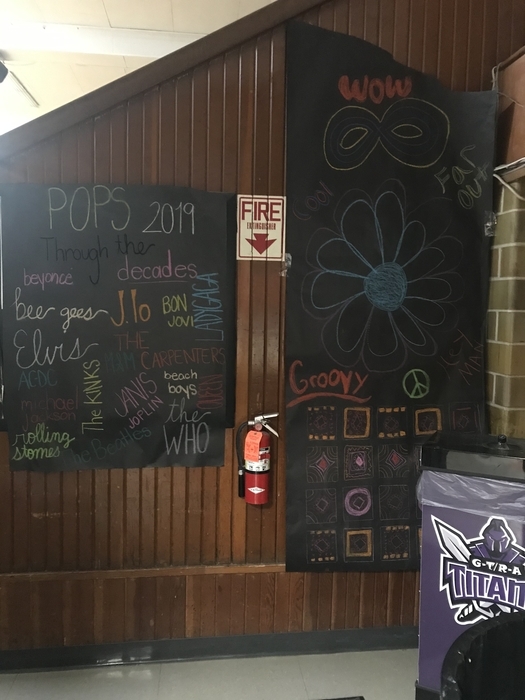 Show starts at 3:00 p.m. in Graettinger with doors opening at 2:30 p.m. See all your favorite dance routines from the year plus three new ones! Also featuring the Little Titanette Dancers, Dancetastic, North Union, and ELC! 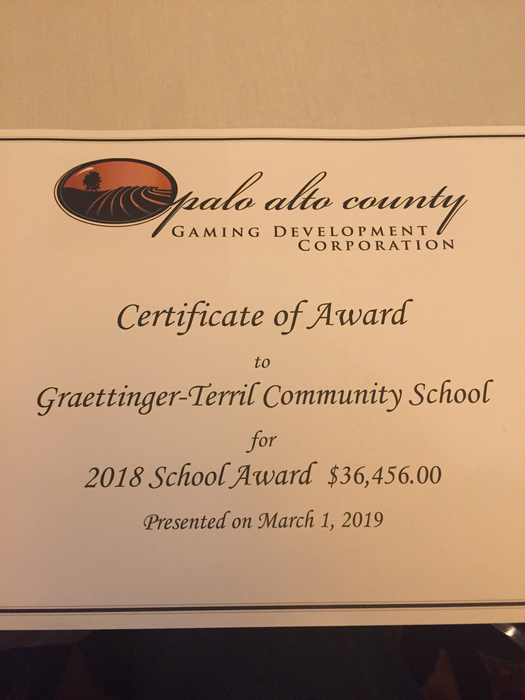 The Palo Alto County Gaming Development Corporation tonight gave the school district $36,456 for tech, fine arts and literacy. 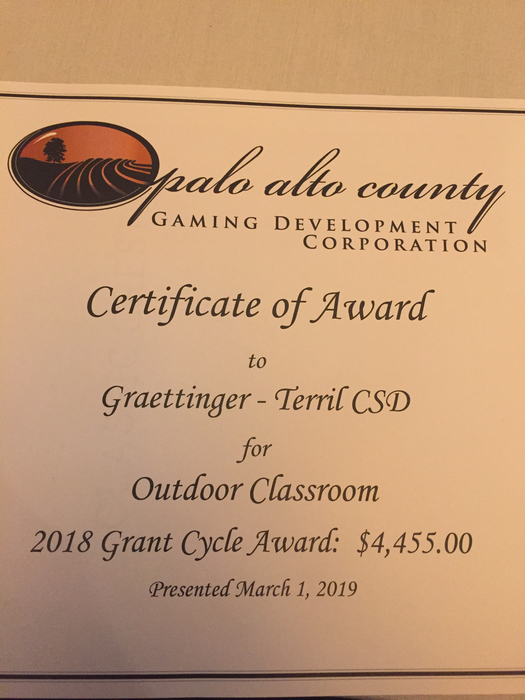 In addition, we were awarded $4,455 for an outdoor classroom in Terril! 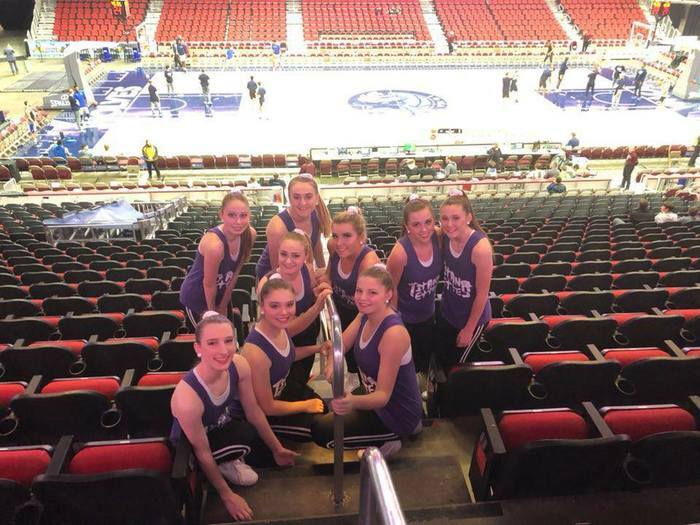 Tori Hampson is busy learning the pre-game routine she will be performing during the 4A and 5A Girls State Basketball Championship Games! Catch her on IPTV Friday and Saturday nights! 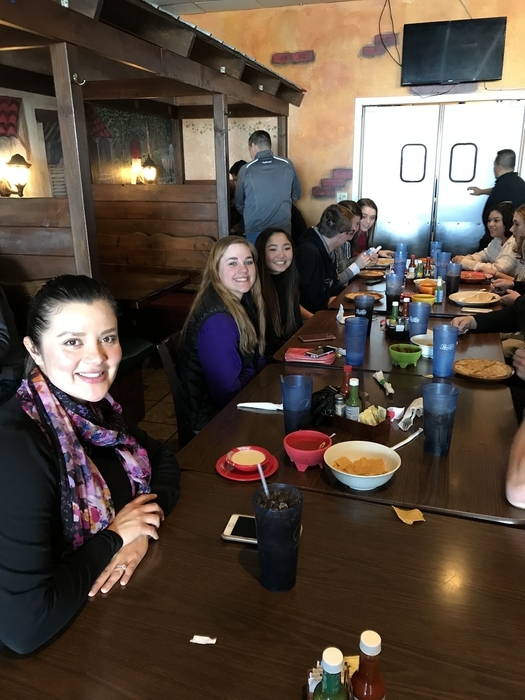 Marc Benedict presented about his externship experiences and the No Boundaries Program as part of a panel discussion at Buena Vista University yesterday. 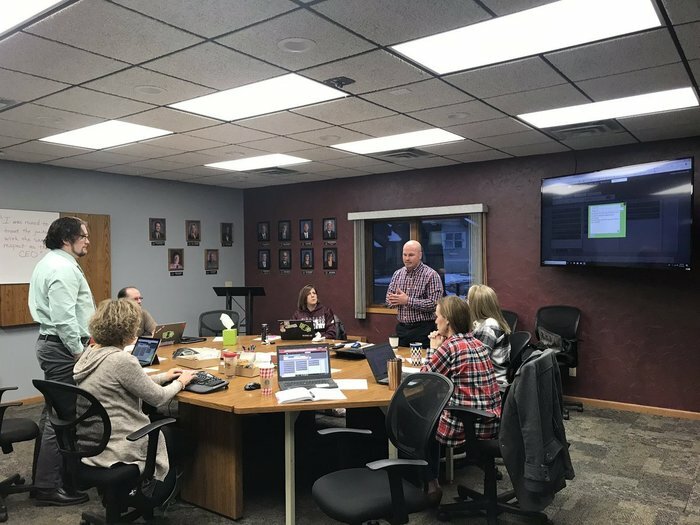 This was part of a STEM Scale Up PD put on by the Governor's STEM Council. 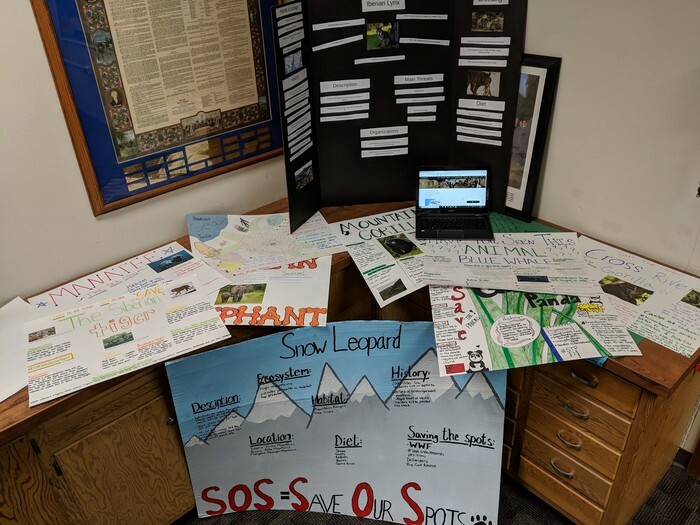 From websites to digital and paper posters to full blown exhibits- seniors are spreading great endangered animal awareness in their Modern Problems class. No School Monday, February 25, for G-T. Stay warm and Stay Safe! 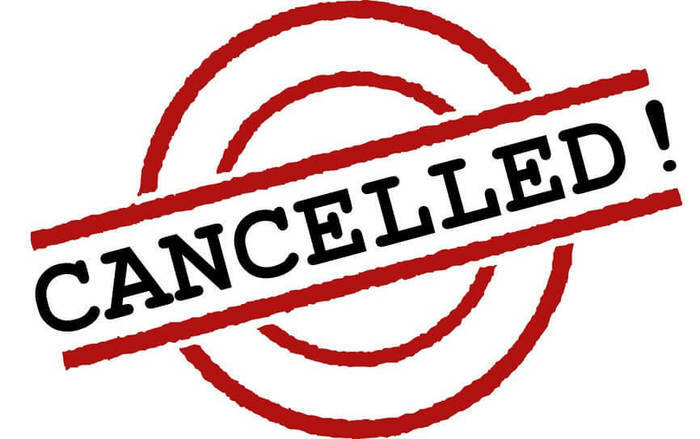 The 6th Annual Dance Showcase has been postponed to Sunday, March 3rd at 3:00pm at Graettinger. Doors will open at 2:30pm. 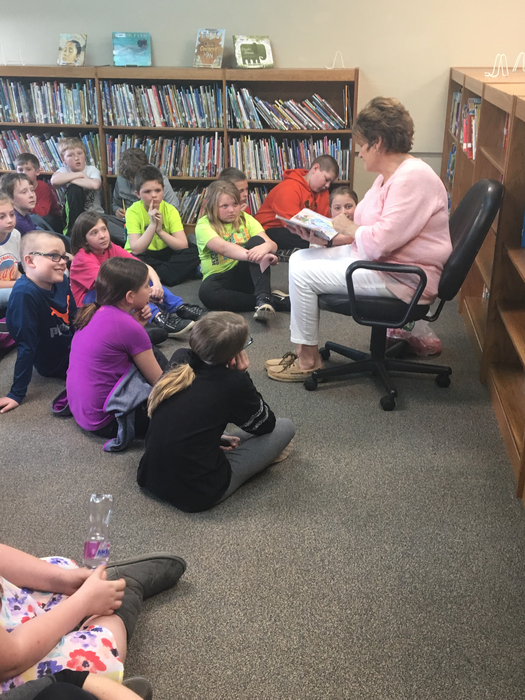 Even though it seems as if winter is dragging on, I promise summer will be here before we know it and there are so many great activities for kids and families in our area! 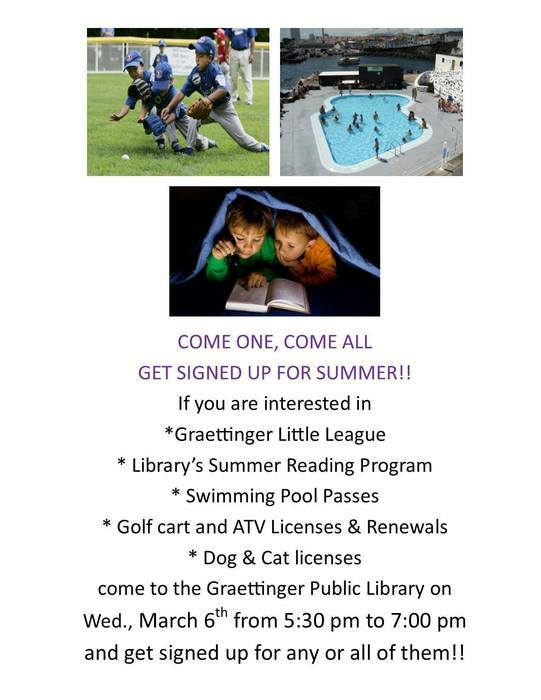 Swing by the Graettinger Library Wednesday, March 6 from 5:30 - 7:00pm to register for one or all. 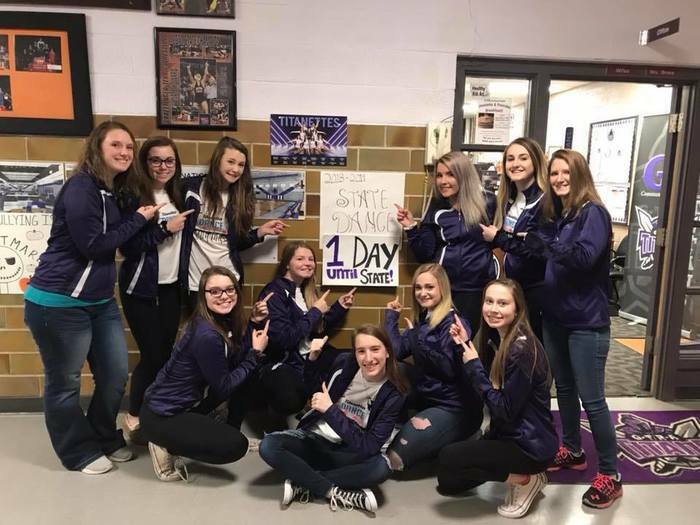 TIME CHANGE: The Titanettes Dance Team Showcase will be held Sunday, February 24th at 4:00 p.m. Doors will open at 3:30 p.m. Admission is $5.00 for adults and $3.00 for students. Come enjoy an awesome afternoon of dance! 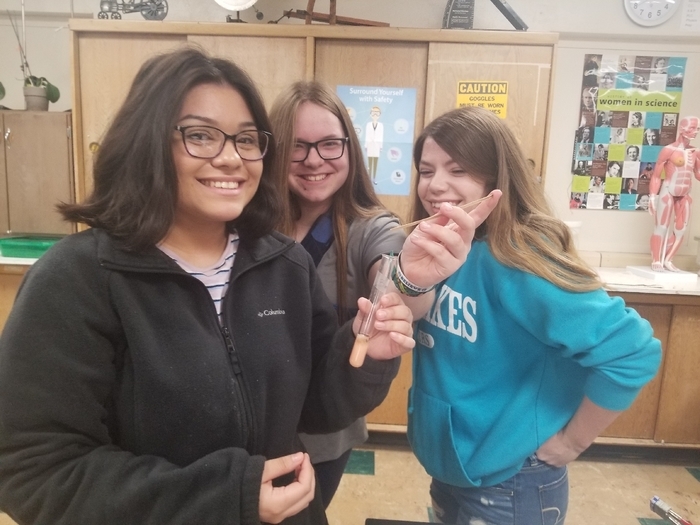 Students in Anatomy & Physiology tested various reflexes during their Nervous System unit. 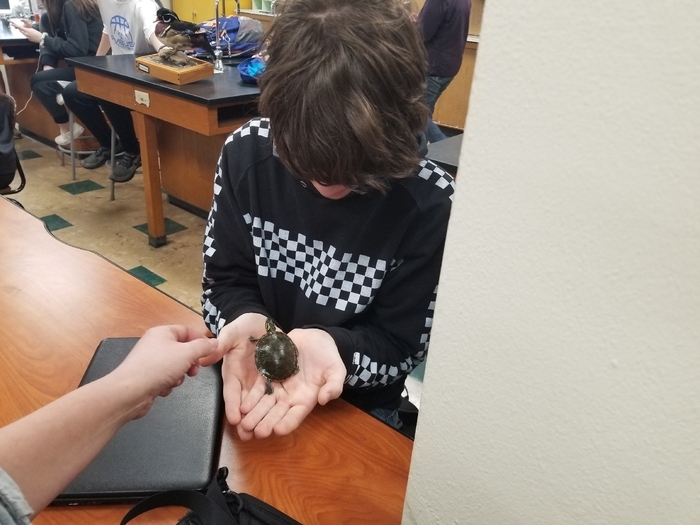 Thank you to Dr. Alex Helmich for supplying the hammers for our students! 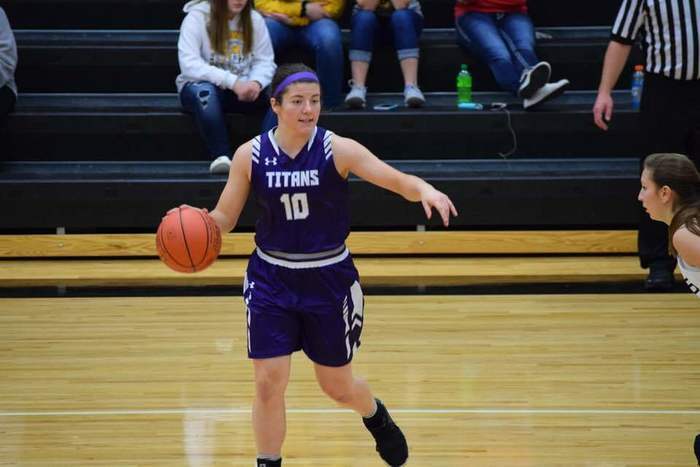 Congratulations to G-T/R-A’s Madison Hough for being selected to the Iowa Girls Coaches Association All District Team!!! 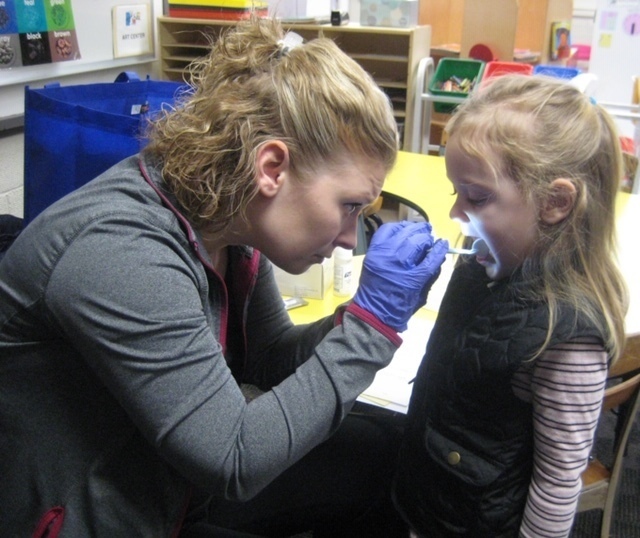 Students who returned permission slips got their teeth checked, a fluoride treatment, and all students received a toothbrush and toothpaste. No School at G-T today, Wednesday, 2/20 due to the heavy snow. Jazz choir performed at Shake The Lakes! 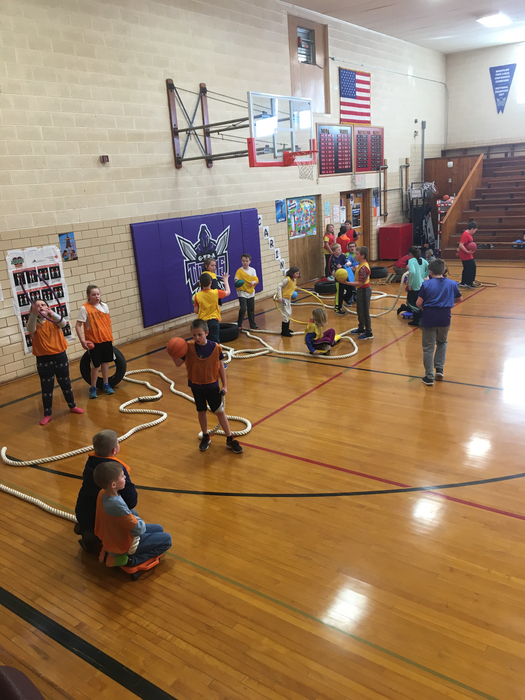 Help our elementary student keep their heart healthy, help save lives and help our school earn free gym equipment! Sign up for the Kids Heart Challenge today at www.heart.org/kidsheartchallenge or download the Kids Heart Challenge App. 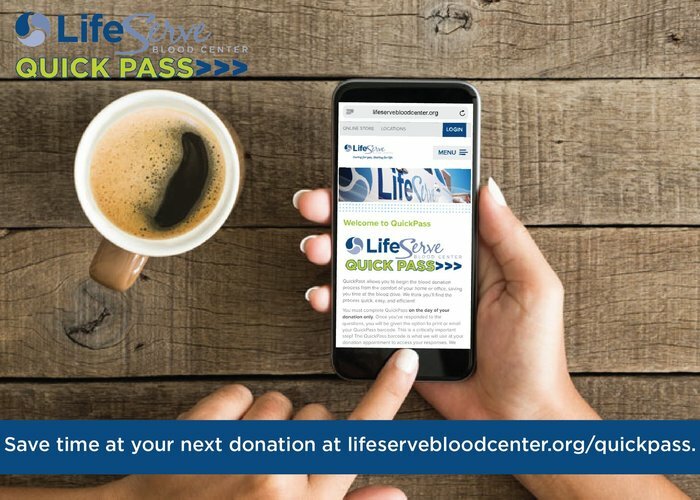 Take the challenge TODAY! 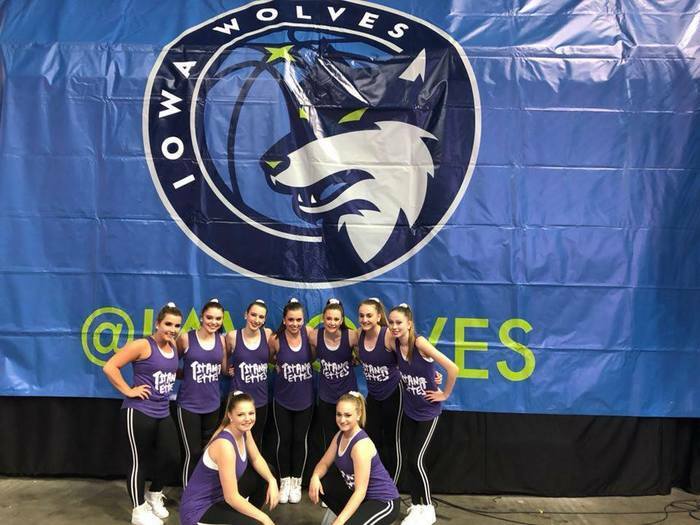 Don't miss the 6th Annual Titanettes Dance Team Showcase on Sunday, February 24th at 3:00 p.m. in Graettinger! Doors open at 2:30 p.m. Admission is $5.00 for adults and $3.00 for students. Come enjoy an awesome afternoon of dance! 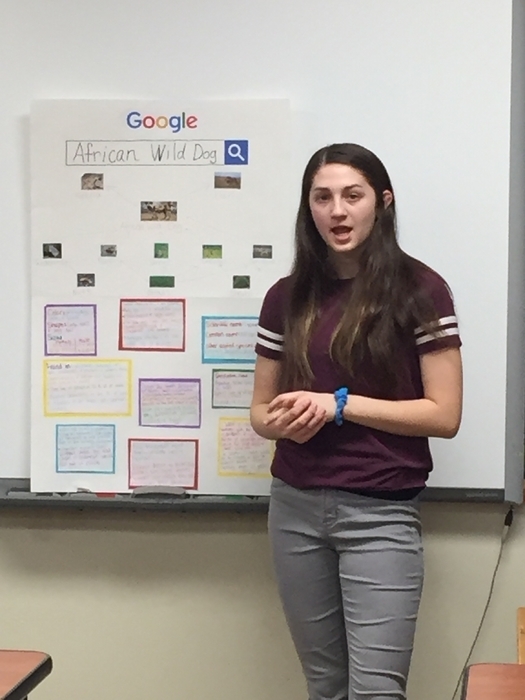 Students in Unified Science researched and presented endangered species to wrap up their ecology unit this week. 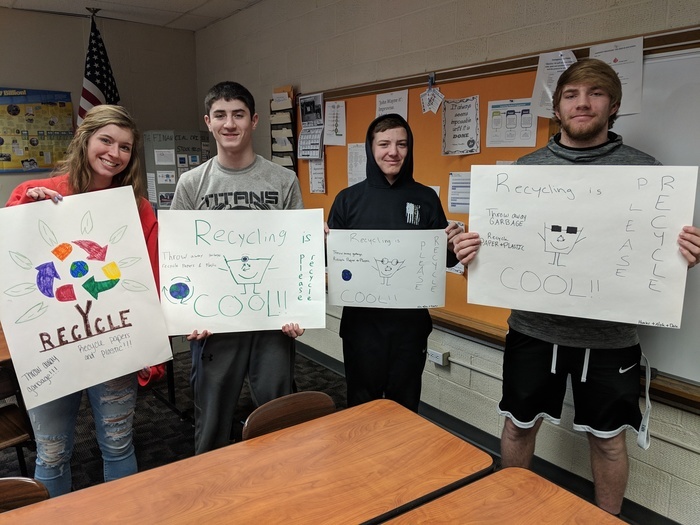 Students were given freedom to choose their presentation medium and showed some creativity with posters, podcasts, videos, slide shows, display boards, and more! 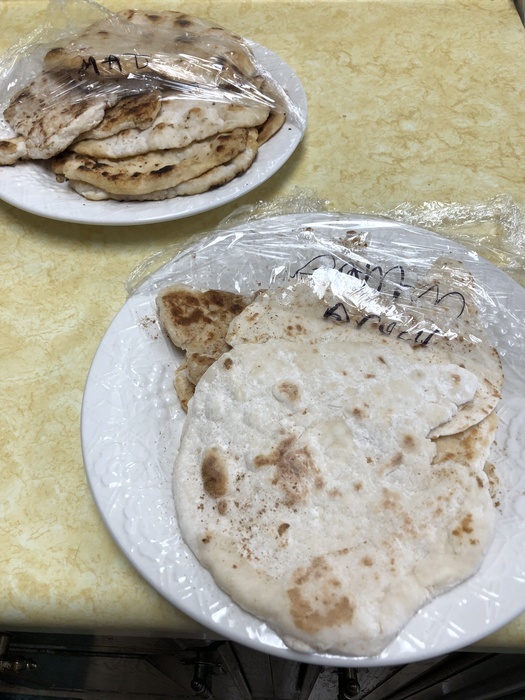 The Foods 2 students made flatbread during a lab on Thursday, February 14. Over the next several weeks, they will be focusing on bread making. 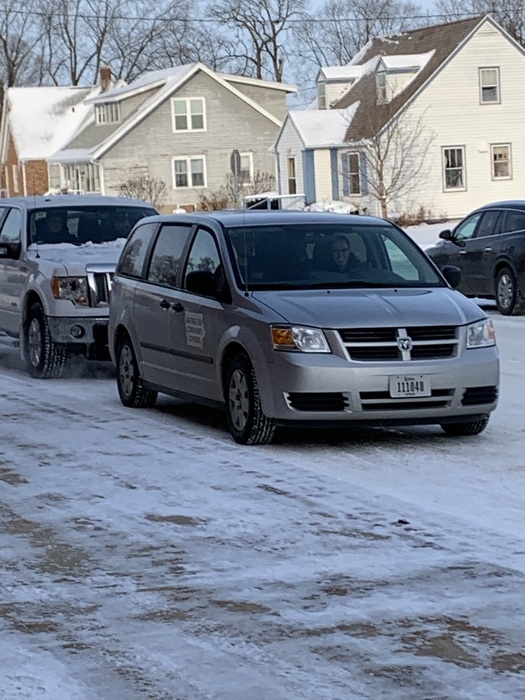 The Wrestlers are on their way home from state!! There will be a 1:00 Welcome Home Ceremony in Ruthven, 2:00 in Graettinger. 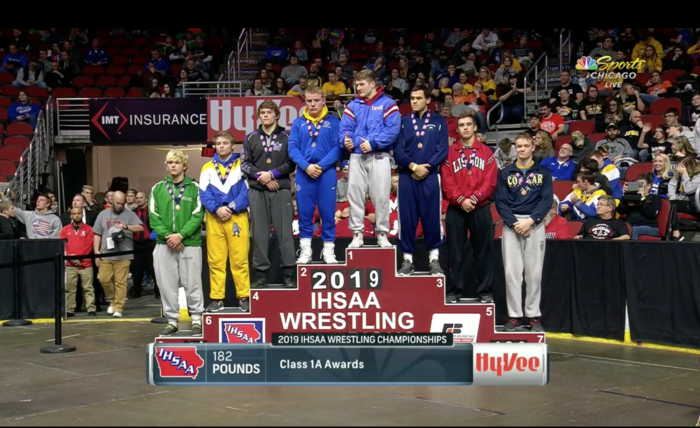 Congratulations, Carter Murray, who place 4th in class 1A at #182 in the IHSAA State Wrestling Tournament! 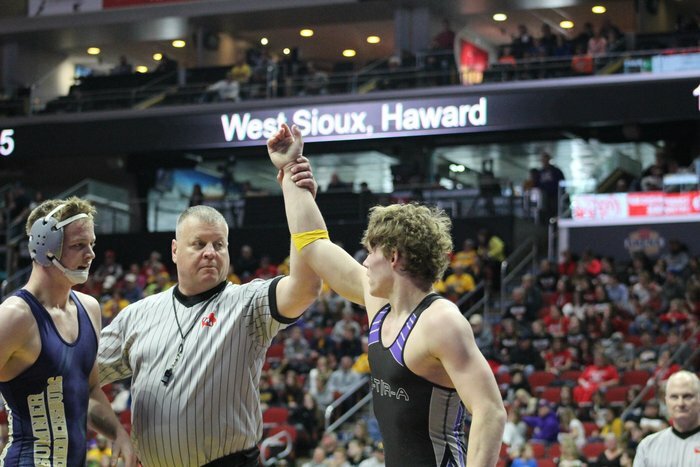 Congratulations, Treyton Cacek, your 1A #170 CHAMPION!!! 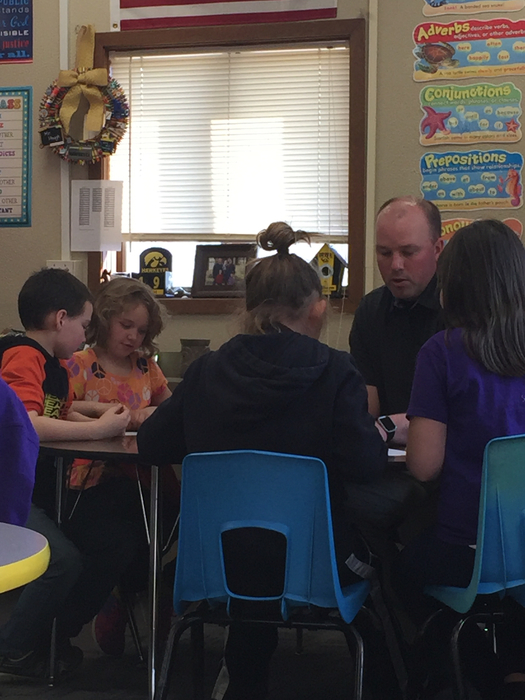 Try to tell us that teachers don't care about student success inside and outside of the classroom! Teachers at the MS/HS took a break from PD on Friday to follow along with our state wrestlers and their journeys down at The Well! HS Boys District BB @ Paullina has been postponed to Friday 2/15 @ 6:30. Junior High Basketball with HLP will be postponed to a later date. To clarify busses, shuttle busses will run at 1:30 and route busses will run at 2:00. 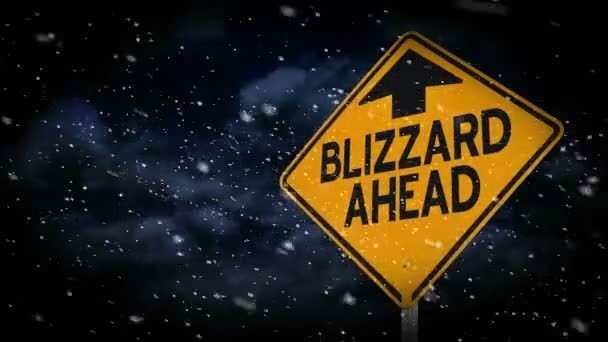 G-T CSD will be dismissing at 1:30 PM today, Thurs., February 14, due to the wind and icy conditions. 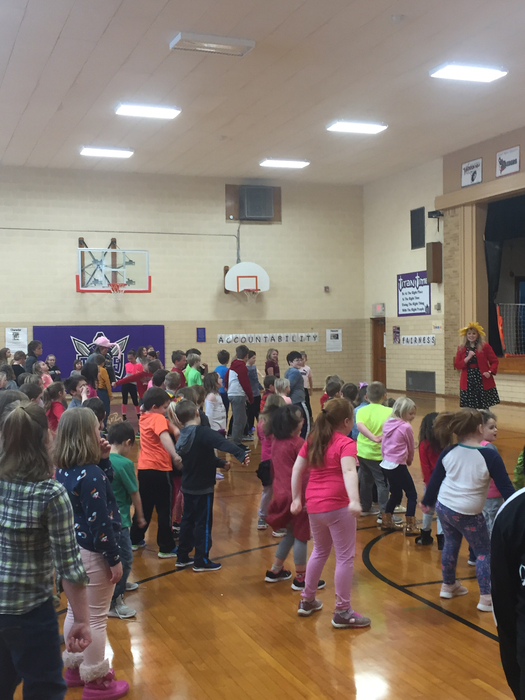 And the fun continues at Terril Elementary with Teddy Waddell! 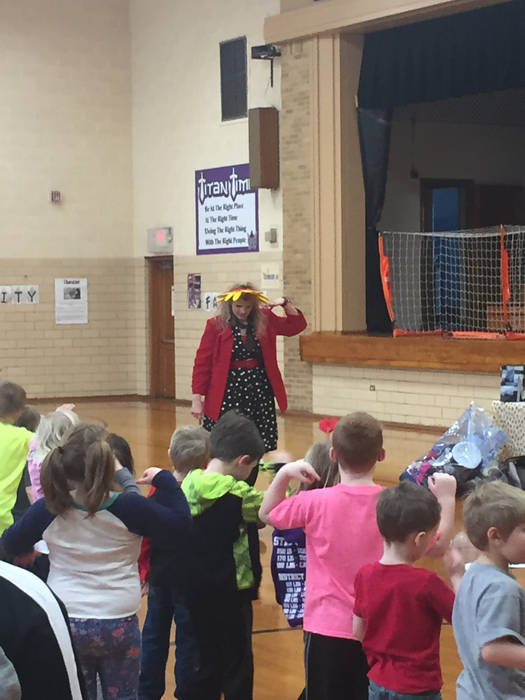 Teddy Waddell teaching us about laughter and the benefits it has along with movement. Reminder- there will be no early out today Wednesday, February,13th due to the professional development (No School) on Friday, February, 15th. 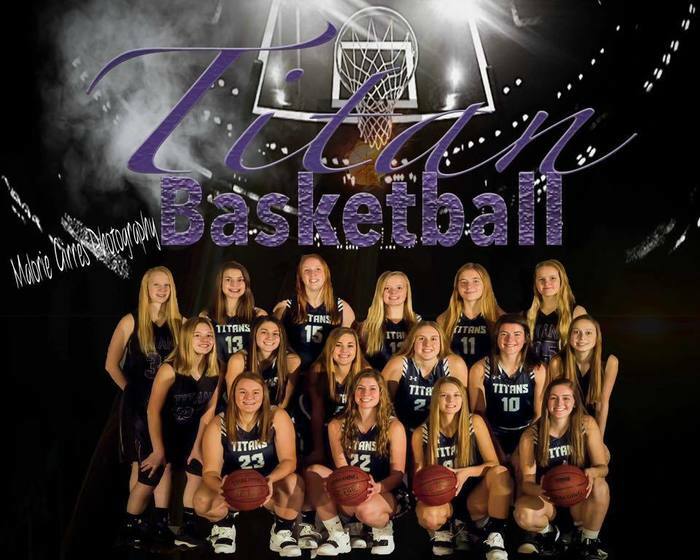 Girl's Regional Basketball vs GLR @ George is postponed to Wednesday, February 13. The Joint Board Meeting scheduled for 2/13 is postponed to a later date. Update: GT CSD will be CLOSED today, Tuesday, February 12th due to inclement weather. G-T will be 2 Hours Late today, Tuesday, February 12th due to the inclement weather. 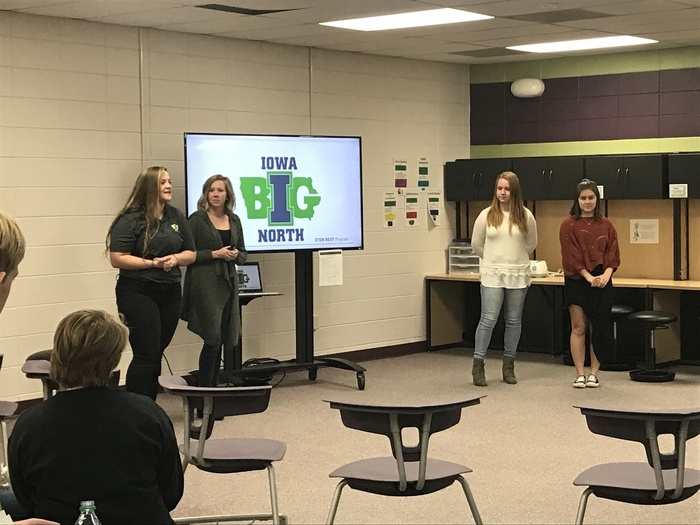 Iowa BIG North students shared the unique learning opportunities that will be available to GT/RA, Okoboji, and Spencer students in the fall. Great to have some board members, parents, community members, and businesses join us too! 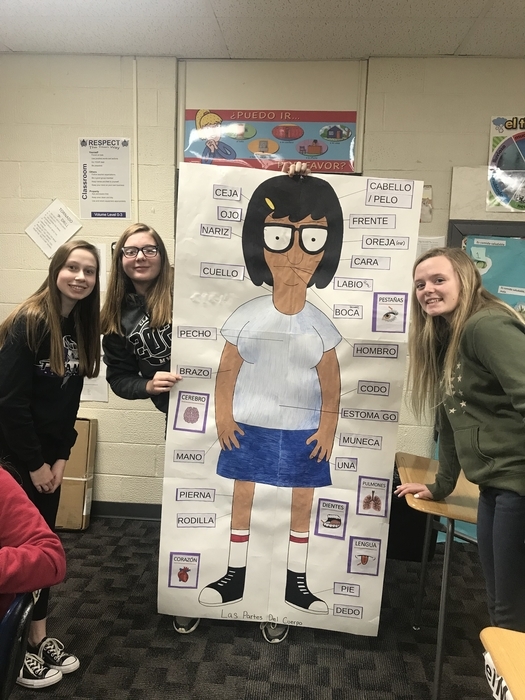 The 8th graders in Mrs. Jungers' English class are experiencing their Career Unit. The students identify jobs they're interested in learning more about. 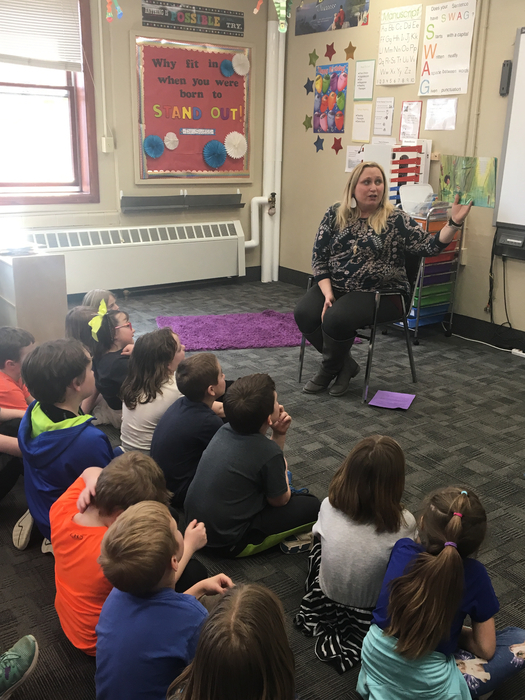 For two weeks, various people come in to speak about their profession. 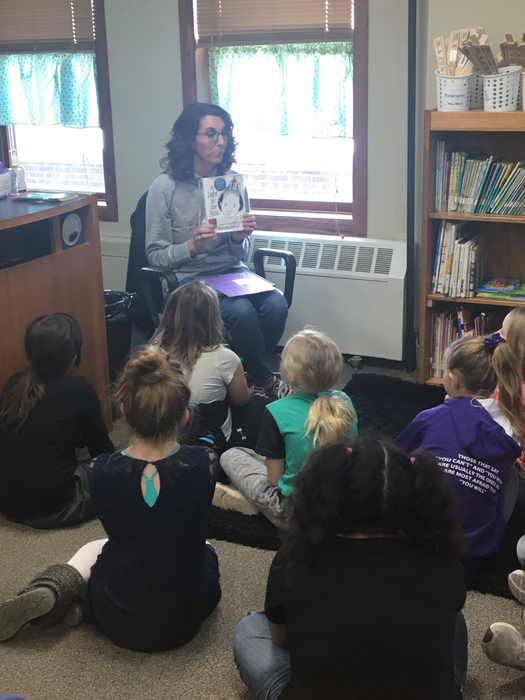 The students listen, take notes, and ask questions. 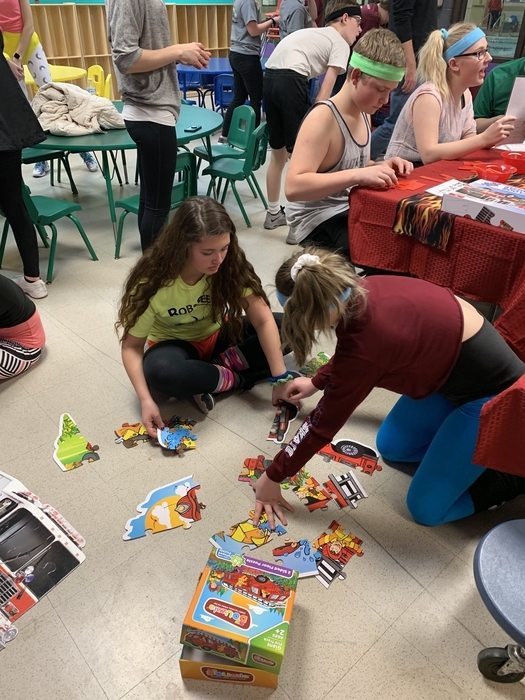 The middle school enjoyed participating in Global School Play Day this past Wednesday. The rules for the day: No electronics. No screens. 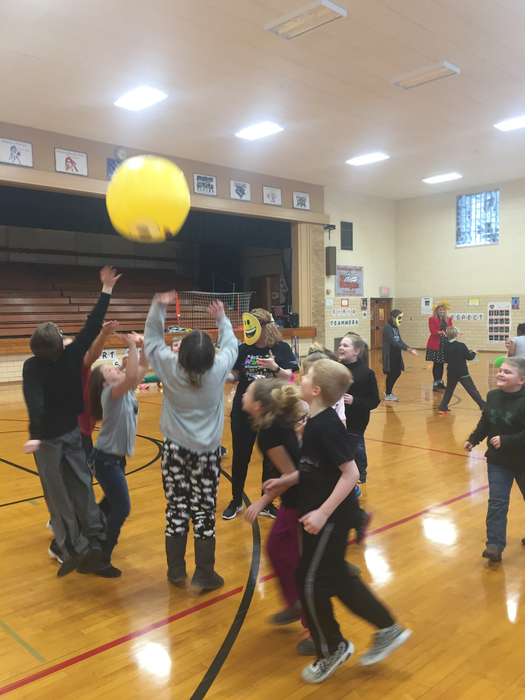 Socialization and FUN are the goals! 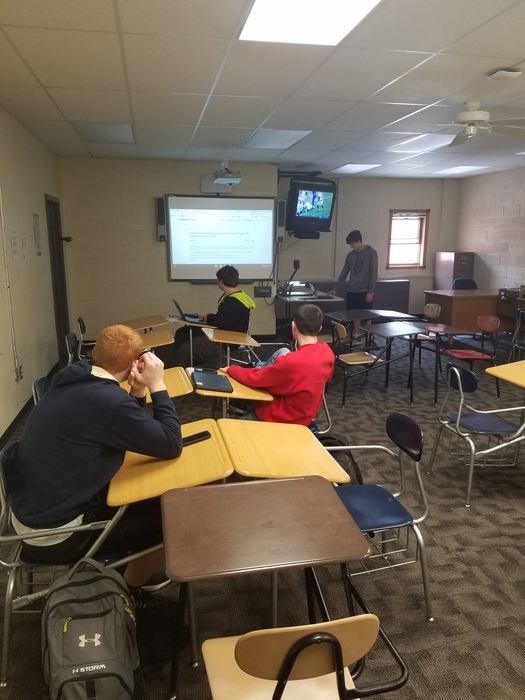 Computer Applications students enjoying a Tech Free Friday in which they must "disconnect" from their phones and laptops for the period. 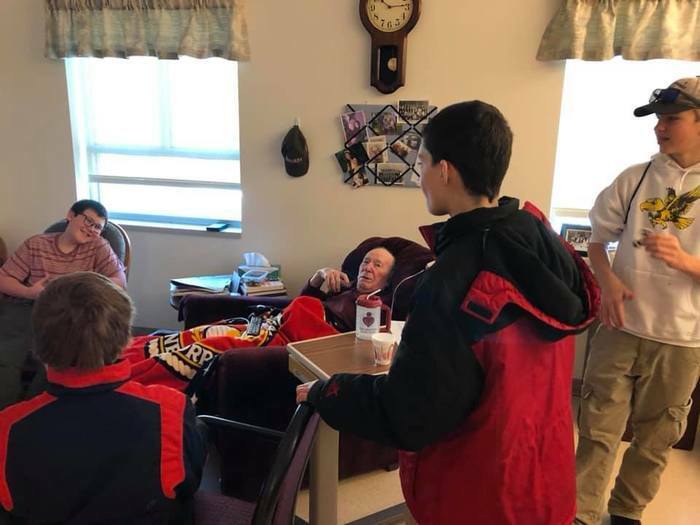 Students played card games, board games and personally interacted with each other. We are loving our new app! Access sports scores, cafeteria menus, news updates, and even emergency notifications, right from your pocket. https://youtu.be/8Q6qCQR_5dc Download the app on Android: http://bit.ly/2IKDS8W or iPhone: https://apple.co/2qdeAb4. 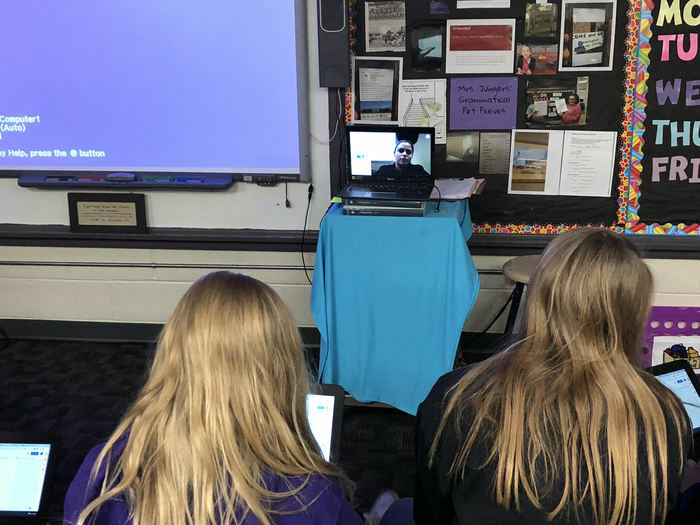 Join us at 11:50 on Feb. 11 at GT HS where Iowa BIG North's group of marketing students will help us explain the unique kind of work-embedded, problem-based learning that GT/RA, Okoboji, and Spencer students will be able to collaborate together on starting next Fall. G-T Schools will start 2 Hours Late tomorrow, Friday, February 8th. Girls Regional BB tonight postponed to Friday, Feb. 8 at Everly @ 7:00 PM. JHGBB today cancelled. JHWR today cancelled. There will be no school at G-T today, Thursday, February 7, due to the inclement weather. 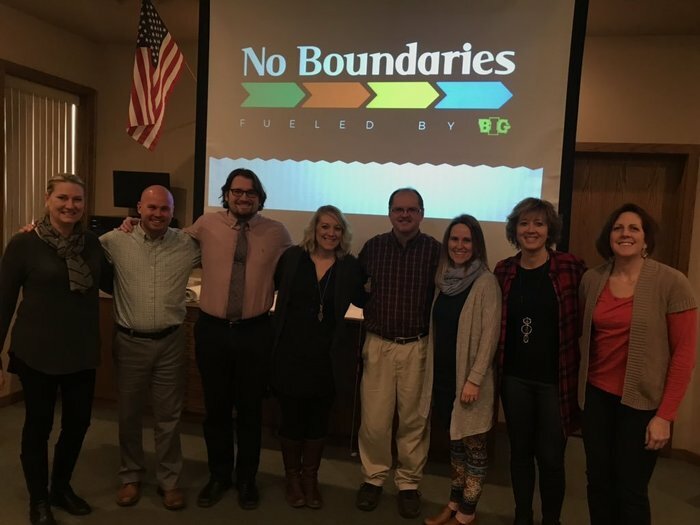 The No Boundaries team consists of staff from GT/RA, Okoboji and Spencer. 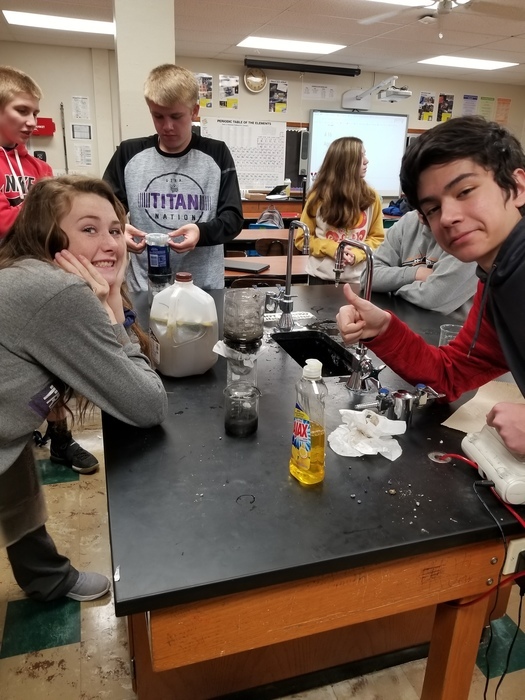 Join the team at 11:50 on Feb. 11 at GT HS as they share the amazing new learning opportunity that will be available to students in all three distrcits next Fall. 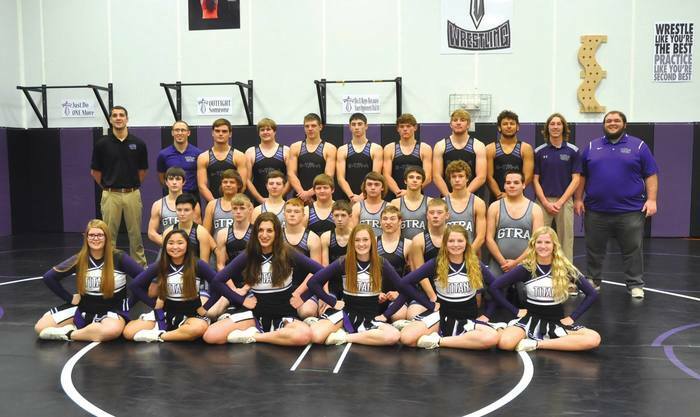 The G-T/R-A wrestling team will be participating in Regional Duals tonight at Emmetsburg starting at 6:00. 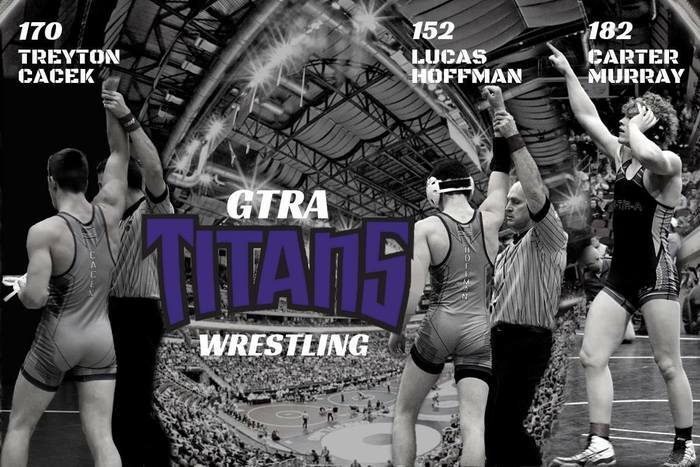 1st Round – GTRA vs Central Springs Emmetsburg vs ACGC 2nd Round – Winning teams wrestle with the winner moving onto State Duals Good luck Titans!! Spanish 1. Yesterday!!!!!! 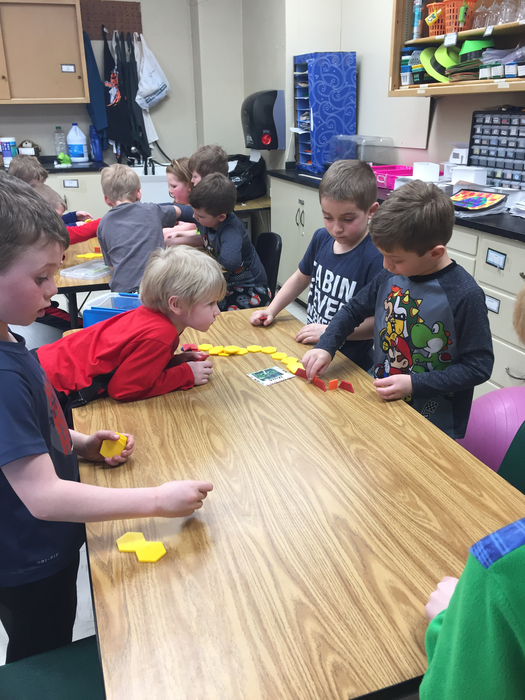 Working as a team through the game with the verb “to be”. 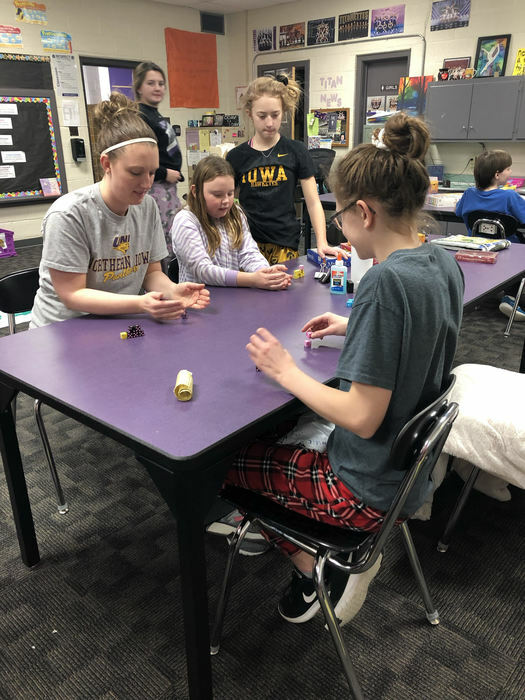 A team of students from Iowa BIG North will be at GT on Feb. 11 at 11:50 to help explain what the new No Boundaries learning opportunity will be like next fall. We encourage any parents, community members, and business people to join us. 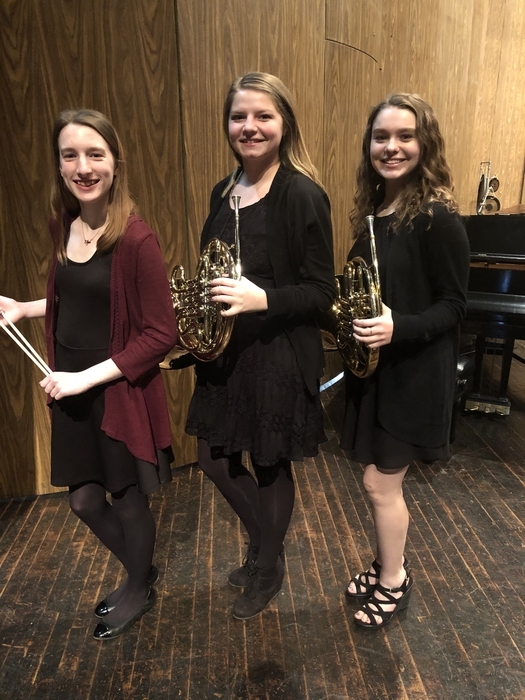 Congratulations to Morgan Hellyer, Arielle Roth, and Meaghan Dahna on a fantastic performance with The Cyclone Honor Band this weekend! 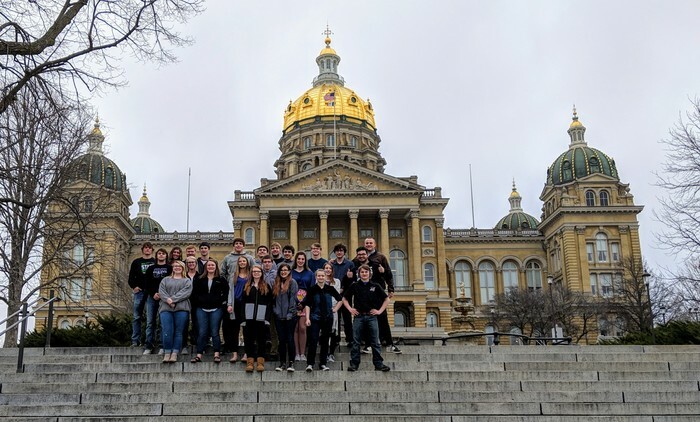 They performed alongside 240 of Iowa’s best high school musicians, under the direction of two world-renowned composers, Ruud Pletting and Johan de Meij! G-T will be 2 Hours Late this morning, Monday, February 4th, due to the icy conditions. 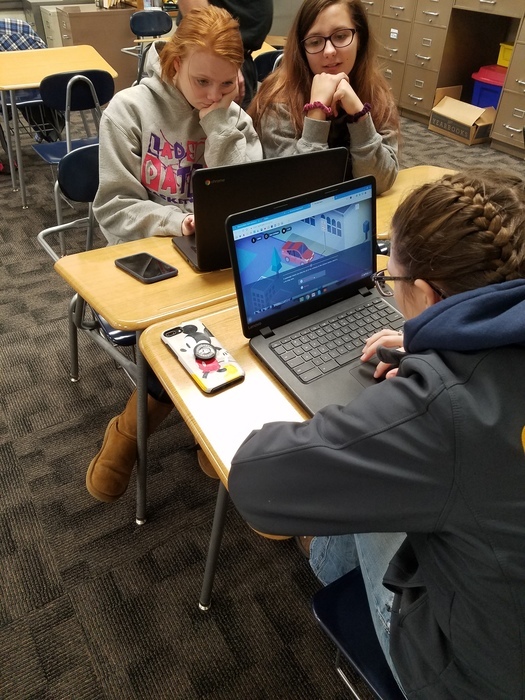 Students in Workplace Readiness played The Uber Game. The goal is to see if they can make it as an Uber driver in a big city with an upcoming mortgage payment. 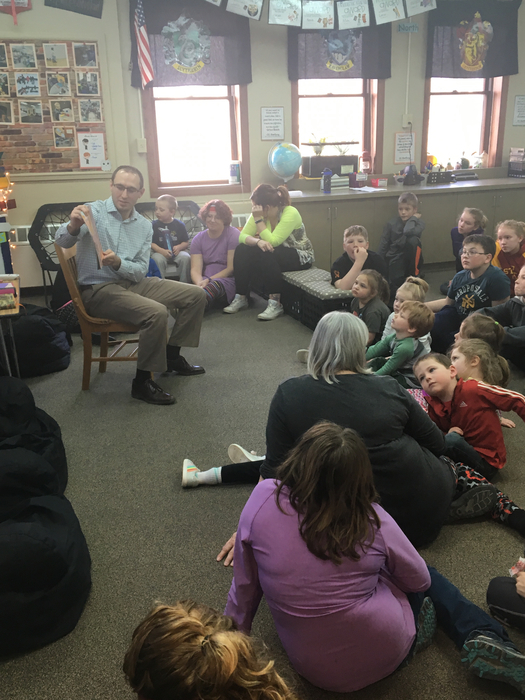 The students enjoyed learning about income fluctuation, costs of working and life decisions. 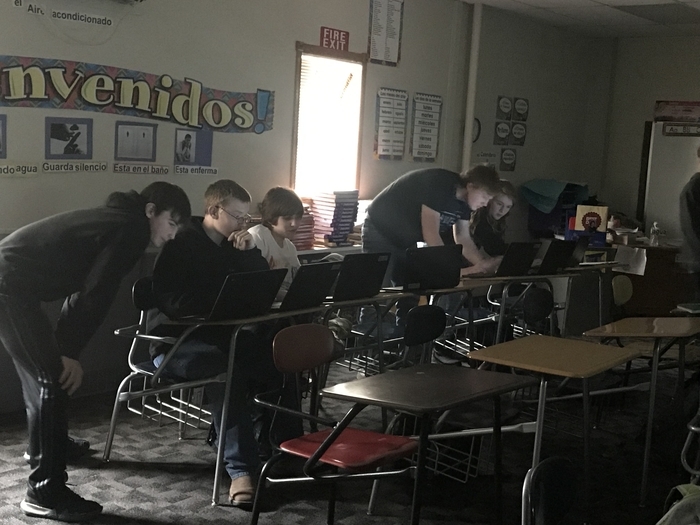 7th grades are acting out the play 12 Angry Men. They set up the classroom to look like the jury room and utilize the space according to the stage directions. 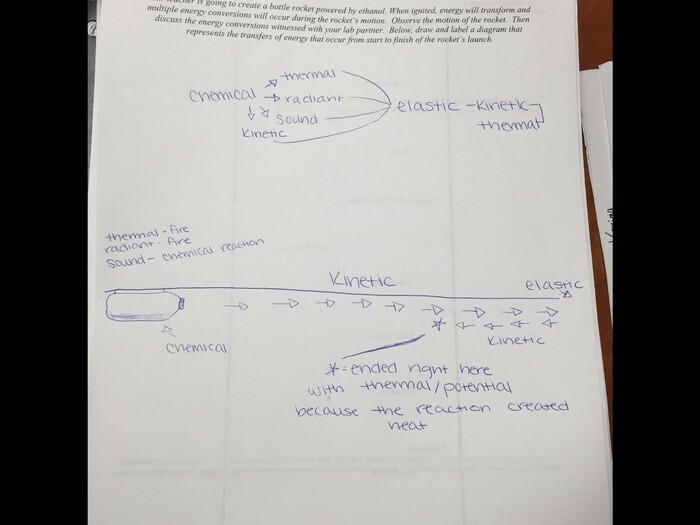 As jurors start to become swayed, students analyze why they begin to change their minds due to evidence or lack of. 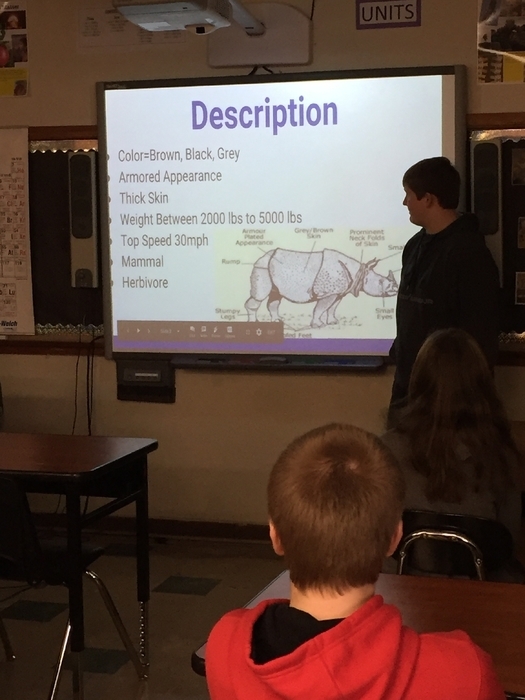 Students in Anatomy & Physiology researched diseases and conditions associated with the Skeletal System to present to the class. 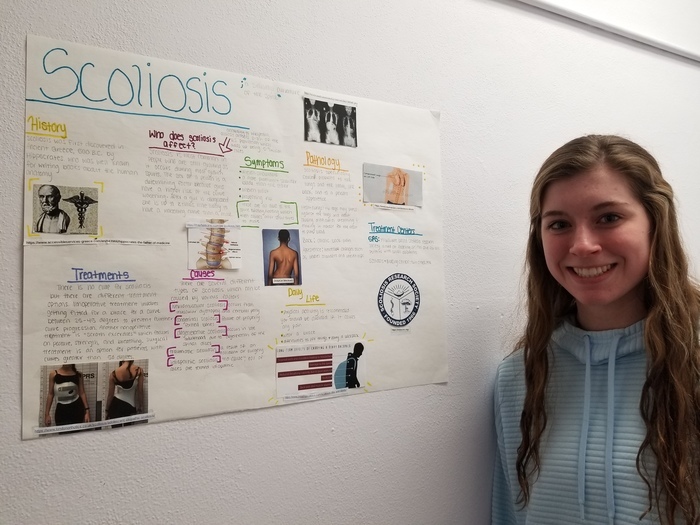 Pictured is senior Toni Alesch with her informative poster on Scoliosis. 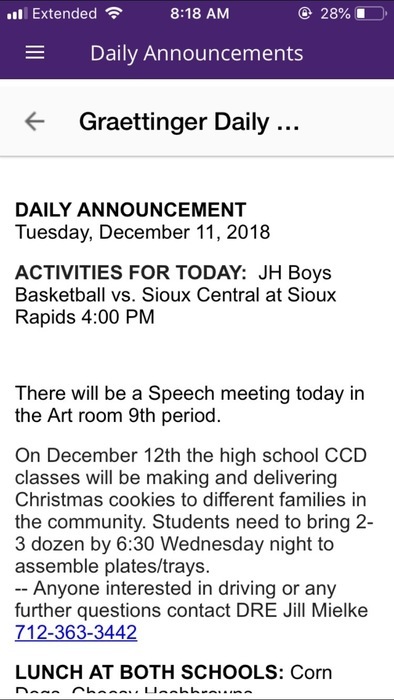 The Sioux Central FFA Alumni have asked that we pass along some information. 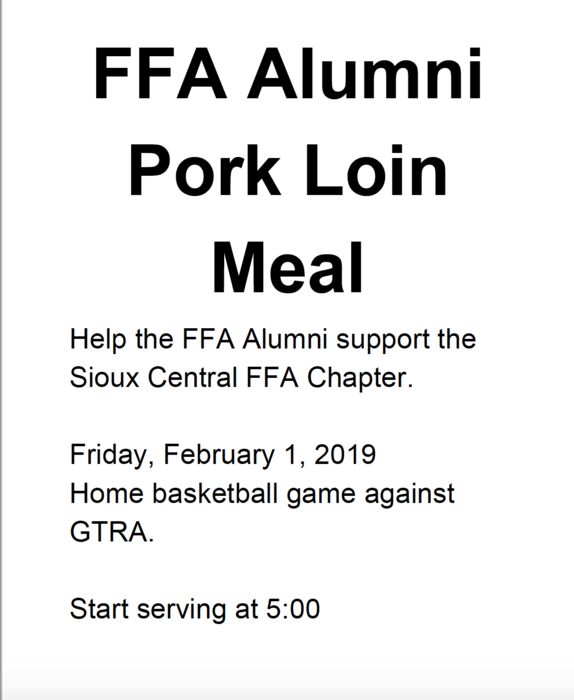 There will be a Pork Loin Meal available at Friday Nights Basketball Game. 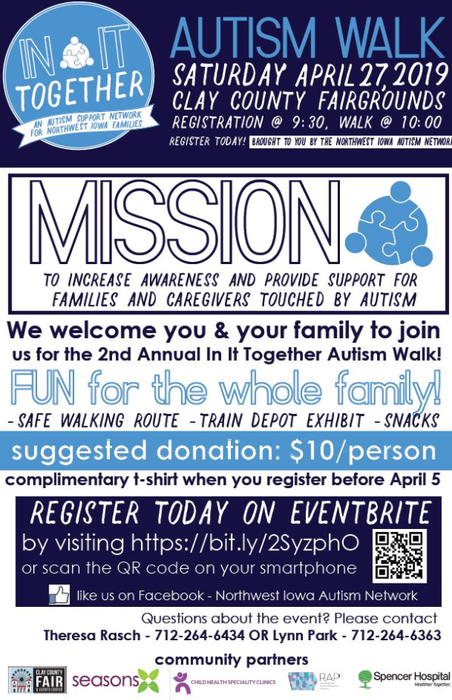 Please see the flyer for more information. G-T will have a 2-Hour Late Start on Thursday, January 31. No School at G-T on Tuesday, 1/29 and Wednesday, 1/30 due to the extreme wind chills. All Junior High activities have been cancelled for this afternoon. Graettinger-Terril CSD will start two hours late tomorrow, Monday, January 28th. Water Emergency has been reinstated for the City of Graettinger. Water off east of tracks everyone else please conserve. Water is back on in Graettinger. Boil advisory east side of tracks until further notice. Today (Sunday) The city of Graettinger is in a water emergency. EVERYBODY must conserve water. Water will be shut off east side of the railroad tracks. There will be a water boil to follow. As we get more information, we will post it. 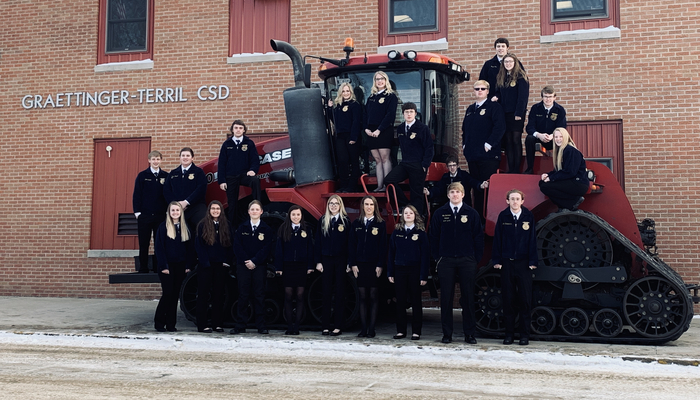 Today was an exciting day as the FFA chapter posed in front of the school for this years chapter photos! Students braved the freezing temperatures to get some great shots! 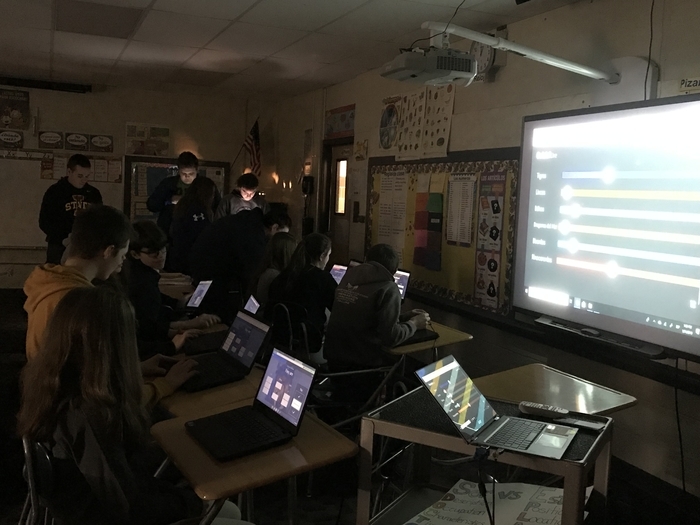 Freshman Geography students integrating technology into their lessons by engaging in a Quizlet Live review game. 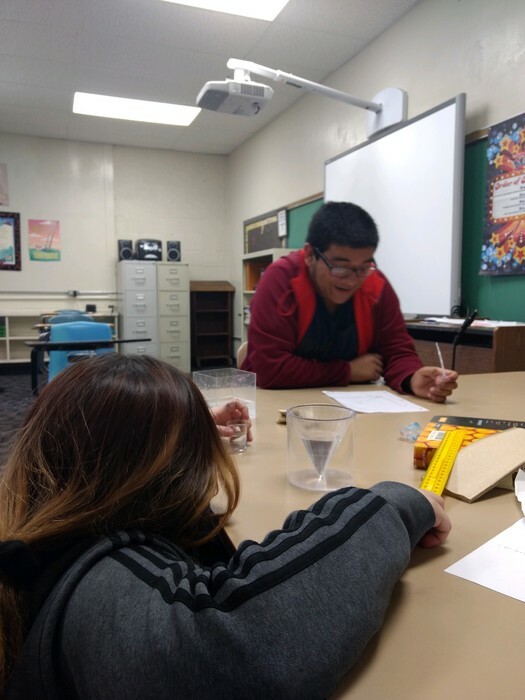 Students said, "We are paired in groups which can help you decide which is the best answer." and, "Over time the more answers we get right the easier it gets." 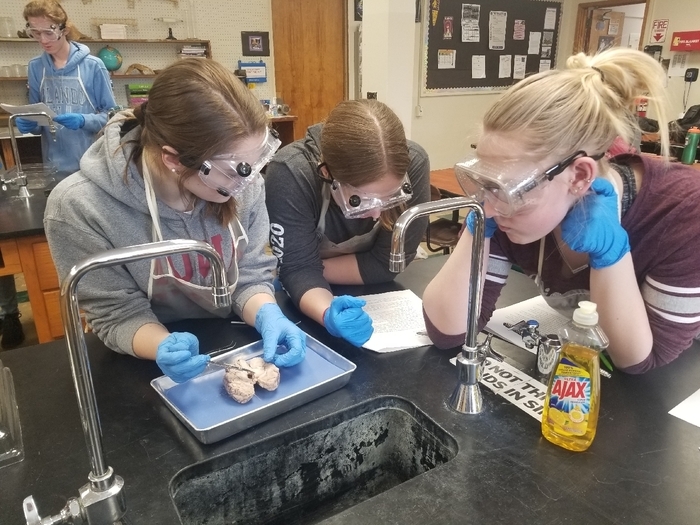 8th graders in Mrs. Jungers' ELA class are learning about human intelligence. 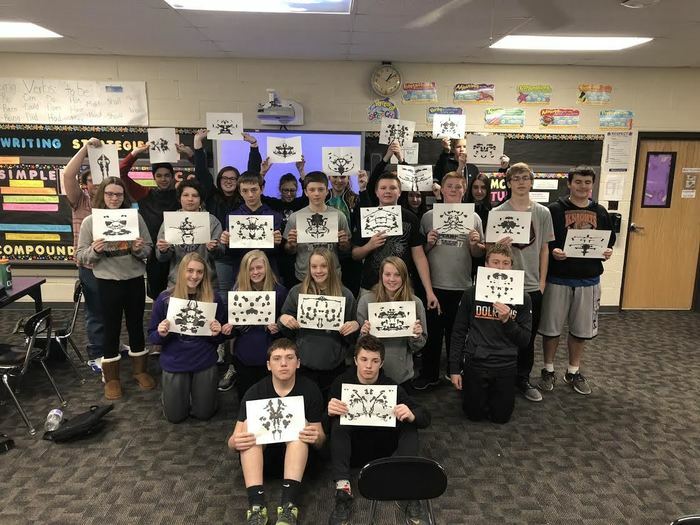 Students learned about the Rorschach test which allows individuals to look at ink blots and discuss what they see. The students made their own and shared their theories on what images they saw. 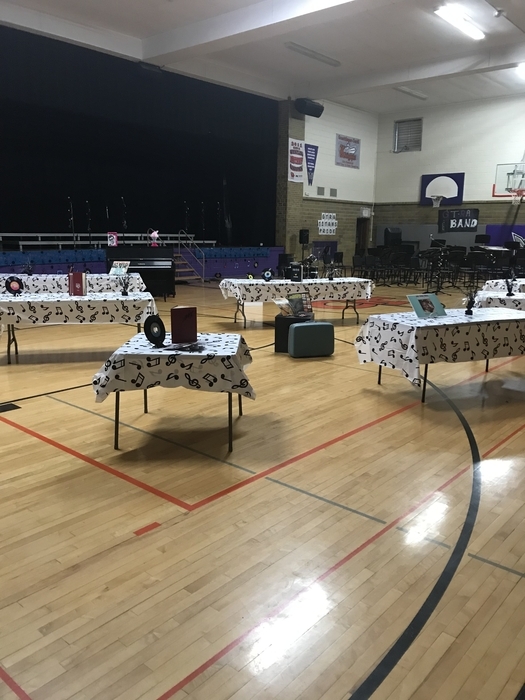 Check out the GTRA Music Boosters’ cake auction during tonight’s varsity basketball games in Graettinger. Be sure you have the winning bid to take home some of these delicious cakes, cookies, or other goodies! The winners will be announced during half time of the boys’ varsity game. Thank you for your support of GTRA Music Boosters! 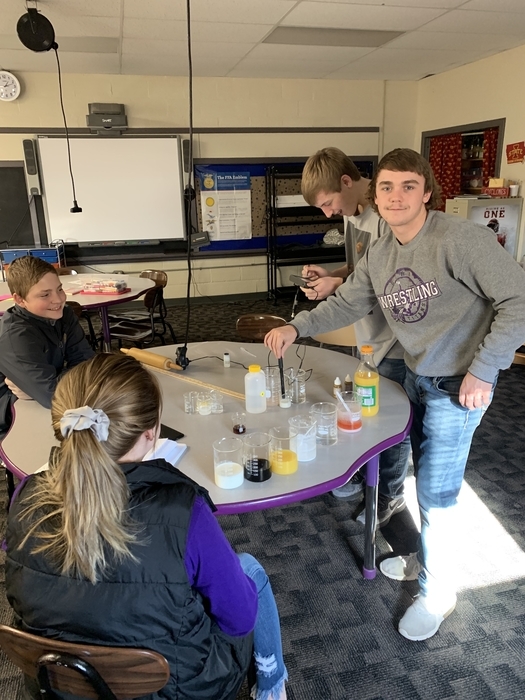 AFNR (Ag, Food, and Natural Resources) students worked to complete a pH lab today. 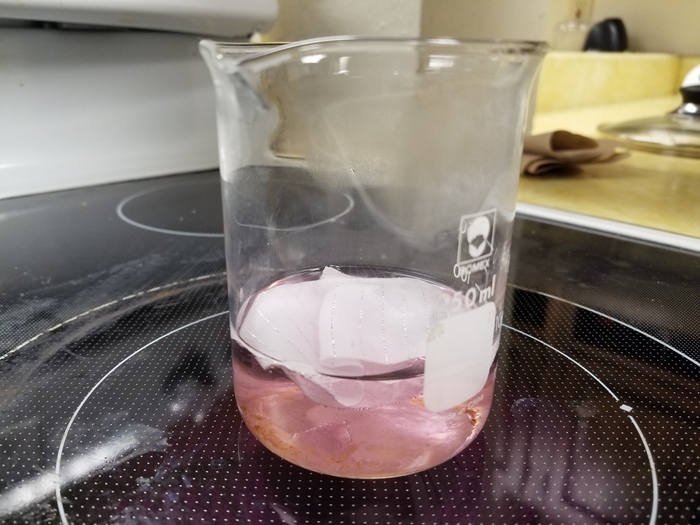 Students tested various substances for acidity, then neutralized the substances using Sodium Hydroxide and Hydrochloric Acid accordingly. 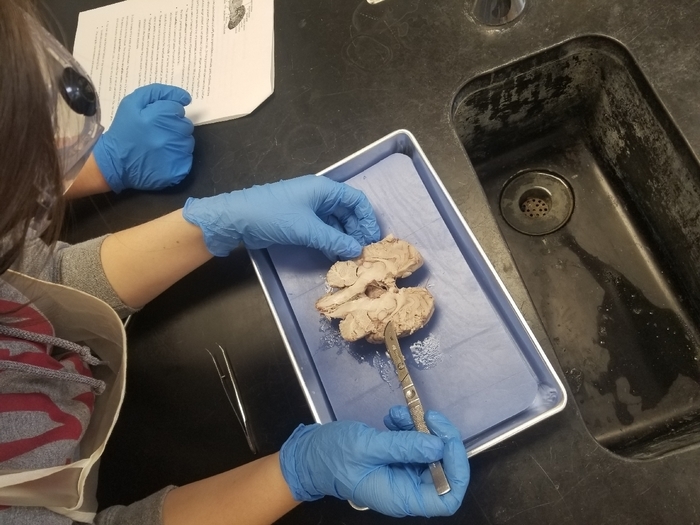 Today in our Unified Science class, students played a game called "Oh, Deer!" 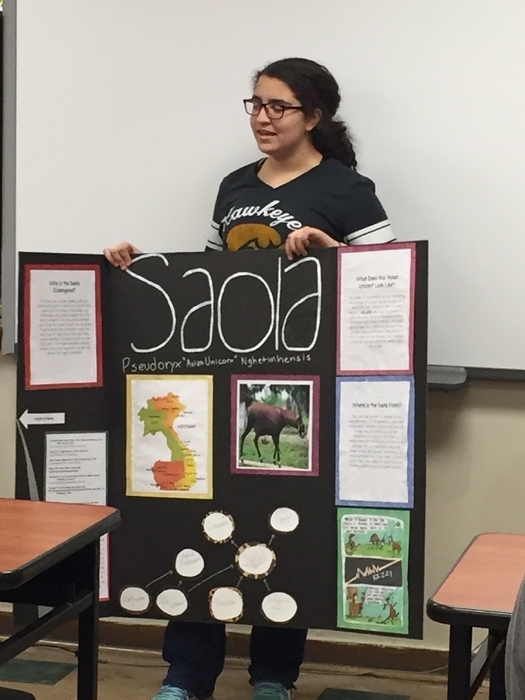 in which "deer" competed for "resources" to demonstrate population dynamics. The GTRA Wrestling meet tonight with Manson has been cancelled due to illnesses. 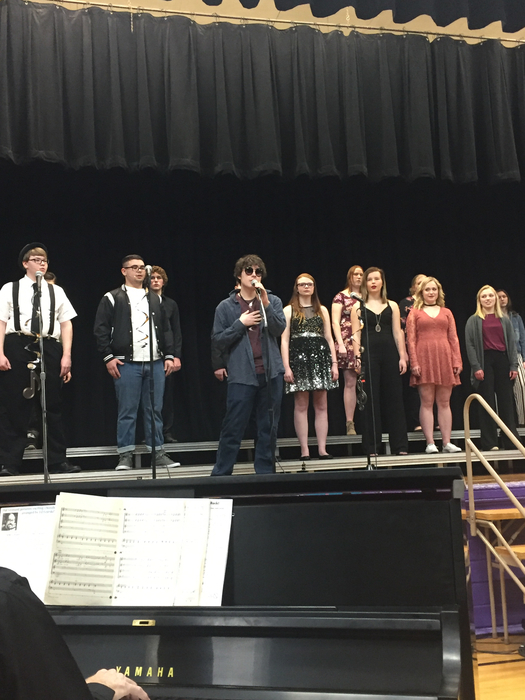 On Tuesday the middle school Show choir performed and on Wednesday it was the High School Jazz Choirs turn to perform. Here are some pictures from their performance at the ILCC Jazz/Show Choir Festival. 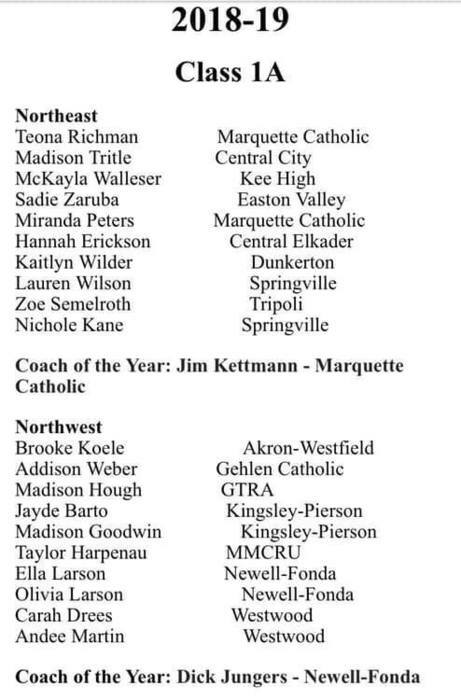 Way to represent G-T/R-A!! 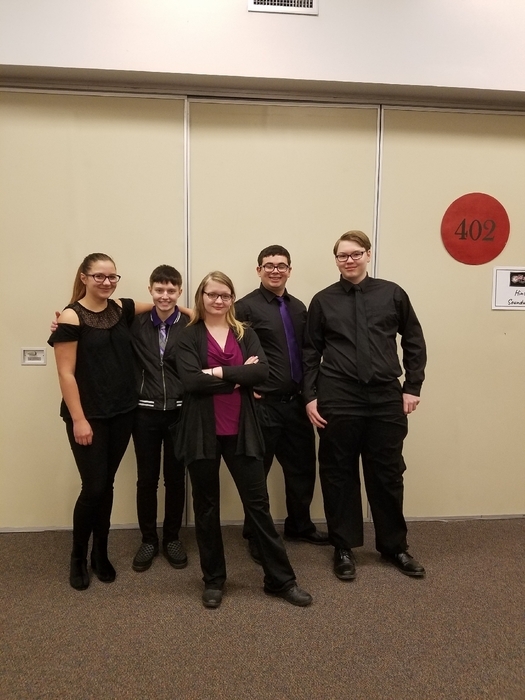 Some of our G-T Middle School Students participated in the Iowa Lake Community College Jazz/Show Choir Festival yesterday. 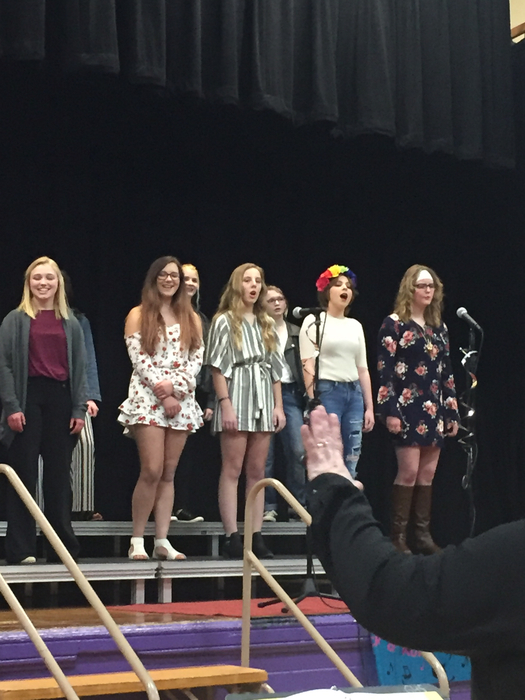 This is an educational festival in which area show and jazz choirs perform and receive feedback from experienced clinicians in preparation for the show/jazz choir season. Here are a few pictures from their performance! 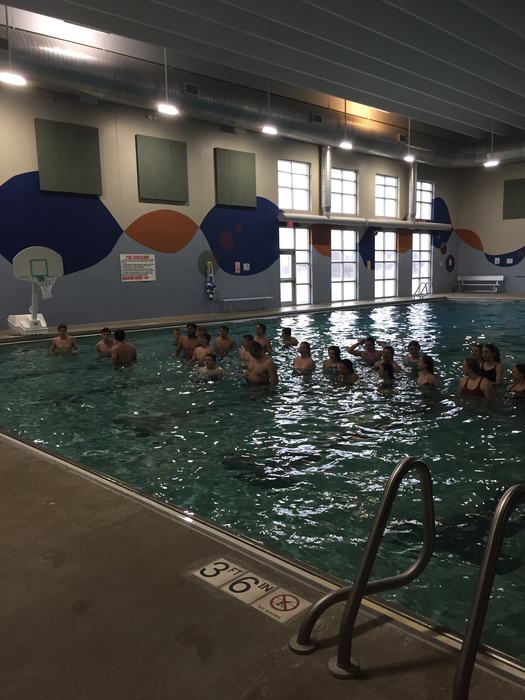 The GTRA FFA chapter enjoyed attending the NW District fun night at the Spencer YMCA last Monday. 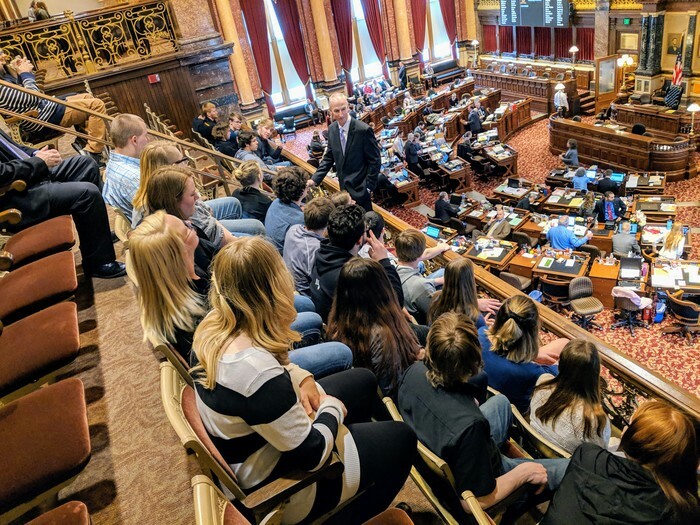 The event was hosted by the NW district FFA officer team, lead by 2017 GTRA graduate and current Iowa FFA NW State Vice President, Cole Reiman. 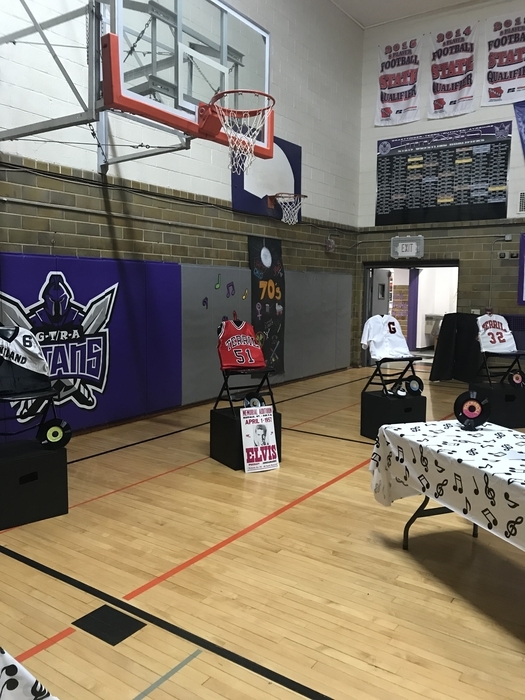 While at the event, students participated in a dress up contest, dodge ball, and completed escape room challenge. 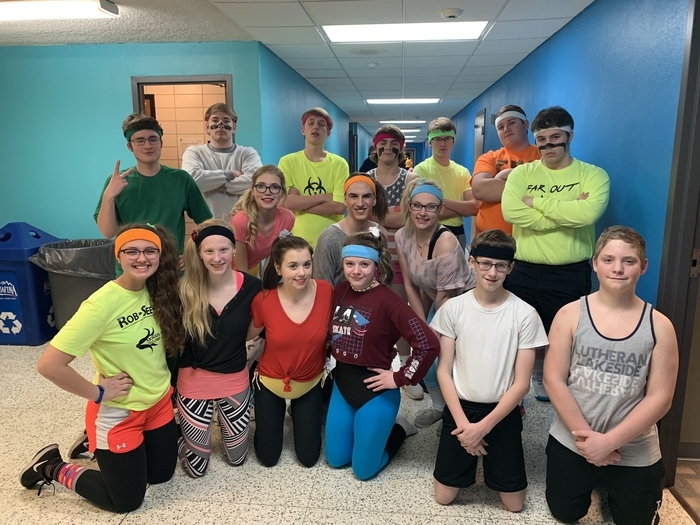 GTRA FFA members are pictured working through their escape room, dressed in 90’s workout gear, and with their championship dodgeball belt! There will be no school at G-T/R-A tomorrow, Friday, January 18 due to the impending snow. 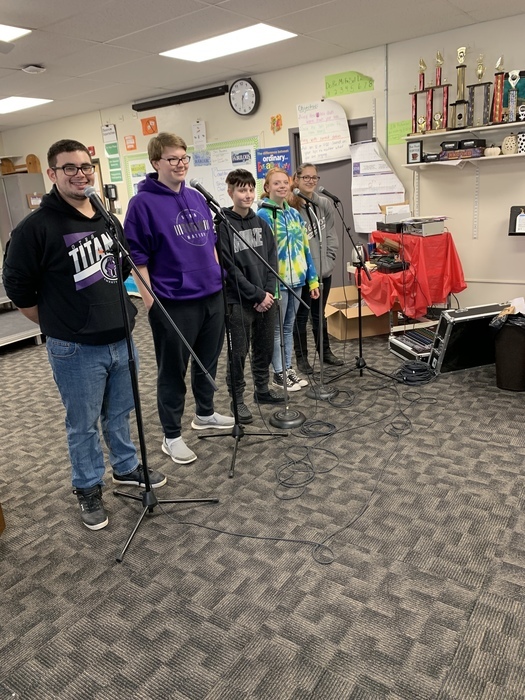 Check out our HS Jazz Choir breaking in some new microphones!! 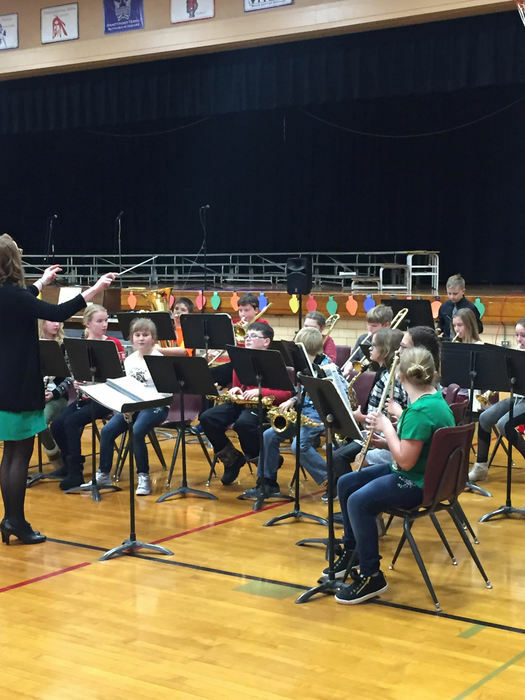 Thank you, Graettinger-Terril School Board for supporting our fine arts departments!! 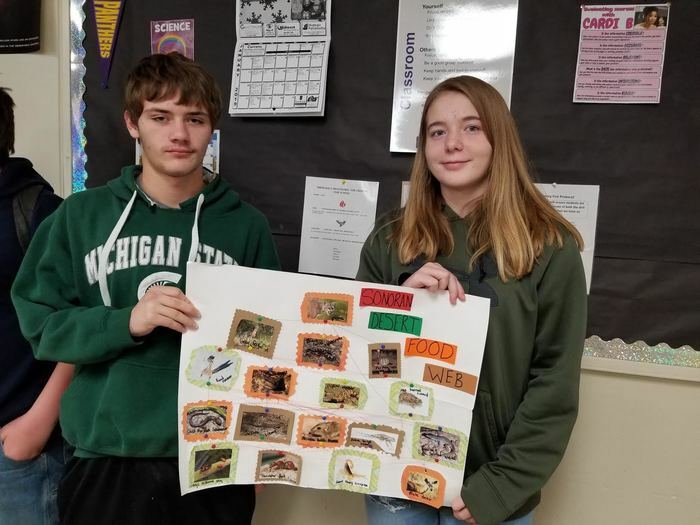 Student in Biology are working on food webs for their ecology unit. 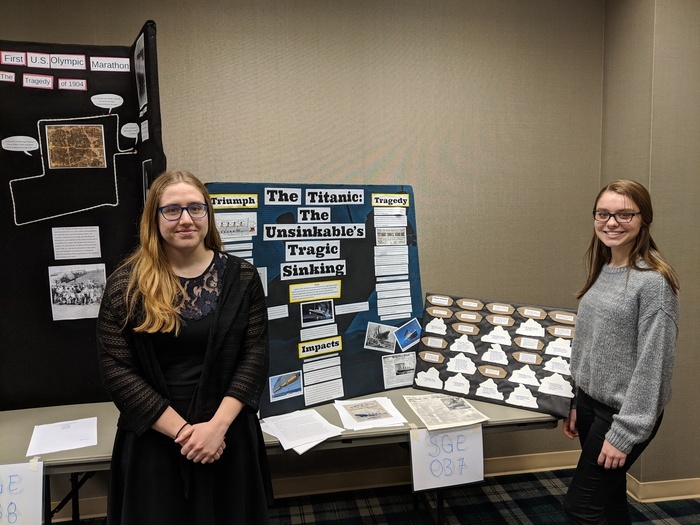 Here are Mercedes DePyper and Braden Brown showing off their display. Due to a sewer issue in Terril, the Elementary will be letting out at 11:00 with buses transporting. The HS and MS will continue with a regular day. 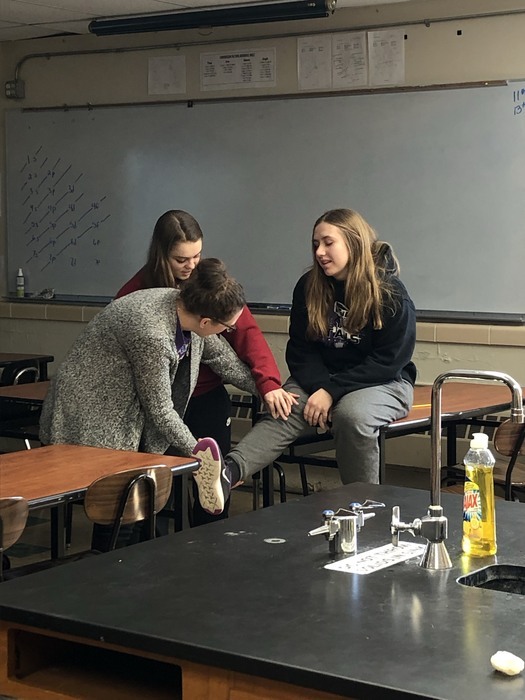 Auditions for the GT high school play, "Antisocial" will be held Monday, Jan. 21 and Thursday, Jan. 24 at 6:30 in the Graettinger vocal music room. You can email Mr. Benedict for a script. If you are an RA student and think you will need a shuttle ride, please let me know ASAP. 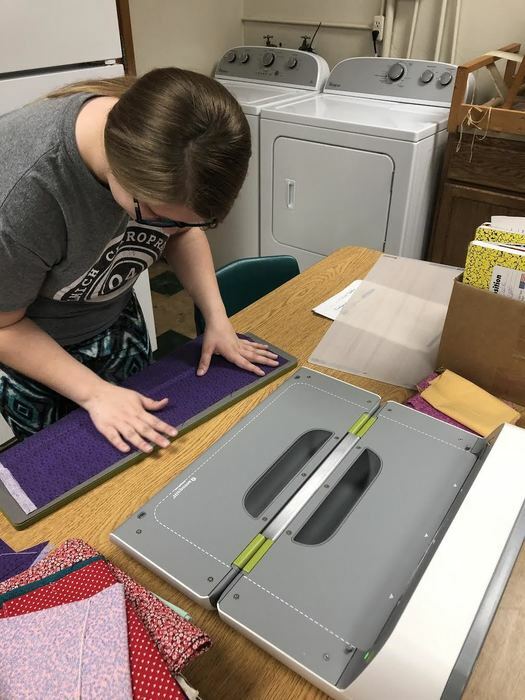 After practicing piece cutting with templates, a rotary cutter and mat, students are now utilizing available technology to cut fabric strips for us in our Sewing and Textiles class! 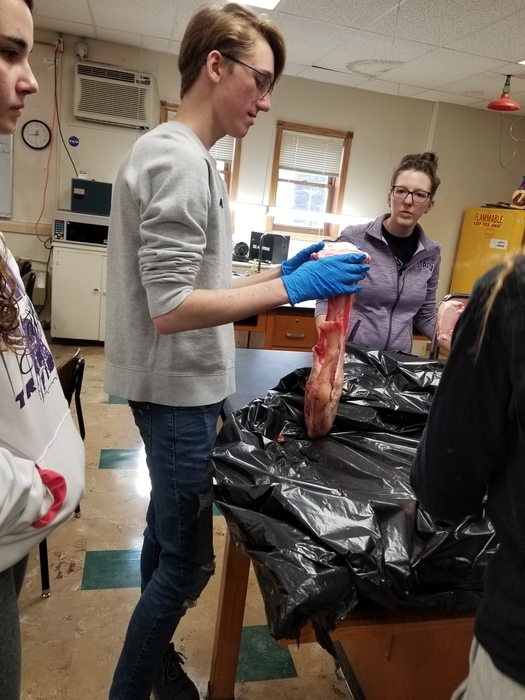 Students in our Anatomy and Physiology class looked at various leg bones last Friday. 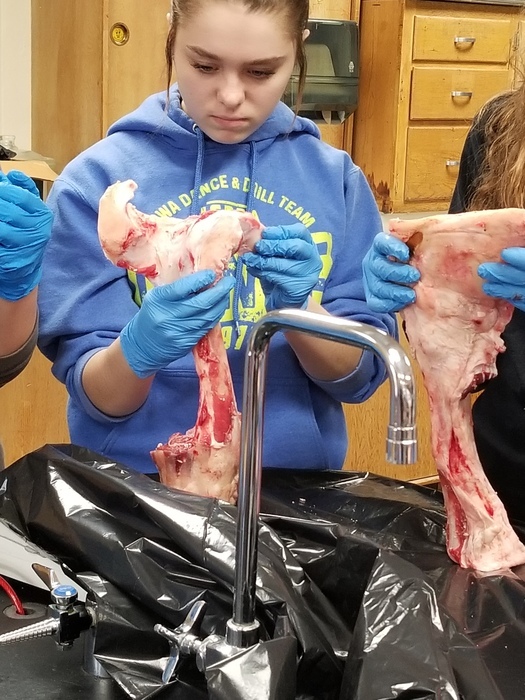 Students were able to see the red and yellow marrow, ligaments, tendons, vessels, sockets, and other structures associated with bones that they have been learning about in class. We are working on getting the word out about our new app. 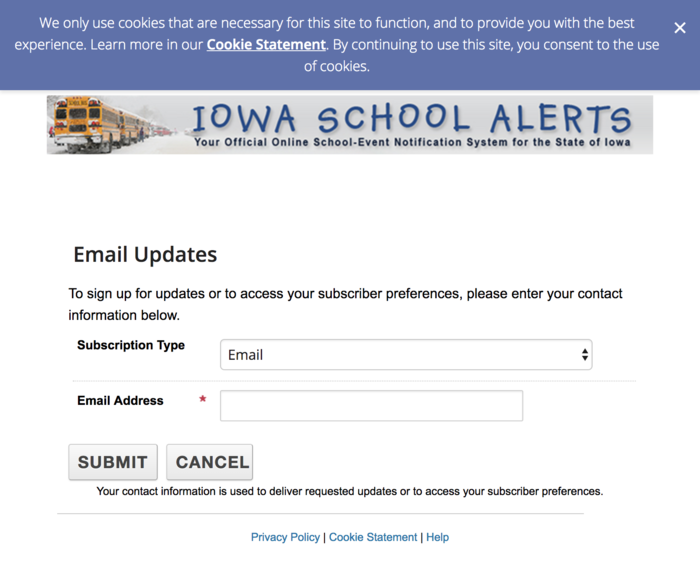 This is a FREE way for you to get information about what is happening at school! All you have to do is download the app from your smart phone app store! The G-T/R-A wrestling team brought home new hardware for the trophy case last night! 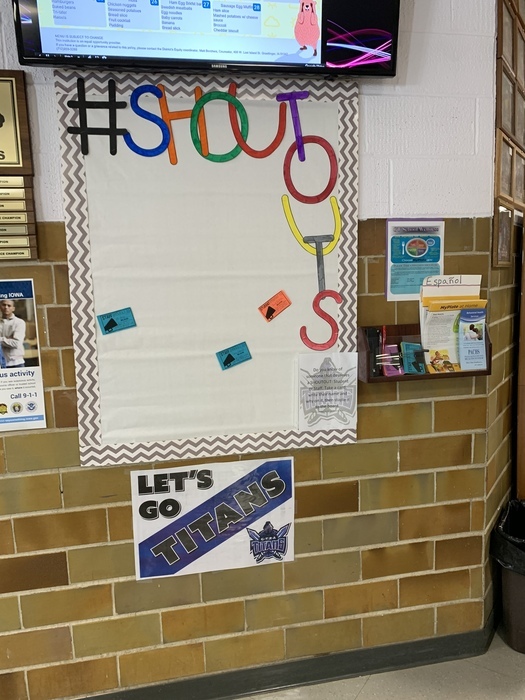 Way to go Titans! 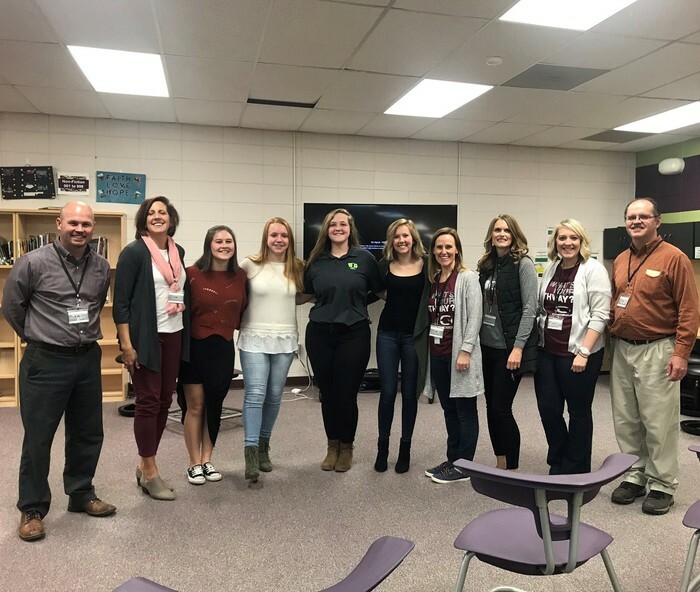 Representatives from GT/RA, Okoboji and Spencer met for the first planning meeting to prepare for the launch of the No Boundaries Project in the fall of 2019. We are very excited to be able to offer a new learning opportunity to students! 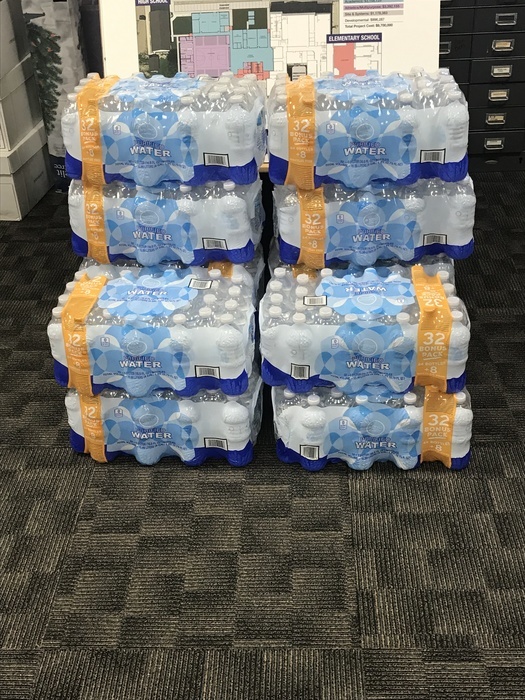 Thank you, Matt Buss and Emmetsburg Shopko for donating 12 cases of water to use over the next 1-2 days of school. 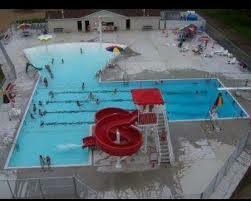 Due to the water leak, we must wait for the City of Graettinger (Who are also amazing) to test the water safety. Thank you both for your support of G-T Schools! 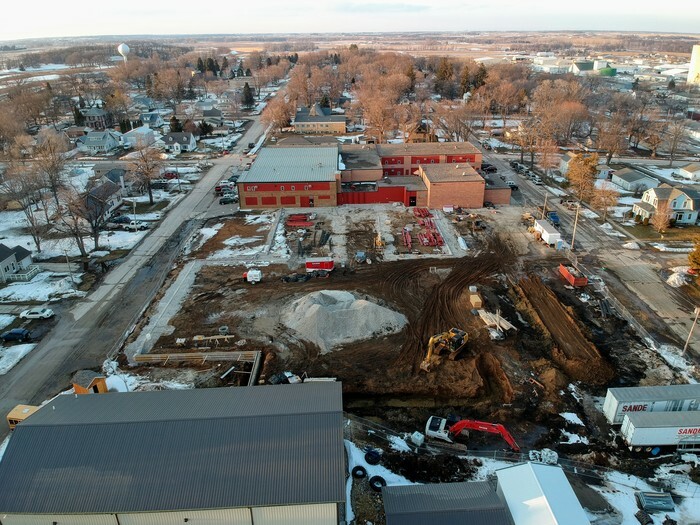 There has been another waterline break at the MS/HS in Graettinger - There will be NO SCHOOL at the MS/HS today (12/19) Elementary will still have a normal day with normal dismissal time. Students please check your emails for updates throughout the day. 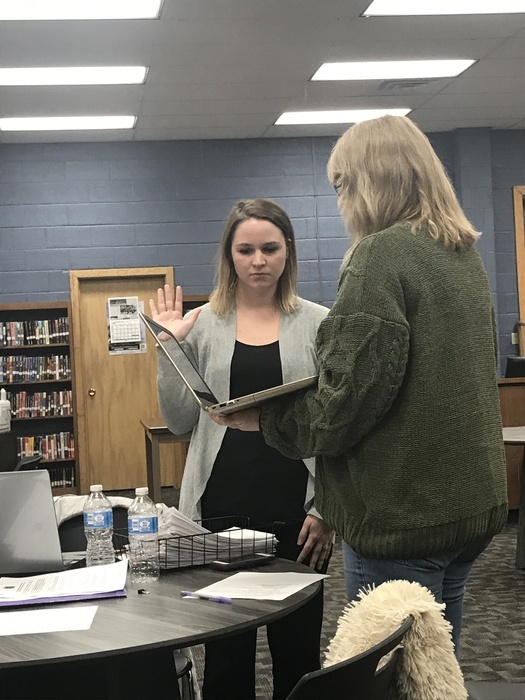 Congratulations to Alyssa Enderson who was sworn in tonight as Graettinger-Terril CSD Board Treasurer. 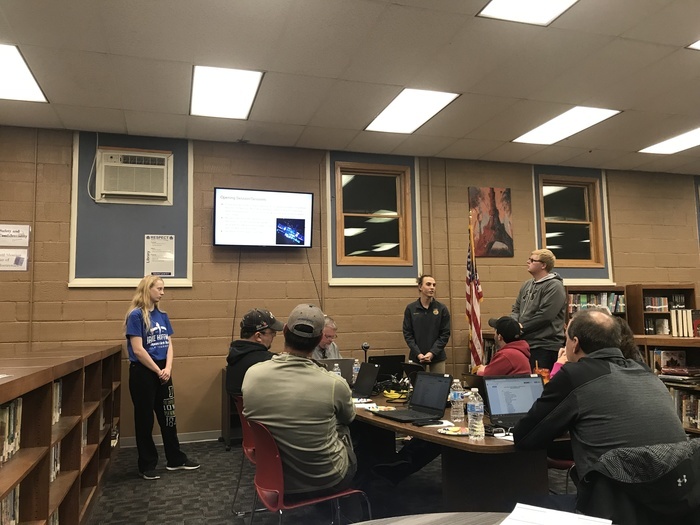 Members of the G-T/R-A did a wonderful job presenting to the G-T school board tonight, providing information about their trip to the FFA National Convention & Expo. 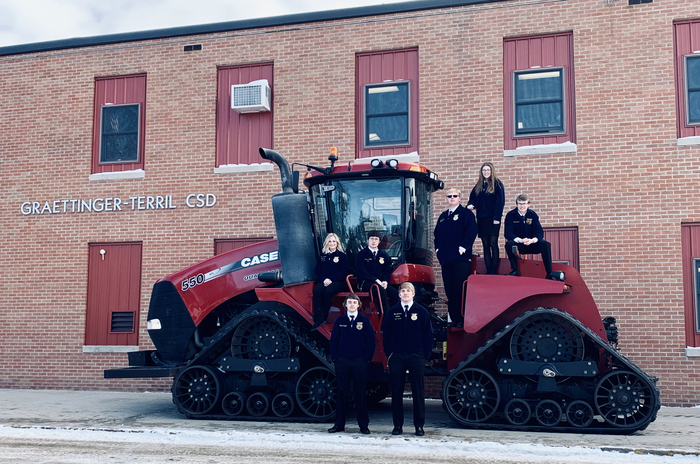 G-T/R-A FFA sent 13 students to National Convention this past year. 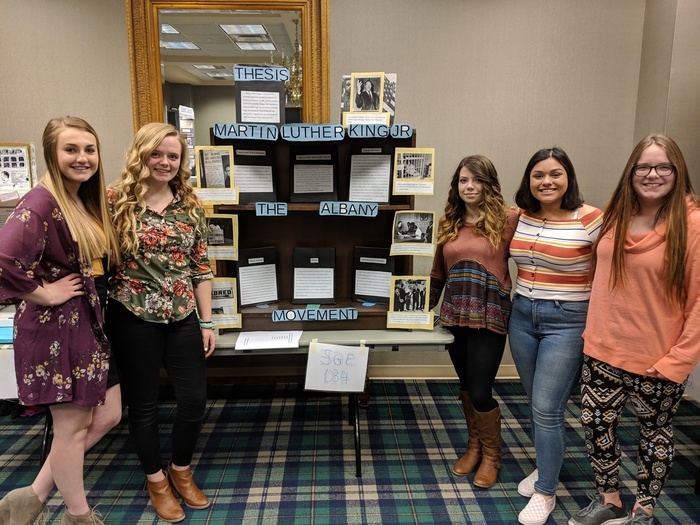 National Convention is a place where FFA members nationwide converge in one place to celebrate their accomplishments and find inspiration for their next steps! 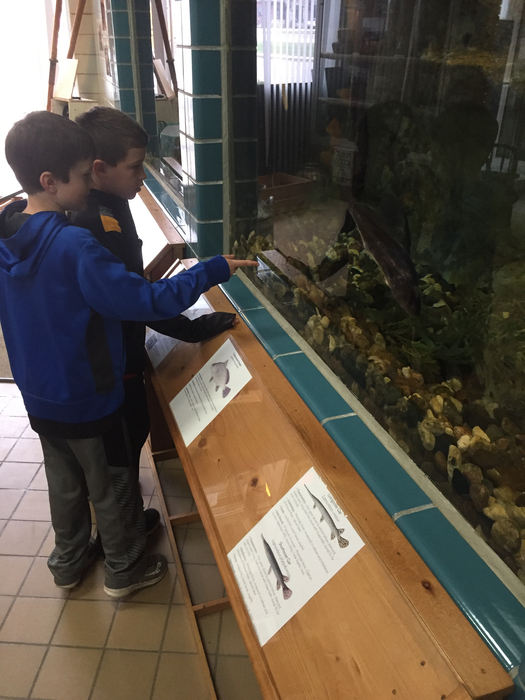 The middle school PBIS trip is going great!! 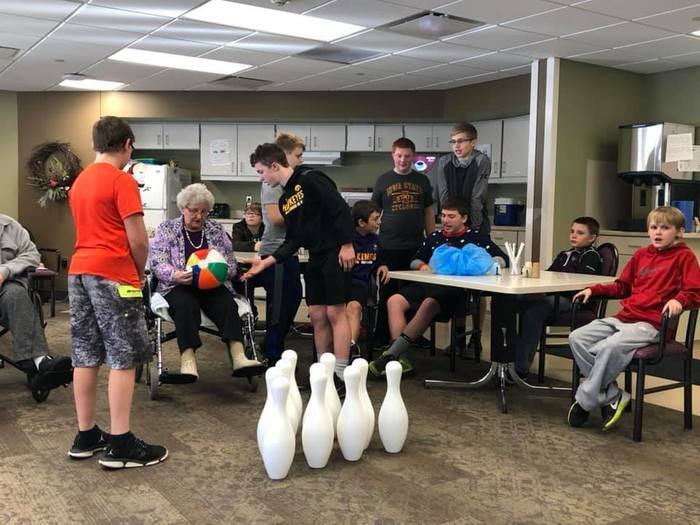 Students spent time visiting with residents at Parc Hall and the Emmetsburg Care Center and are now having a blast at the Wellness Center! 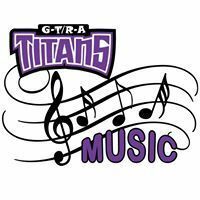 G-T/R-A Titan High School Music Program and Graettinger-Terril 6-8 Music Program will be performing tonight starting at 7:00 PM. Please join us for what are sure to be wonderful musical performances. Looking for that last minute stocking stuffer? We still have a few Titan Popsockets left for sale. 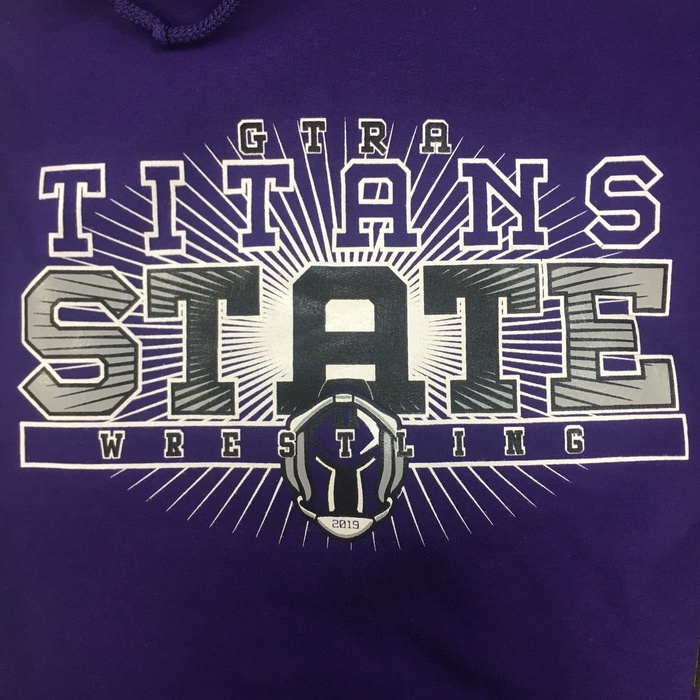 All proceeds go to the G-T/R-A Titan Golf teams! 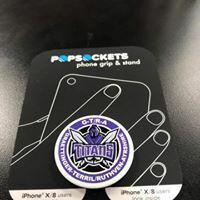 You can pick up your limited edition Titan Popsocket at the G-T high school office or Graettinger Chiropractic! $10 Per Pop-socket. First day of Bigs/Littles in our middle school! 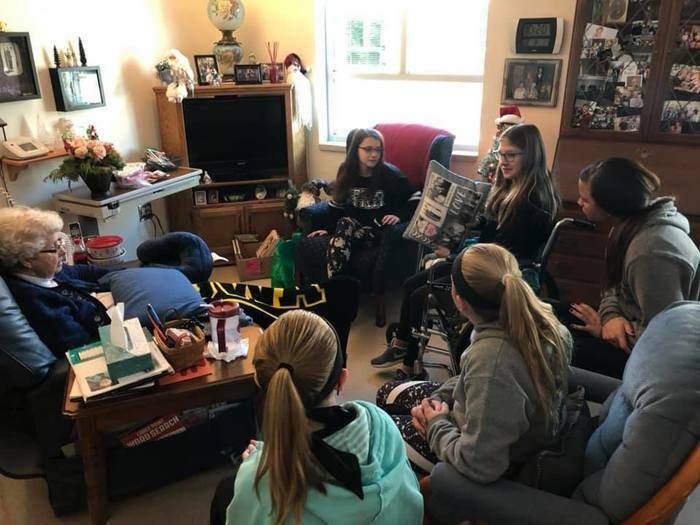 We have paired up our 8th and 6th grade girls for peer mentoring and are starting out with fun ice breakers to get to know each other, followed by building up confidence, communication skills and resilience throughout the year! 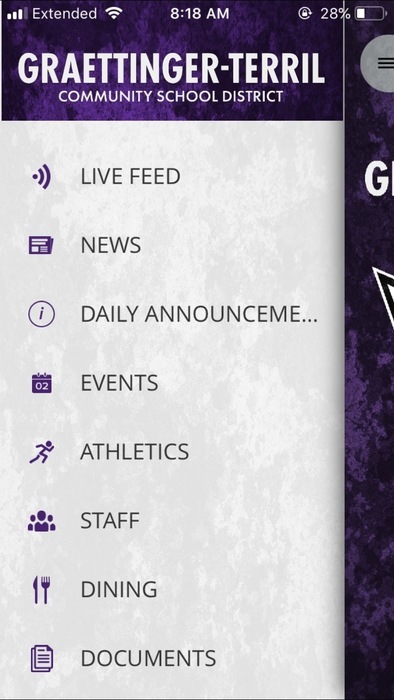 We now have a link to the G-T daily announcements on the app! We will continue to send out the announcements daily. 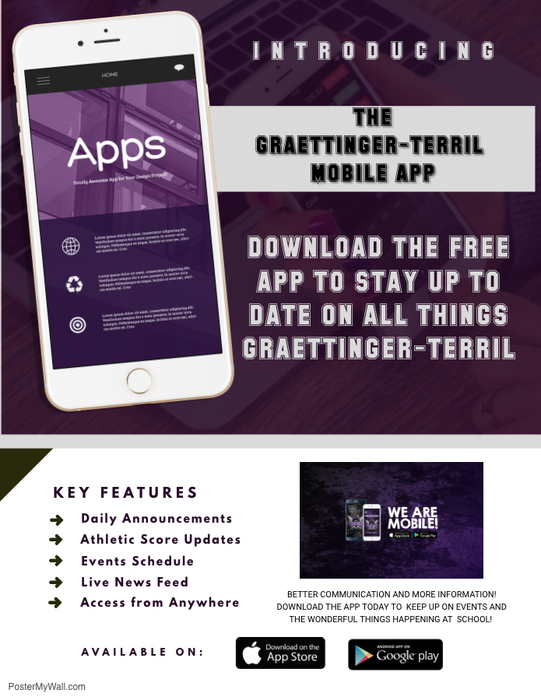 This is just another way that you can easily access the daily activities at Graettinger-Terril! When you're driving around Iowa,Minnesota, and South Dakota keep your eyes peeled for this Ronald McDonald House of Rochester, Minnesota truck trailer. 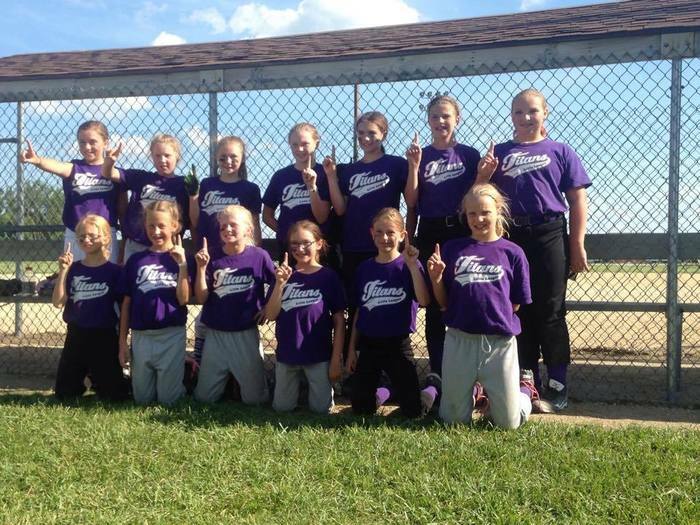 Our very own 6th grader Hailey Schnell is in the image on the far left of the trailer! 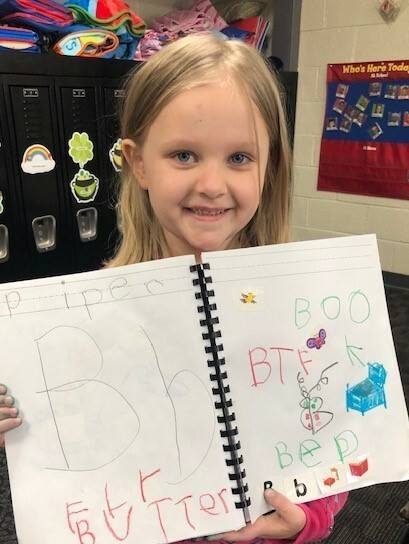 Thank you, Hailey, for sharing the image! 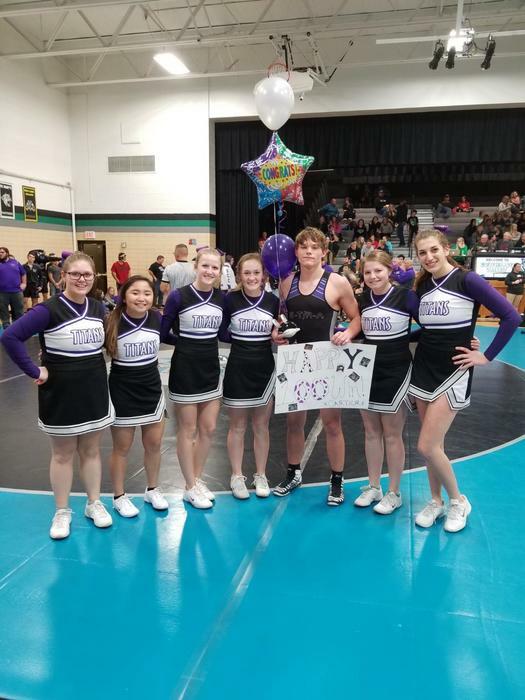 Congratulations to Carter Murray who achieved his 100th win last night! 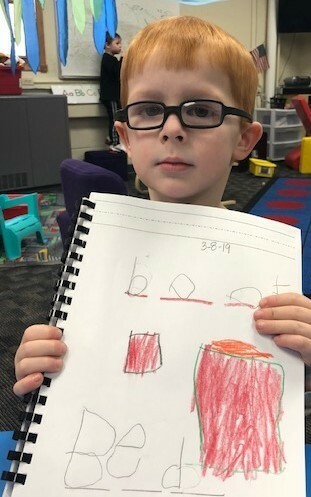 Way to go, Carter!!! 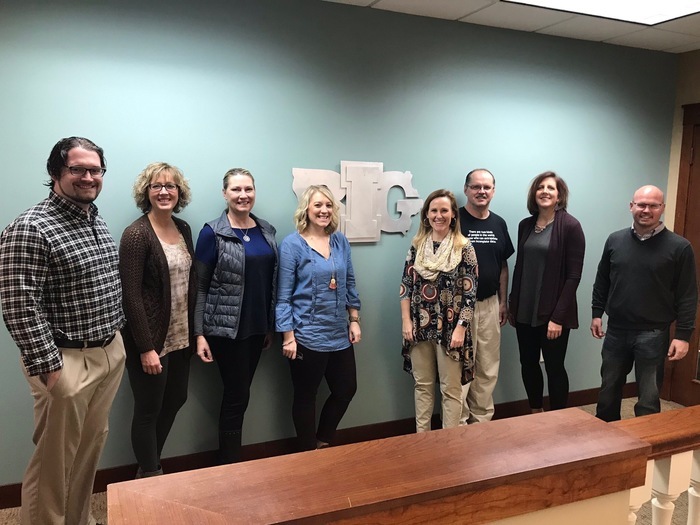 Staff from GT/RA, Okoboji and Spencer are attending Immersion Training at the Iowa BIG school in Cedar Rapids. This new learning will help all three districts to work together to implement the innovative, learner-centered model with their students. 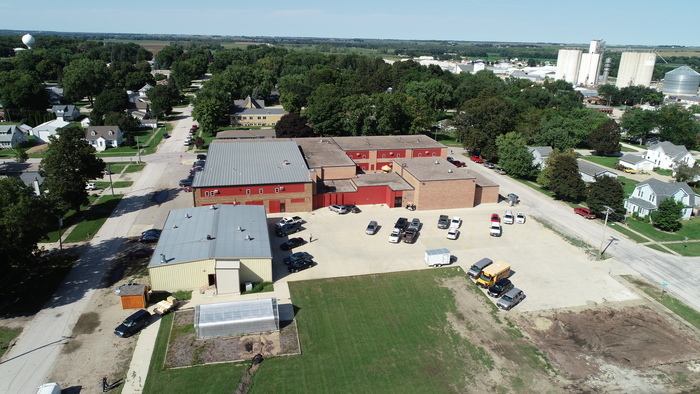 The Graettinger City did get the water break fixed at the Graettinger Building, so we will have school tomorrow, Wednesday, Dec. 5. We cannot drink the water from the drinking fountains until it is tested. We should find out in the afternoon, but we are asking parents to send a water bottle with your child. Due to a water main break Graettinger MS/HS will be dismissing at 2:15. 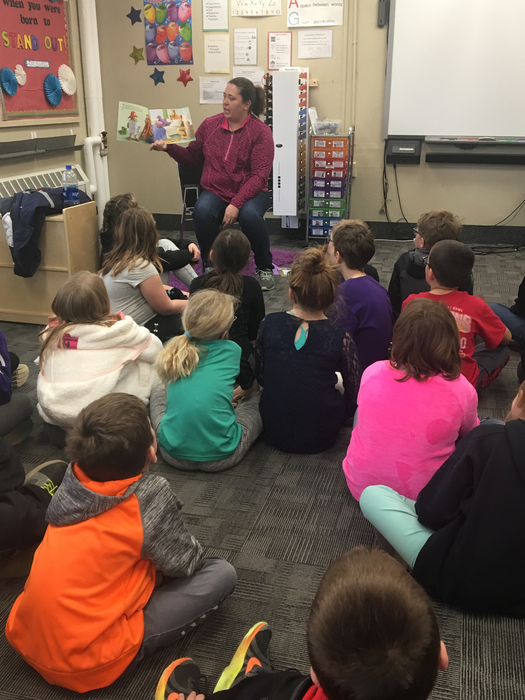 Elementary will dismiss at normal time. 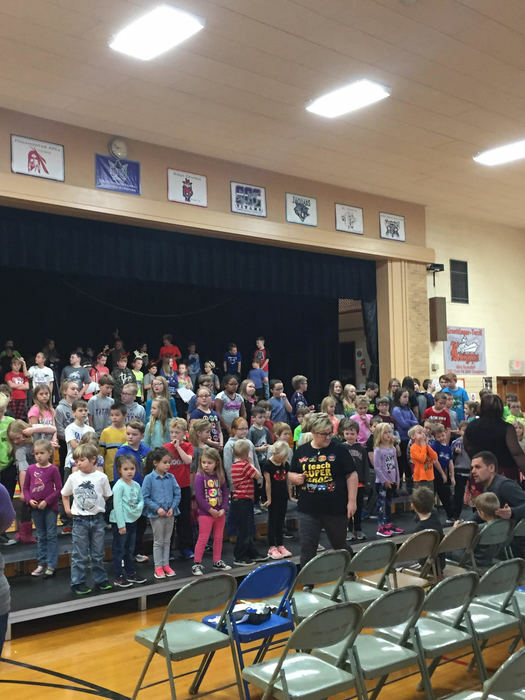 Last night's Elementary Concert was a packed house. 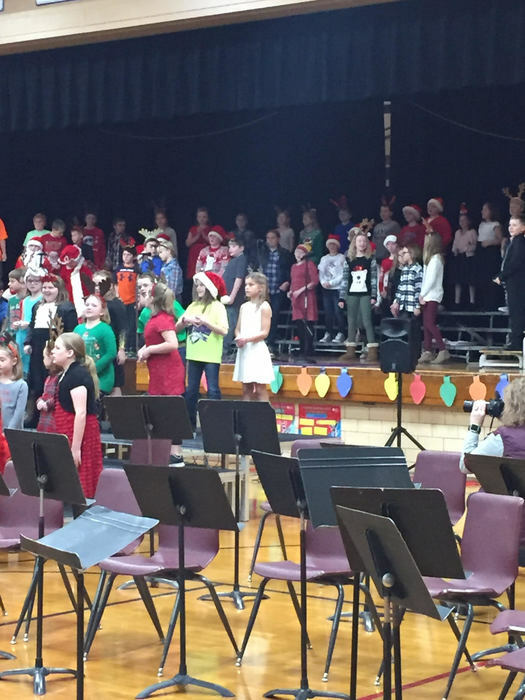 The 5th grade band performed and the students sang their hearts out. It was an awesome concert! 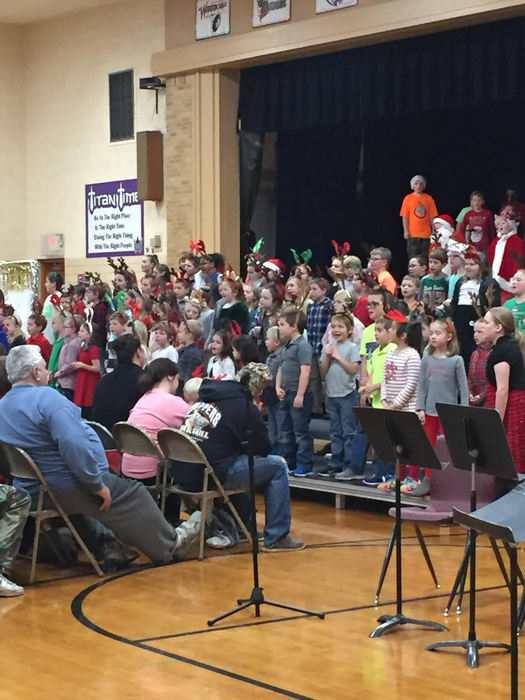 Tonight is the Elementary Christmas Concert at 7 PM in Terril. The Scholastic Book Fair will be open before and after the Concert in the lunchroom! Middle school/High School Students, please check your school email for our morning schedule tomorrow. Seniors with open campus during both 1st and 2nd period need to report to school at 11:07 for lunch. Travel safe in the morning! 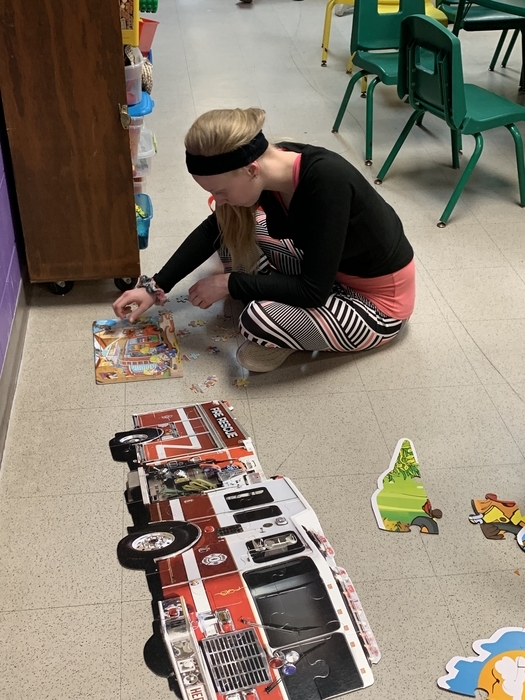 Graettinger-Terril CSD will be 2-hours late tomorrow, Monday, Dec. 3. It is a bit foggy out today but we wanted to show you the progress over the last week! 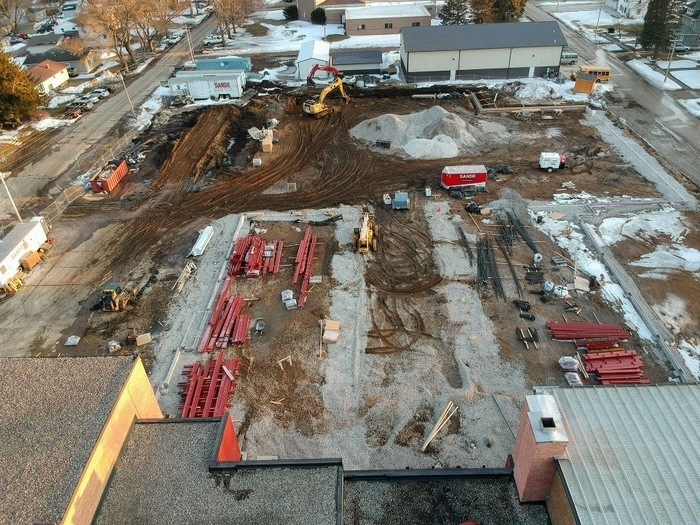 The old IT/AG building has been removed and the dirt work continues! 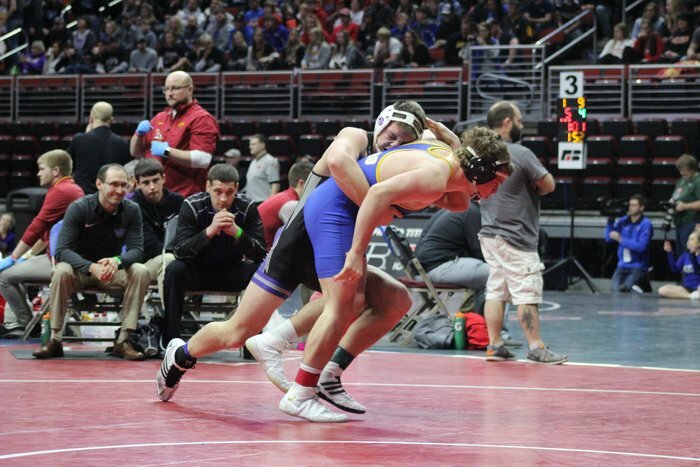 The Okoboji Wrestling Invitational at Milford Saturday( 12/1) has been cancelled. 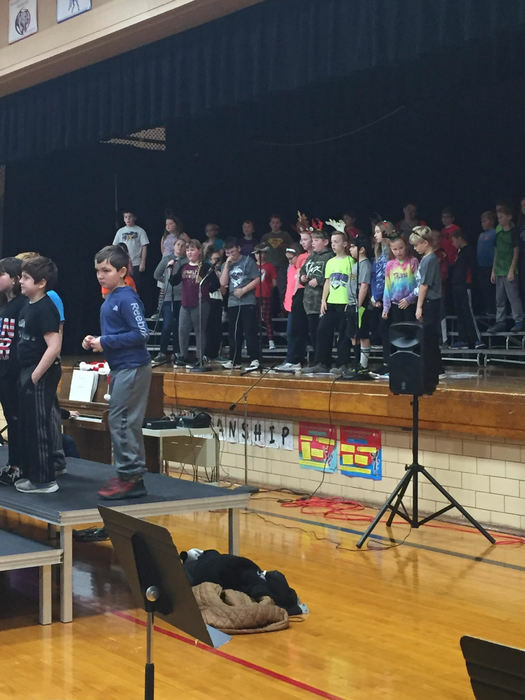 The Elementary Christmas Concert Practice takes many hands to organize and assist. 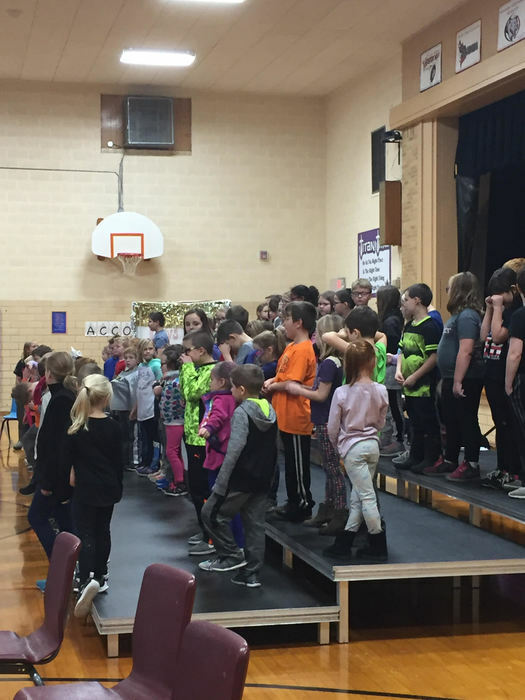 This morning, our practice went well and the kids look forward to the performance. The concert is Monday night, 3 December at 7:00 PM. We are mobile!! 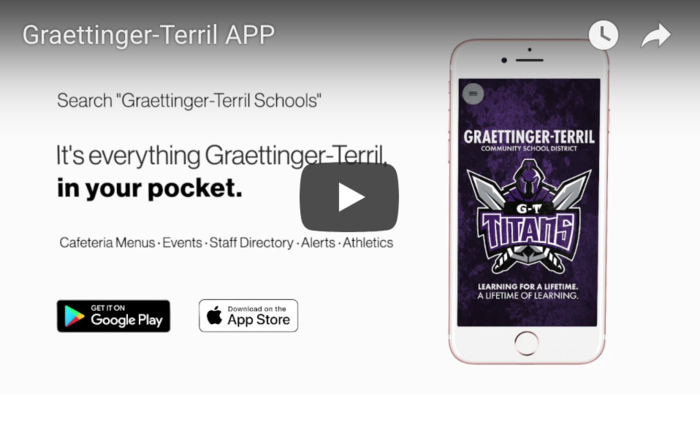 Graettinger-Terril CSD now has an easy to use app that you can download on your smart phone from your app store. We have also updated our website! 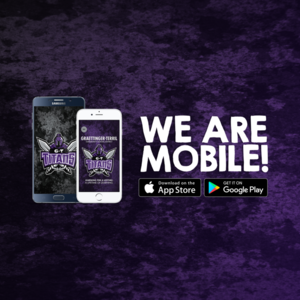 The app and website will be continually updated and a place where you can find all of your school related news! 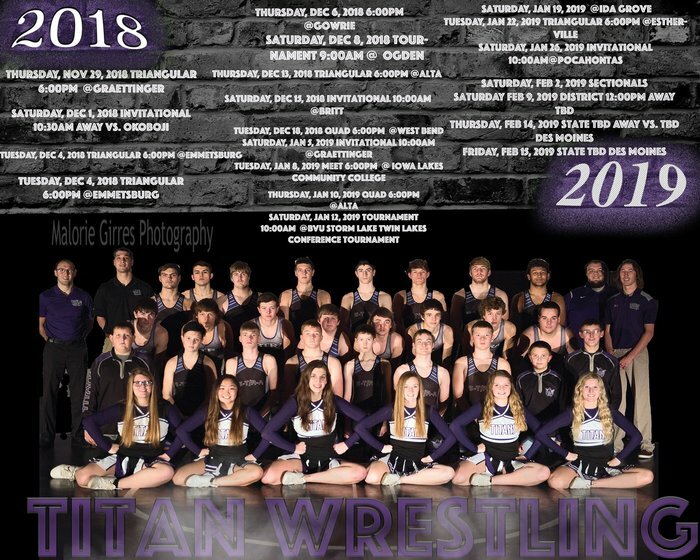 The 2018-2019 G-T/R-A Wrestling season will kick off tonight with a home triangular vs Okoboji and Spencer. 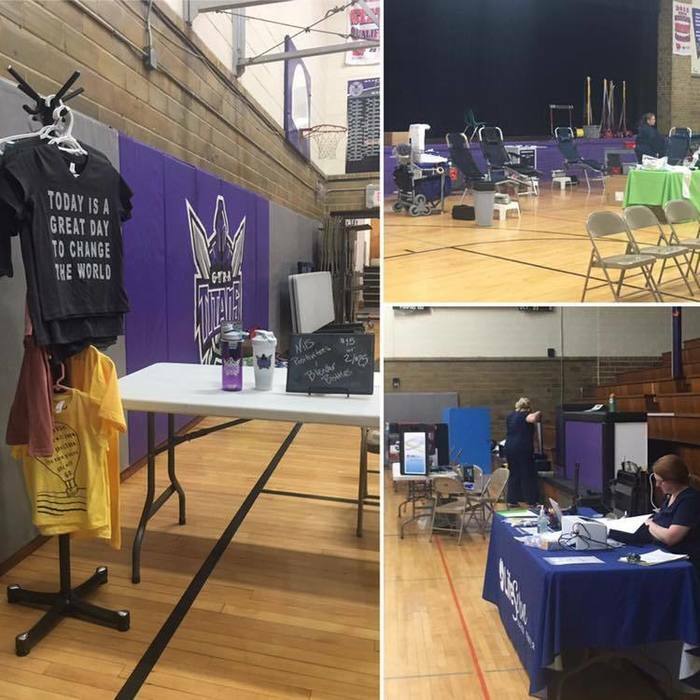 Please join us starting at 6:00 PM in the Graettinger Gym. Come hungry as the booster club will be serving pizza! 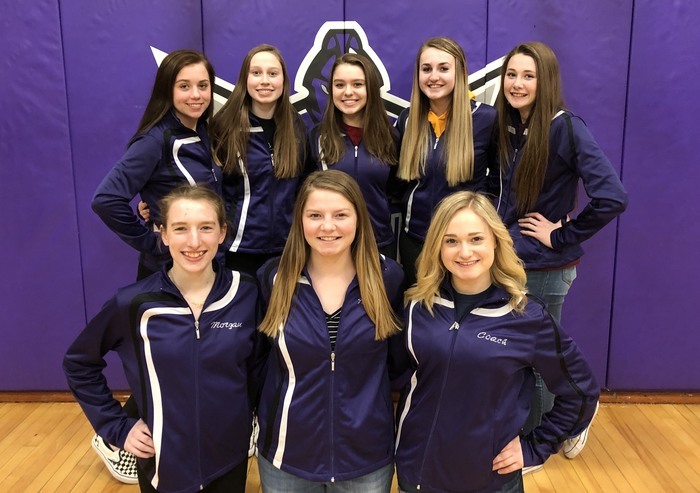 Good Luck to our Titan Dance Team as they will be performing at State Dance in Des Moines today! 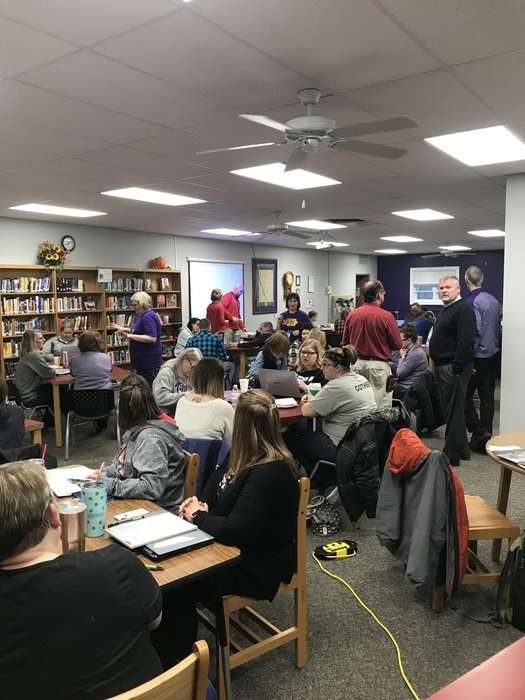 It is always great when we can get all staff together across all grade levels and districts for professional development! 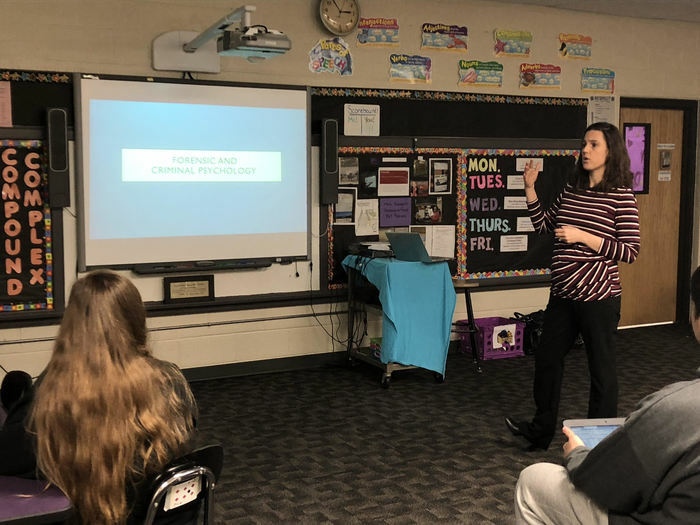 This morning teachers are learning about working with students who may have had adverse childhood experiences. What a great way to head into break! There will be no School Today 11.21.18. 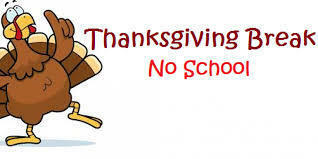 On behalf of Graettinger-Terril Community School District, we would like to wish you a wonderful Thanksgiving break! 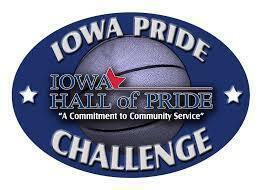 Boys BB Hall of Pride Scrimmage @ North Union starts at 6:00 PM with the JV. Admission is $3.00 or 2 canned good items for food bank. We had the pleasure of having State Representative from House District 02 Megan Jones stop by during our groundbreaking ceremony! 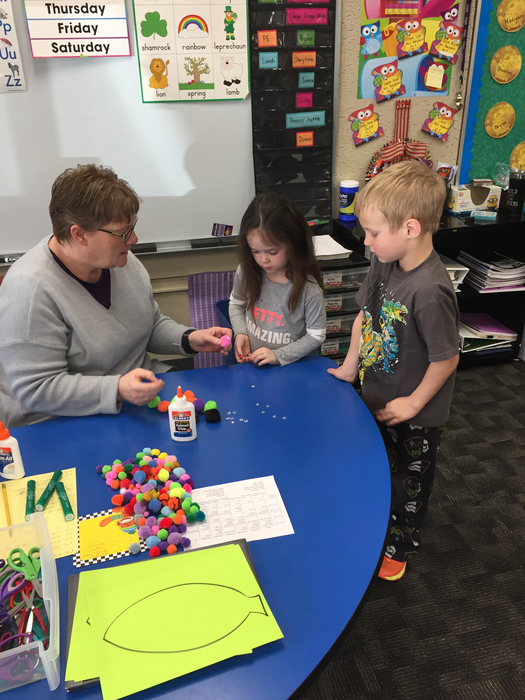 It was great having Mrs. Jones stop by and see the progress on our building project! We are taking pictures to show the progress that is being made with the building project! Here a few pictures that show the progress from the start until now! GT/RA will have Professional Development-APL Training on Thursday October 18th at 8:00am. 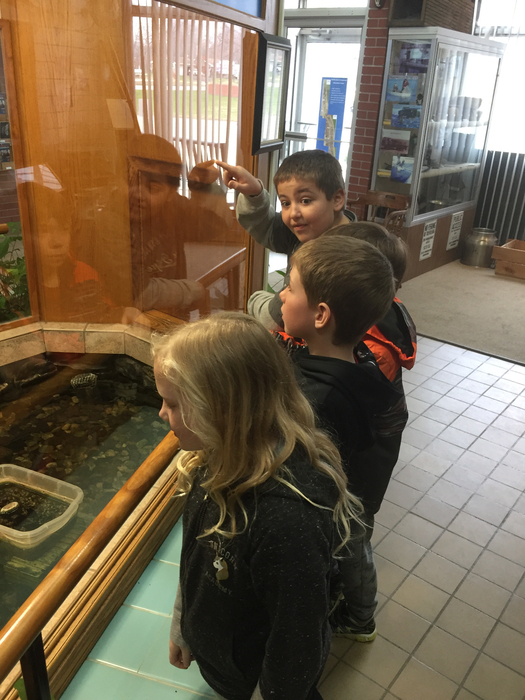 The Graettinger-Terril Community School District serving families in the Graettigner, Terril, Ruthven, Ayrshire and surrounding areas. Providing excellence in public PK-12 education.